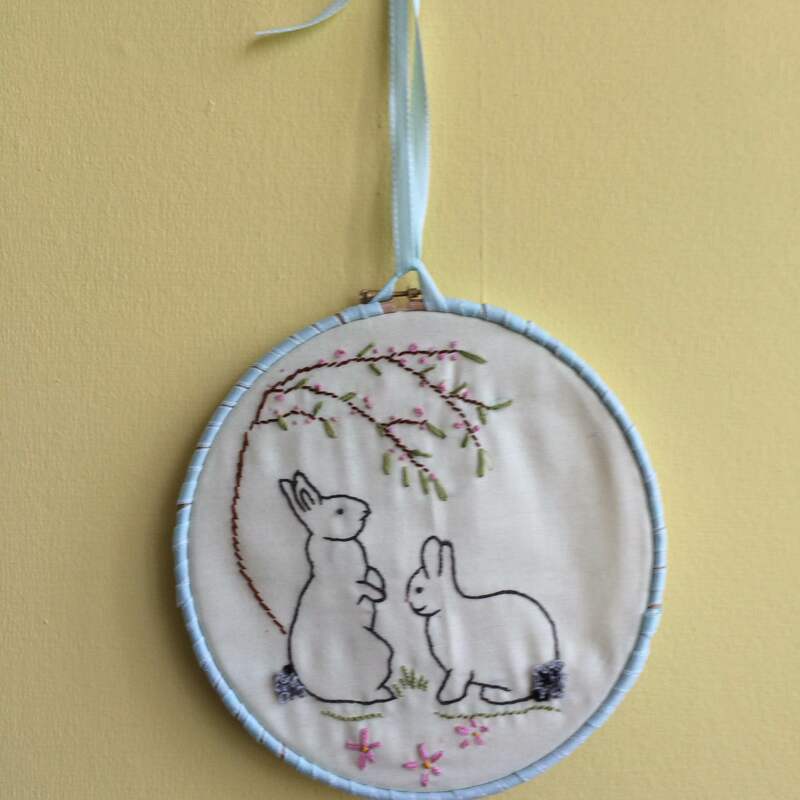 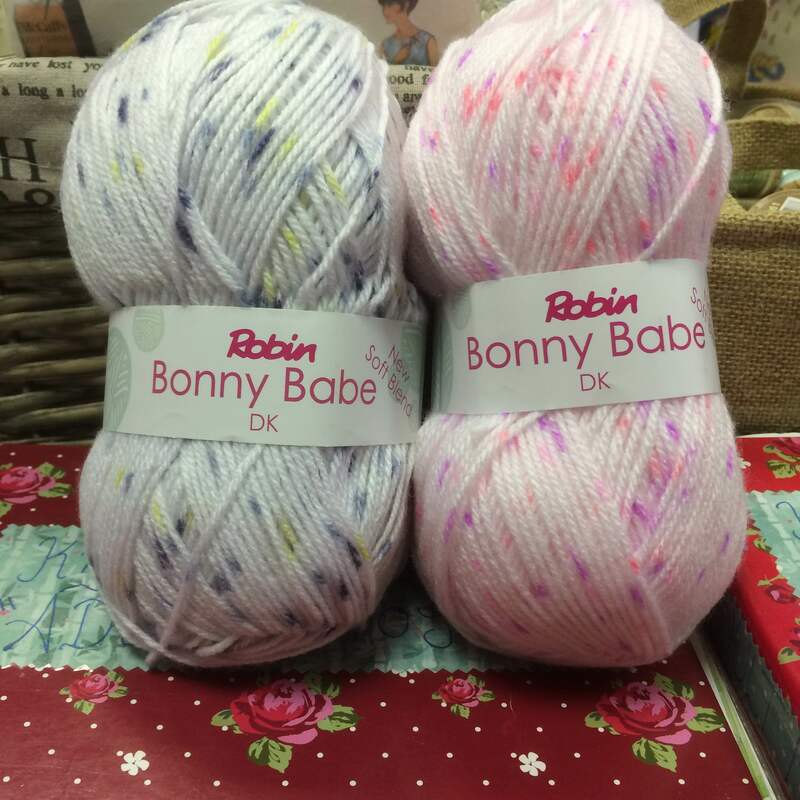 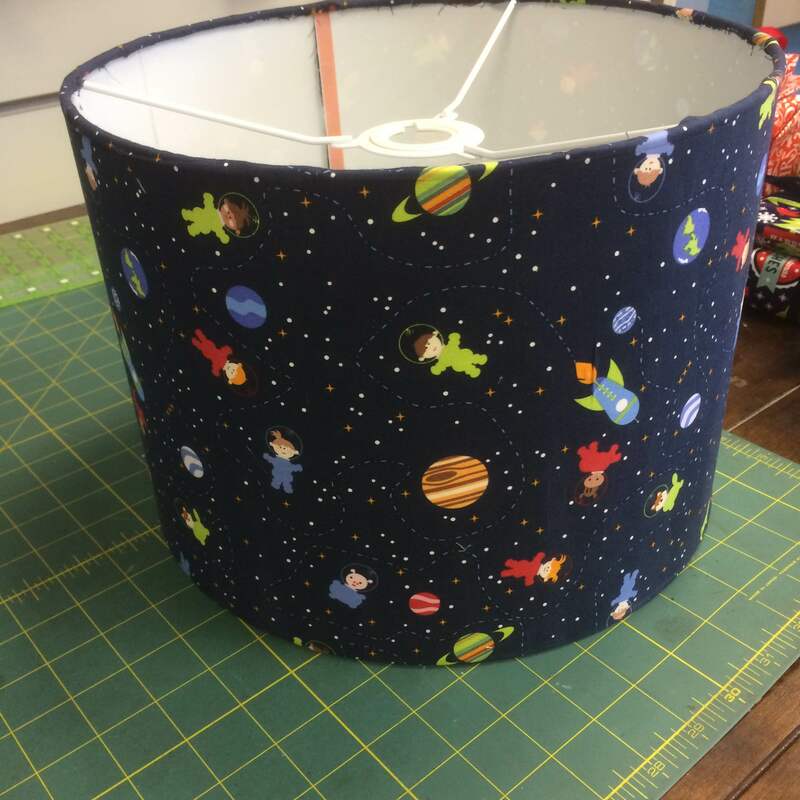 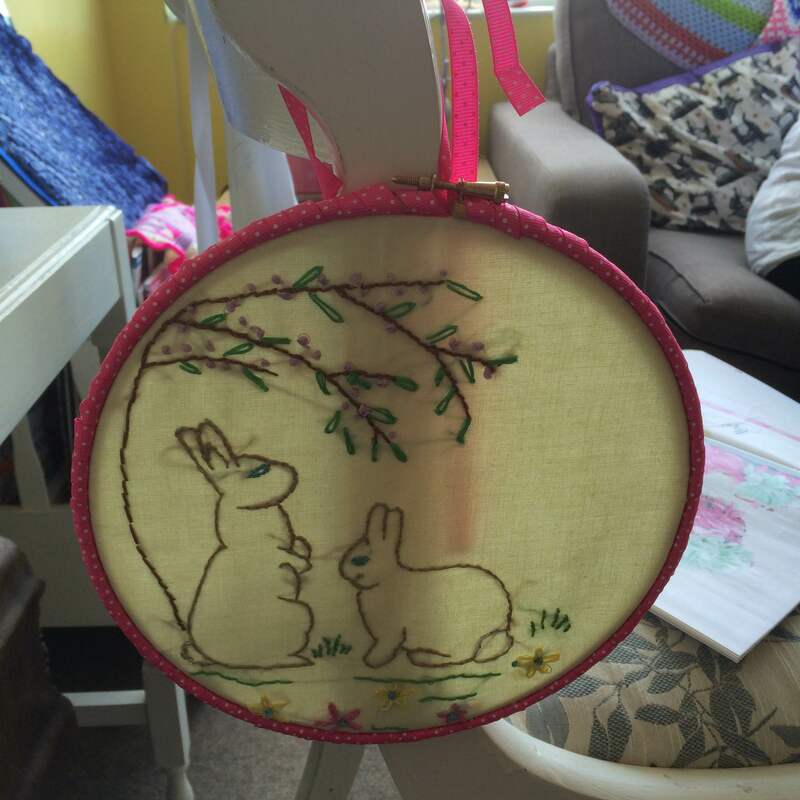 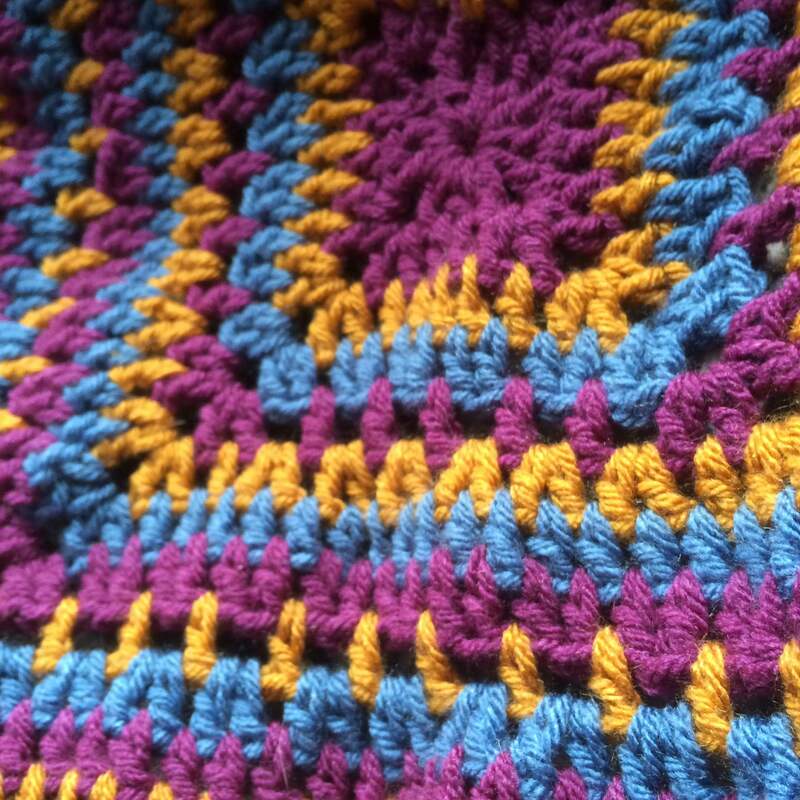 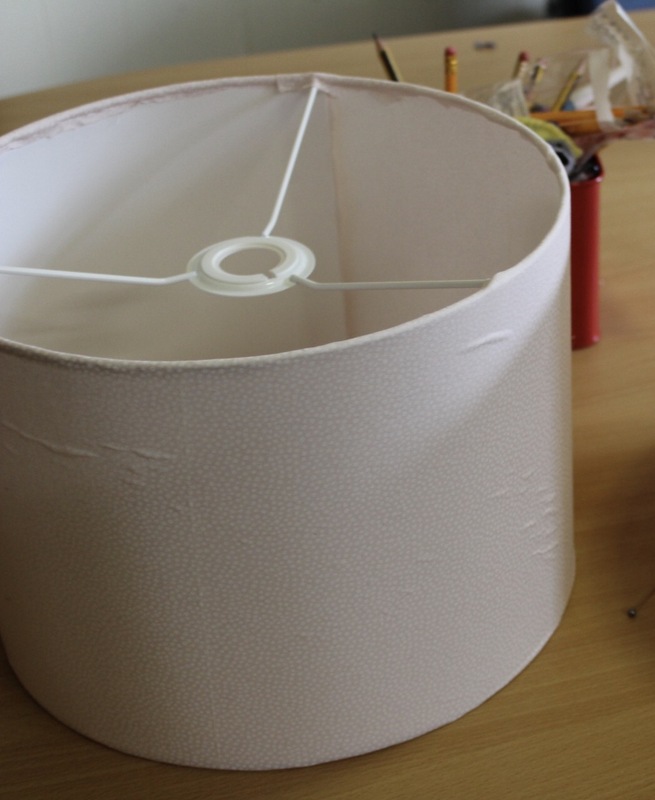 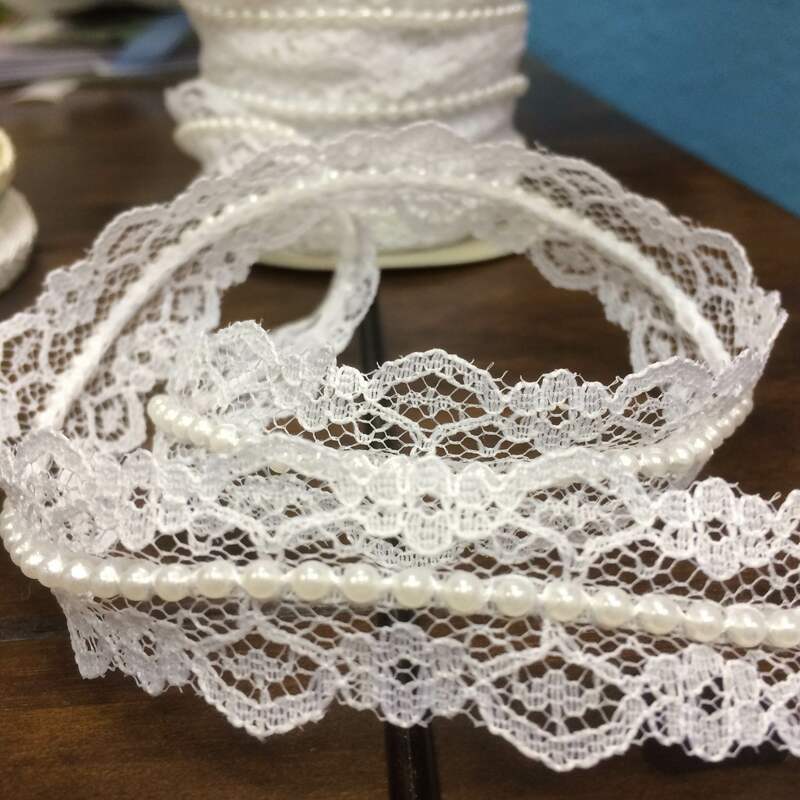 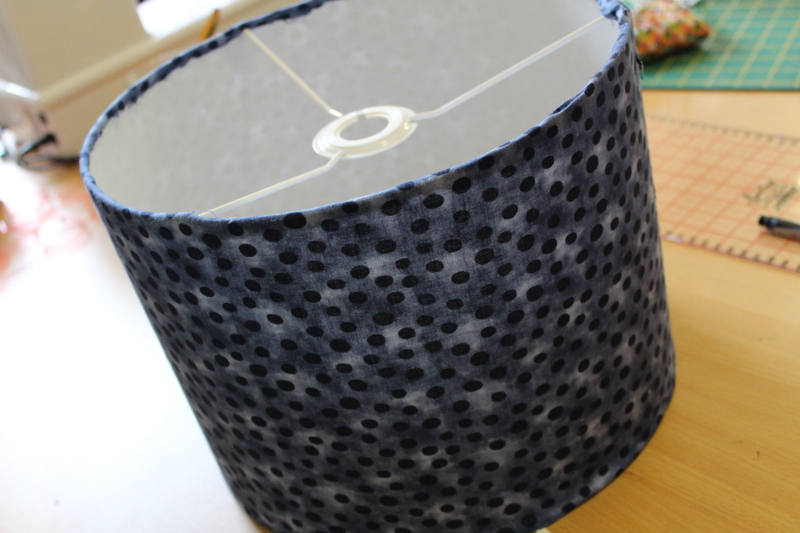 in the hoop – The haberdashery Blog. 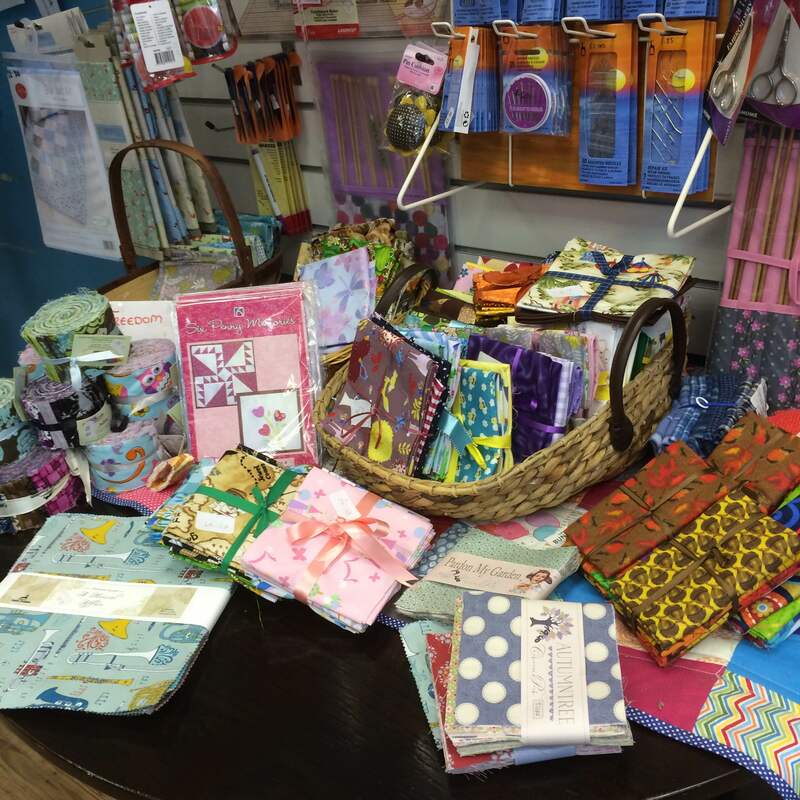 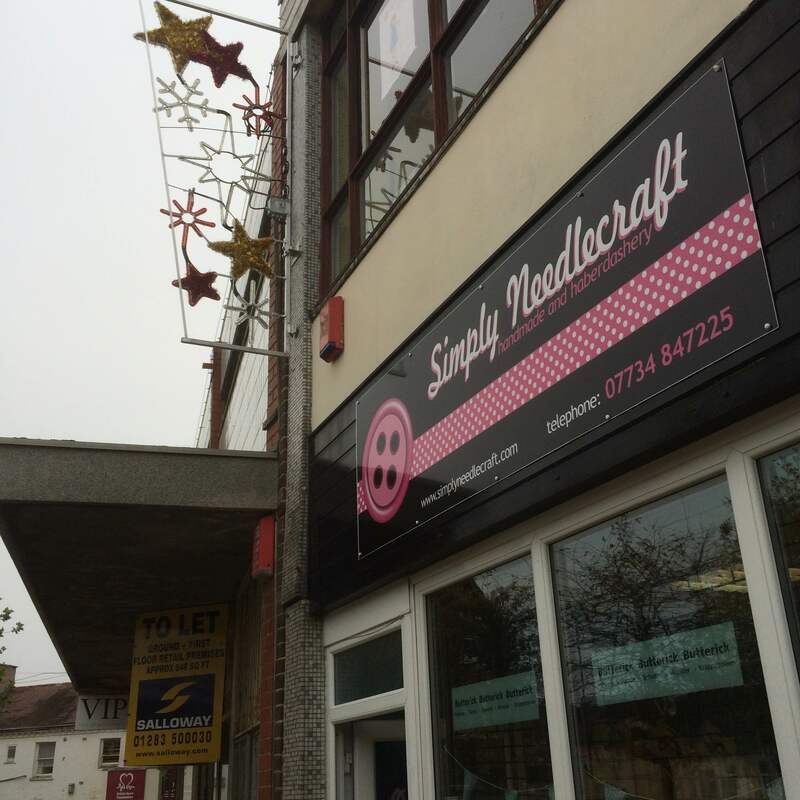 The Sewing Studio is the heart of Simply Needlecraft for me. 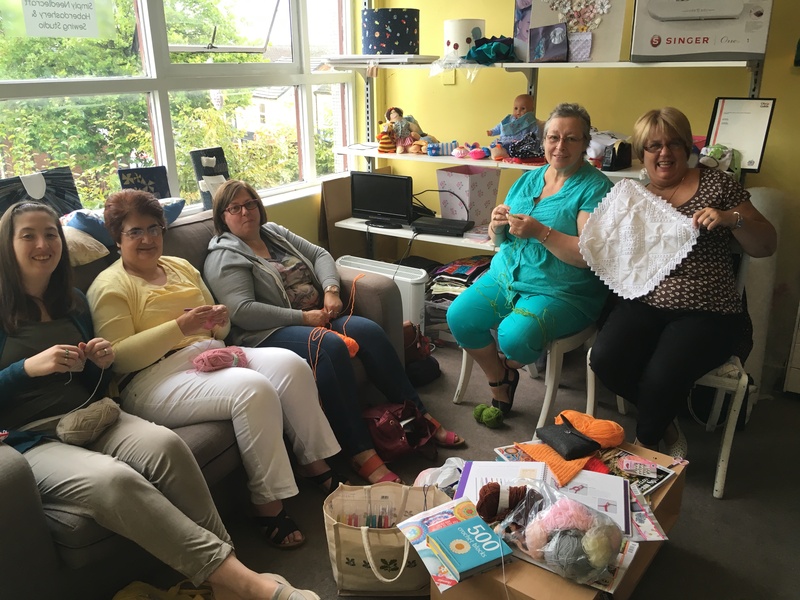 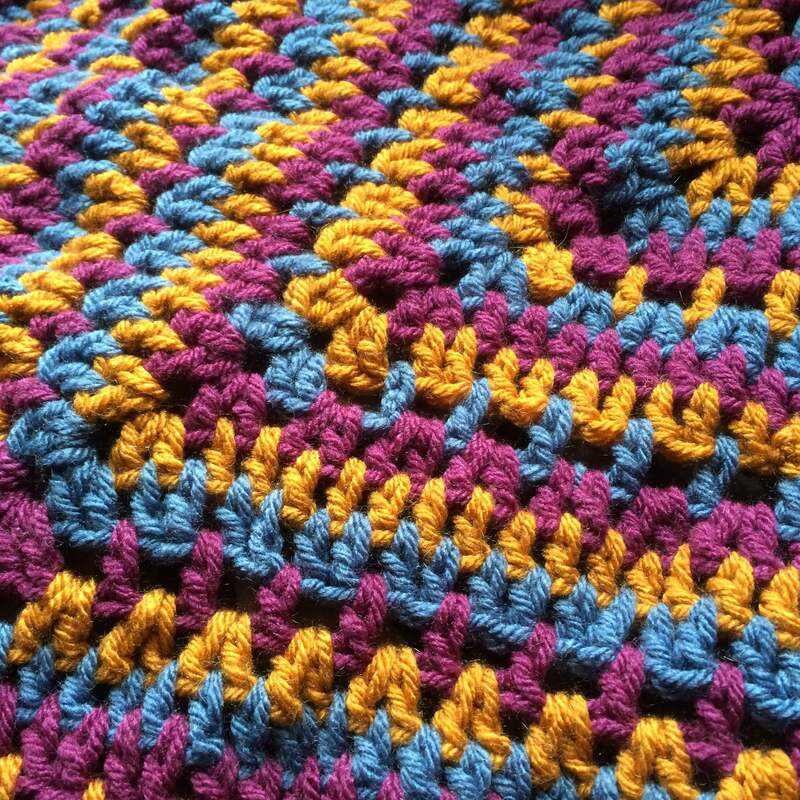 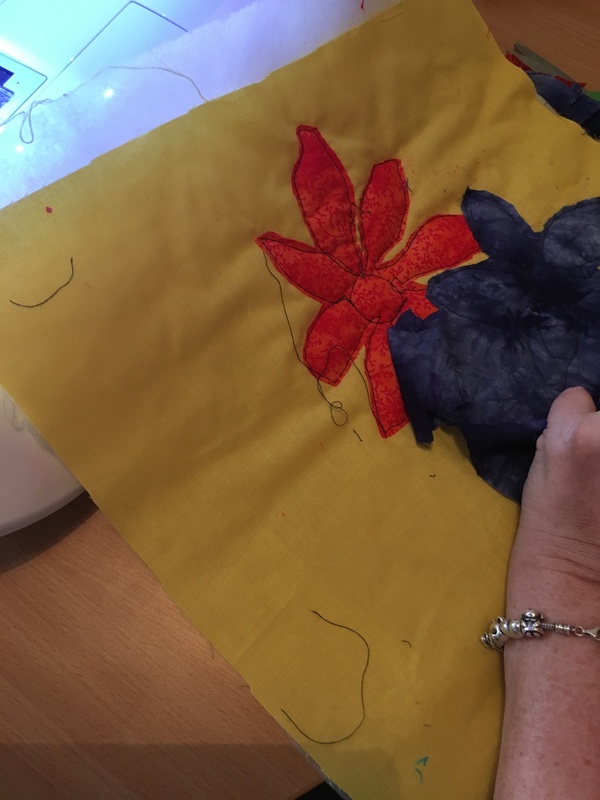 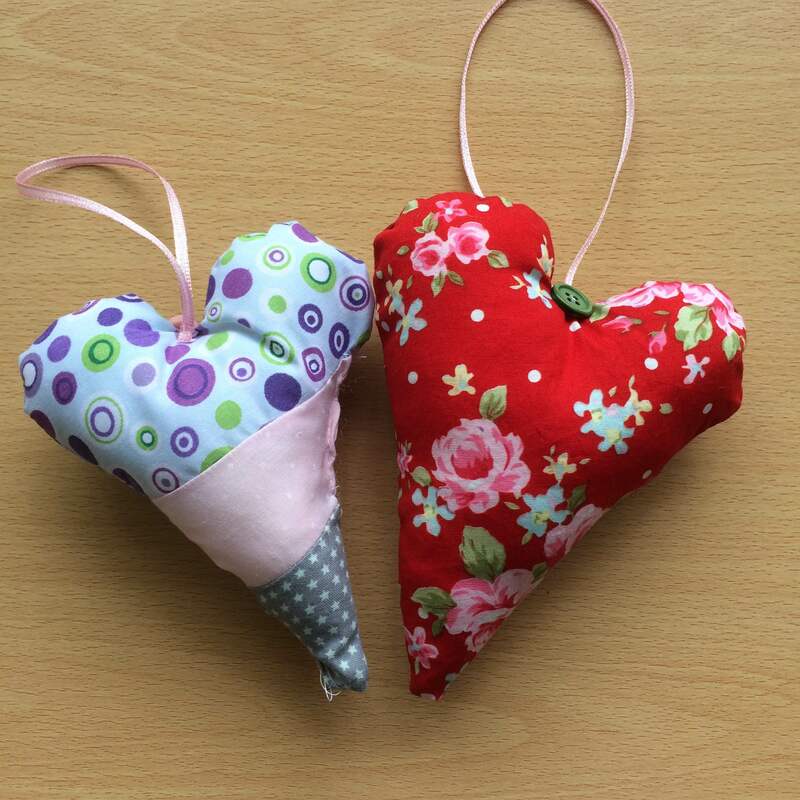 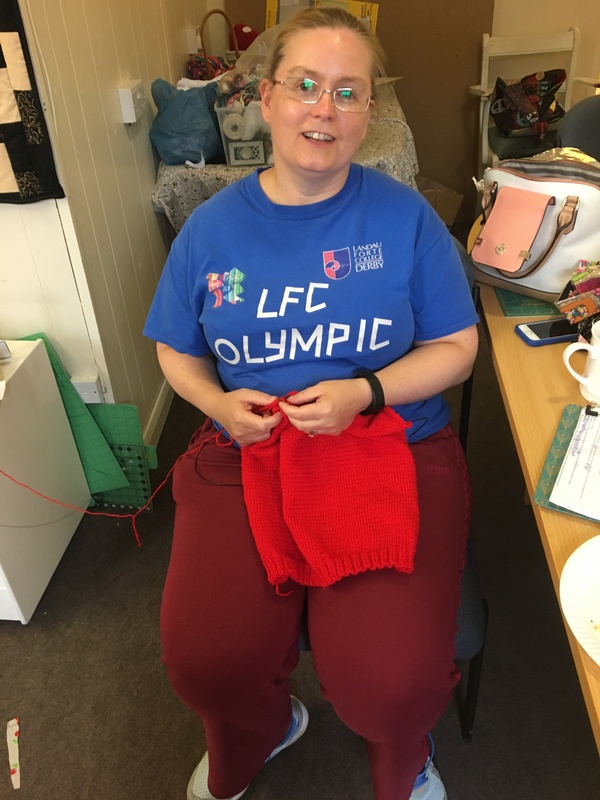 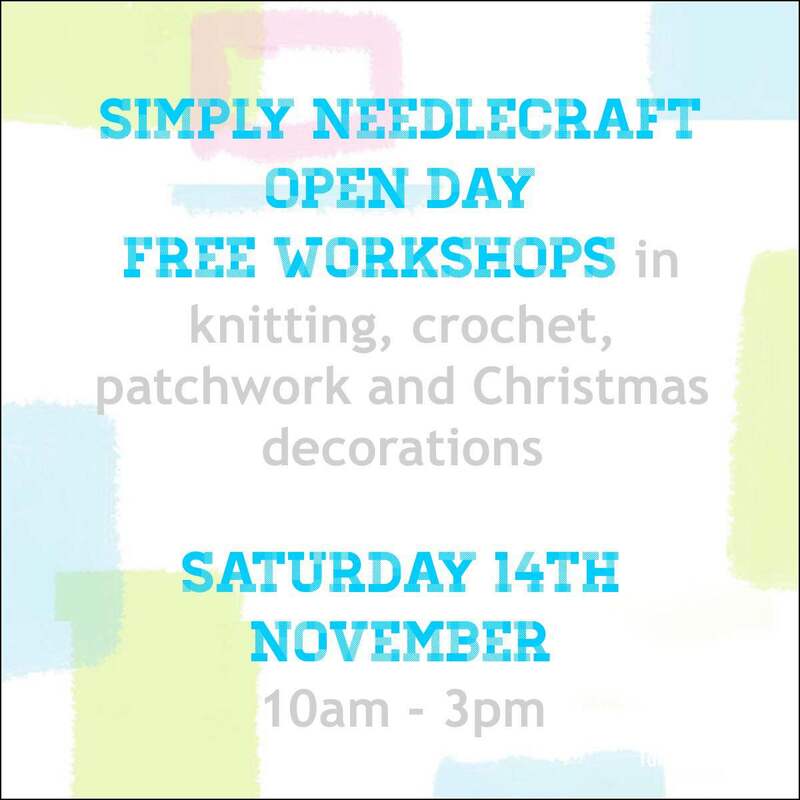 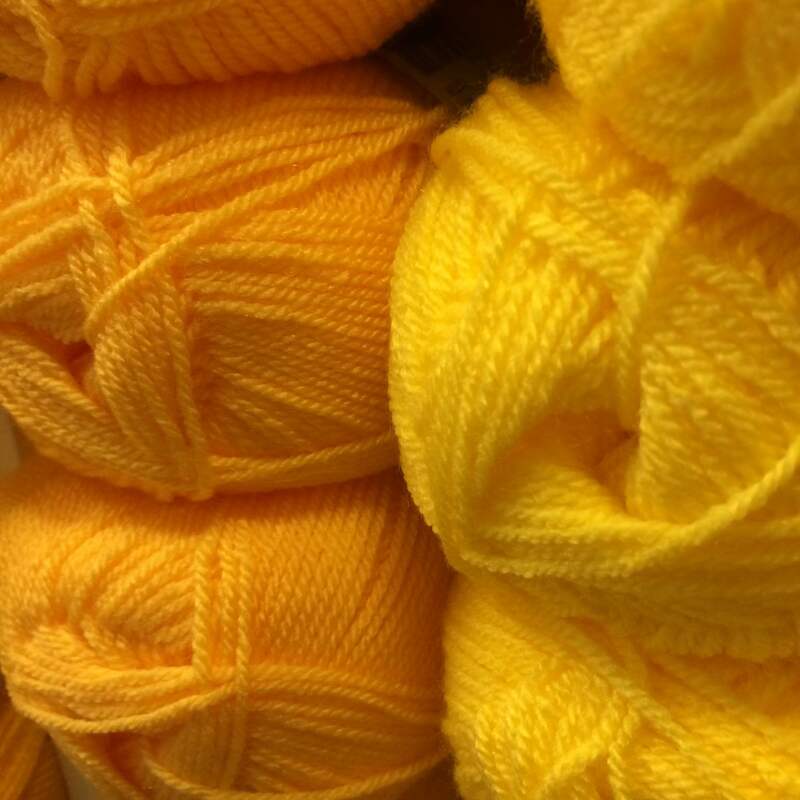 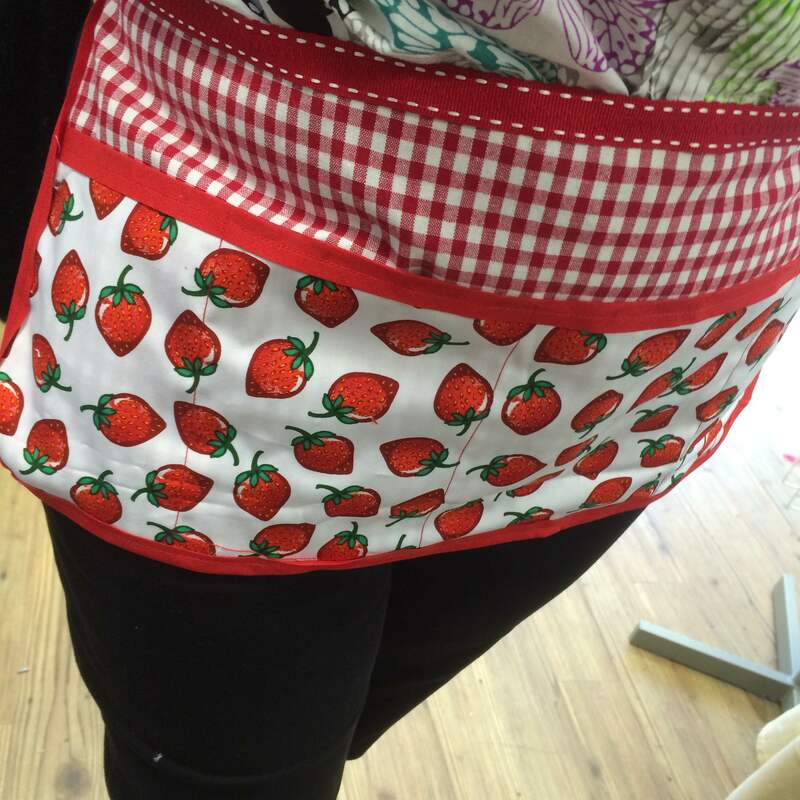 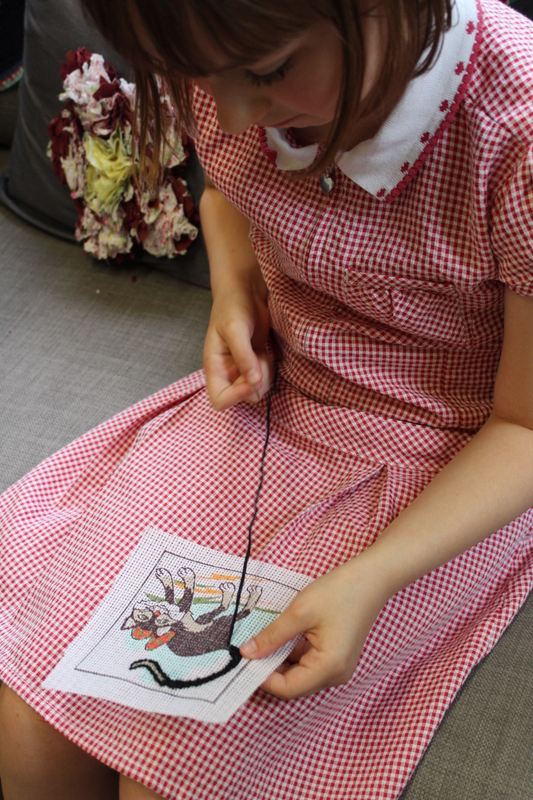 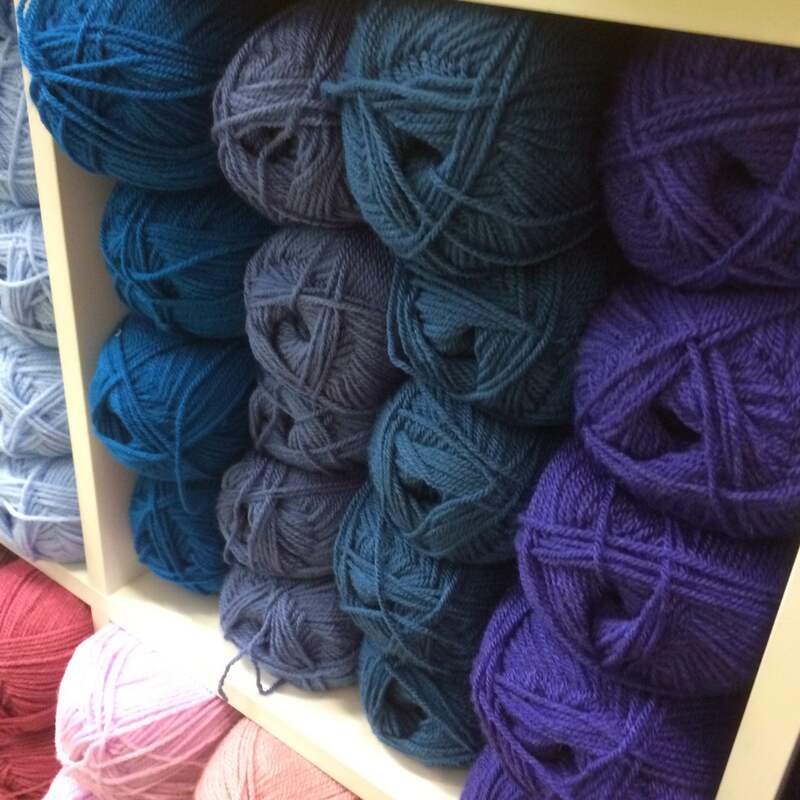 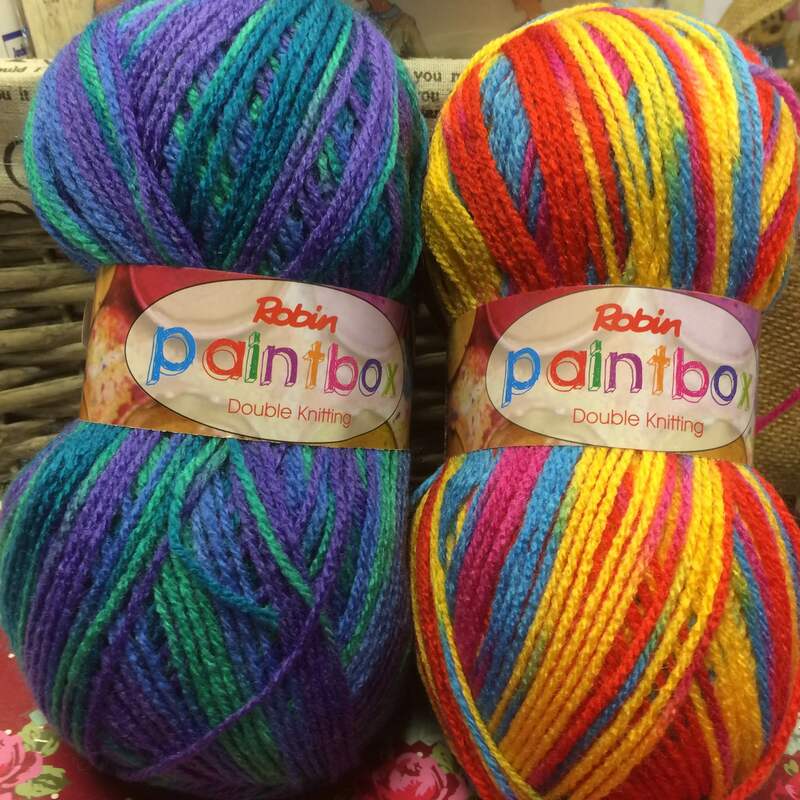 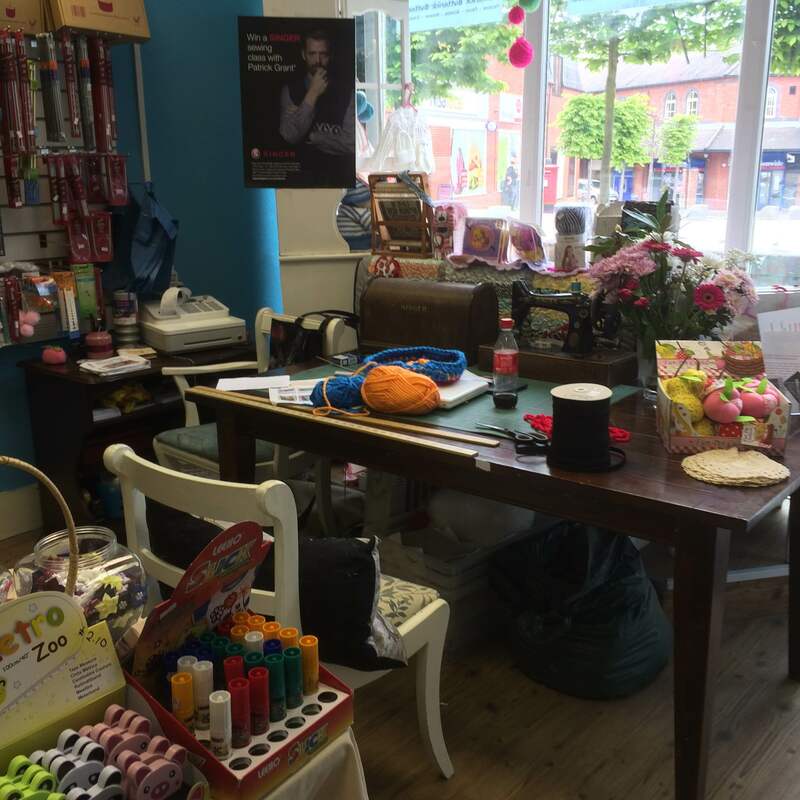 From adults workshops to children’s workshop, from knitting to crochet to sewing to craft and chat ………. 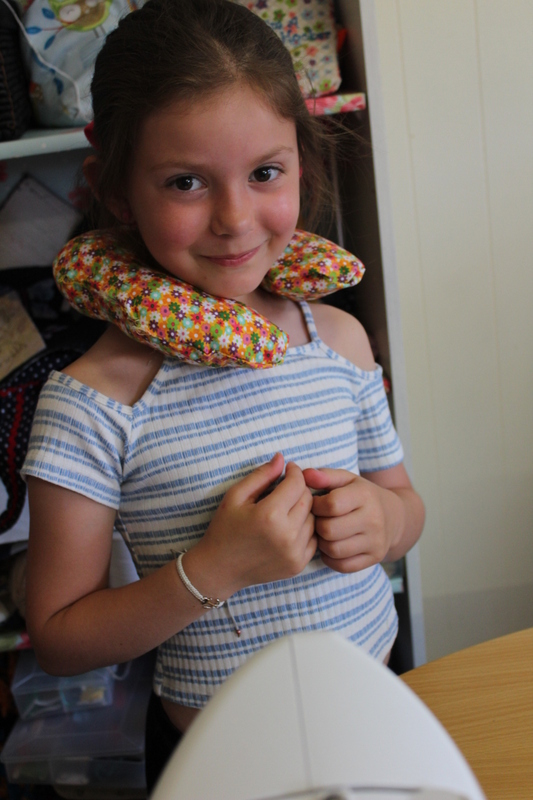 oooopppps I forgot to share to the photos on fb of our last evening. 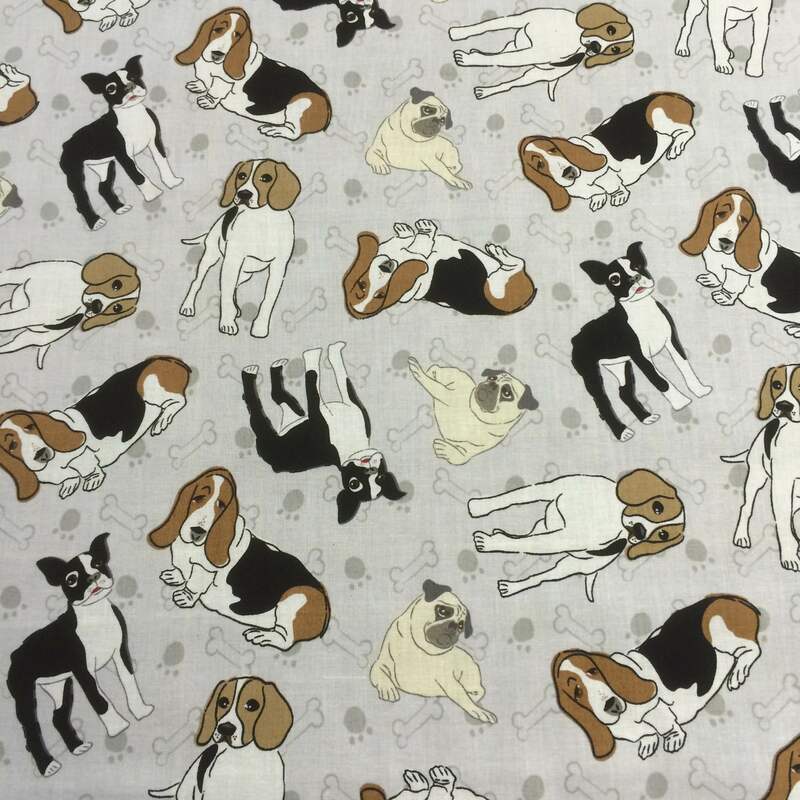 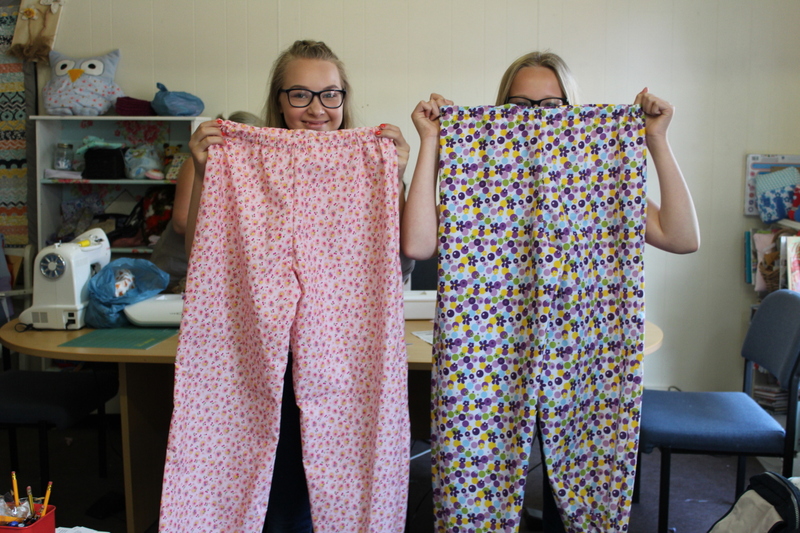 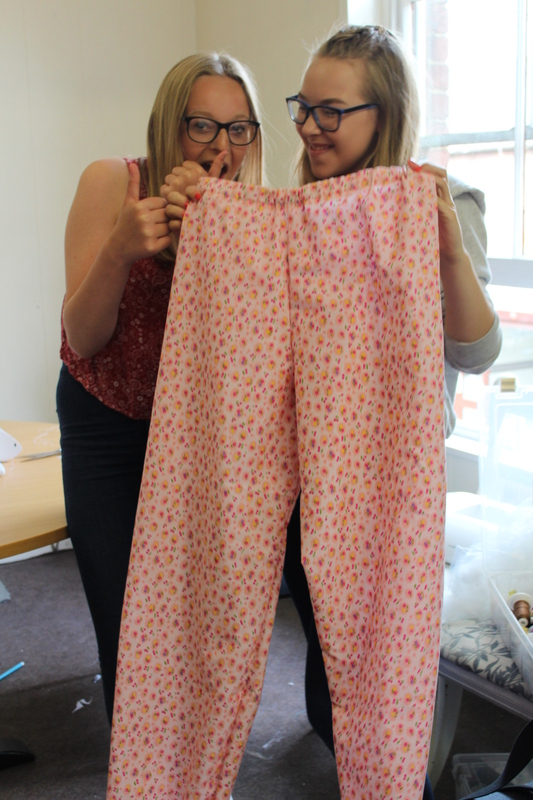 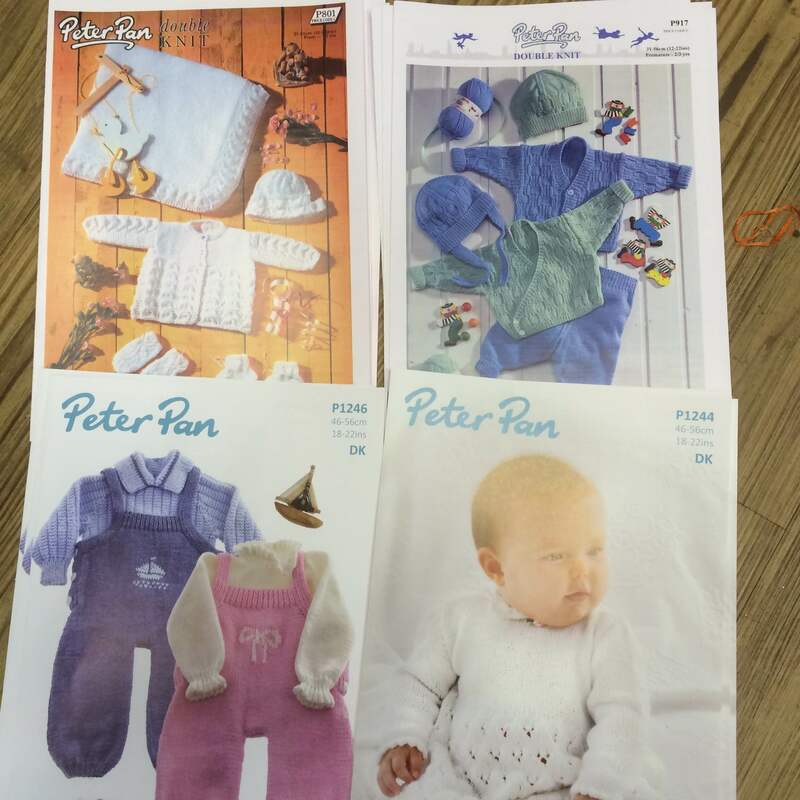 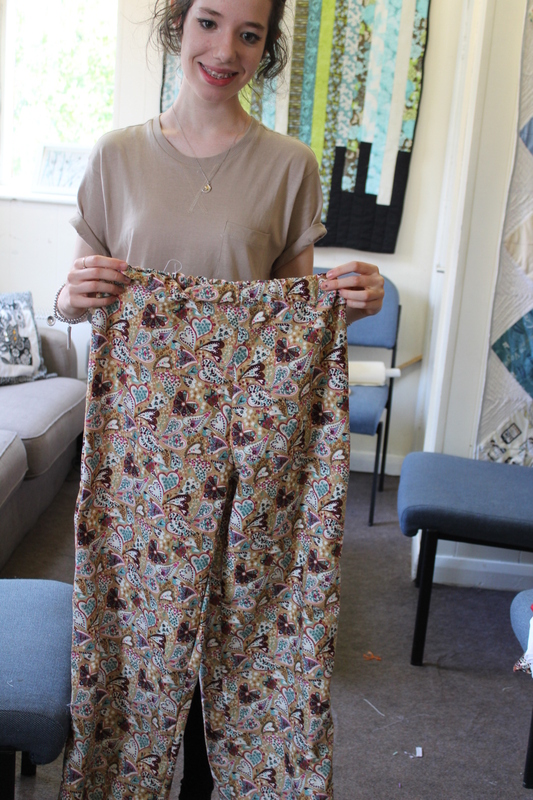 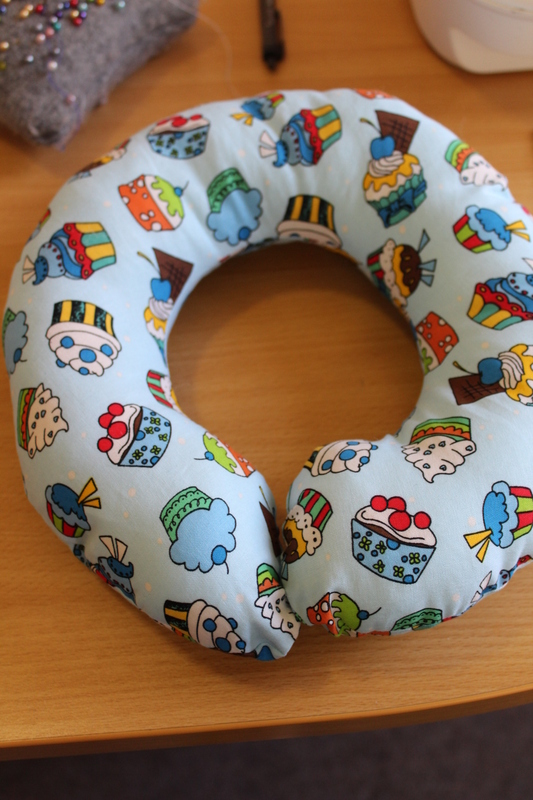 So here they are…..
And for the 12-16yrs groups it been all about pj bottoms……. 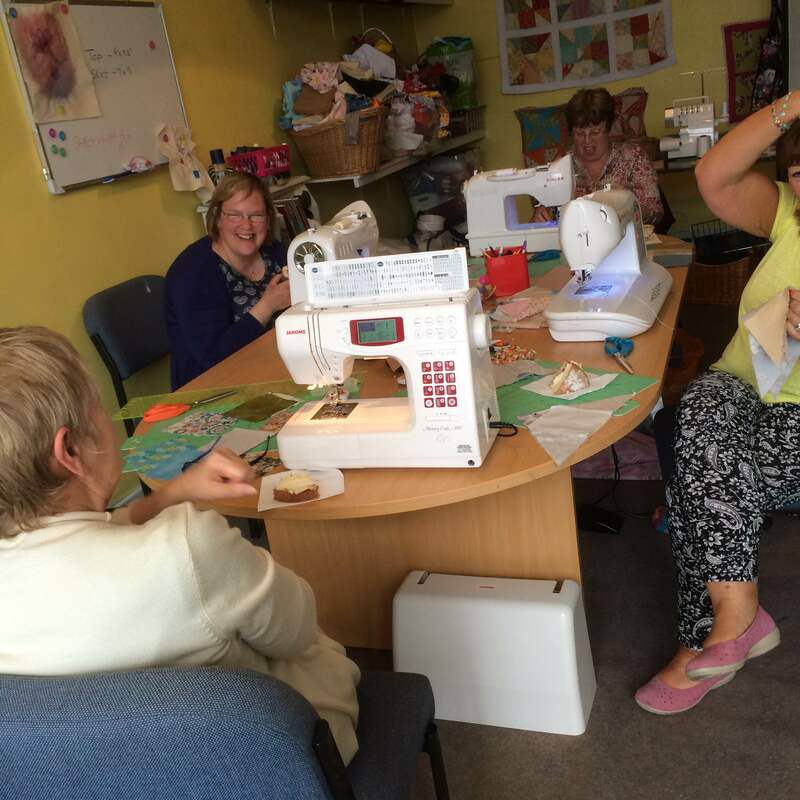 The Sewing Studio was also home to the Mother & Daughter Sewing class too. 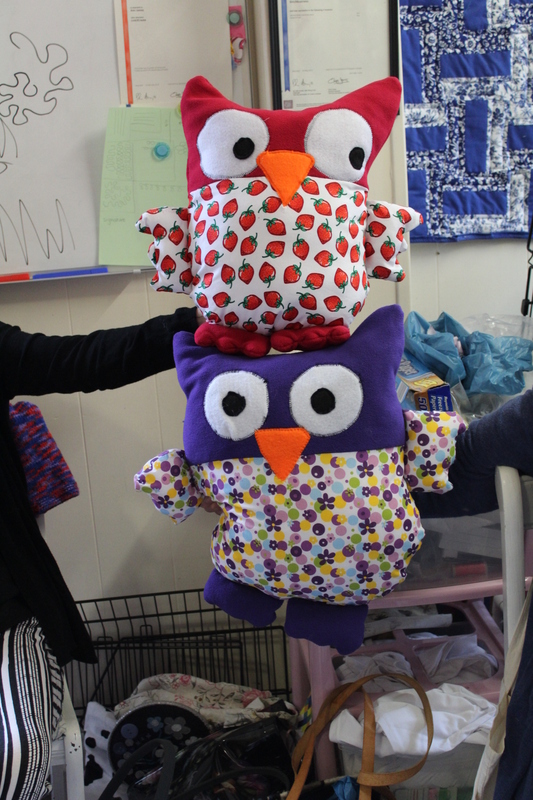 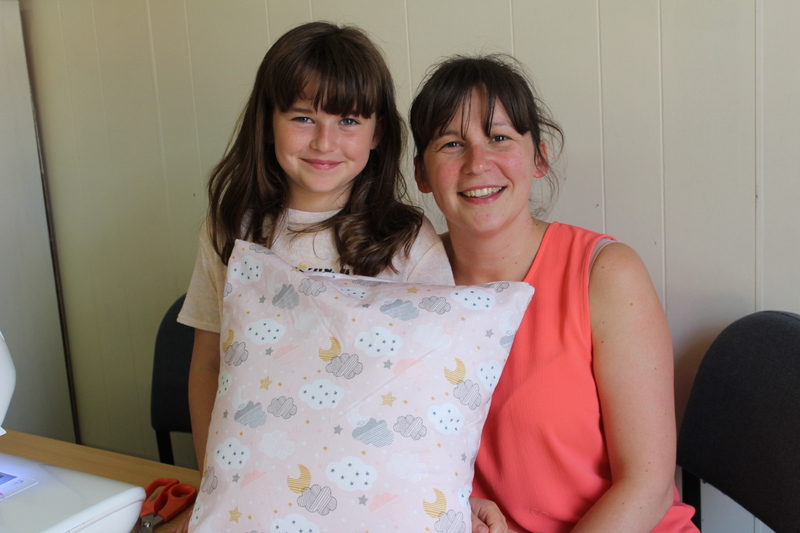 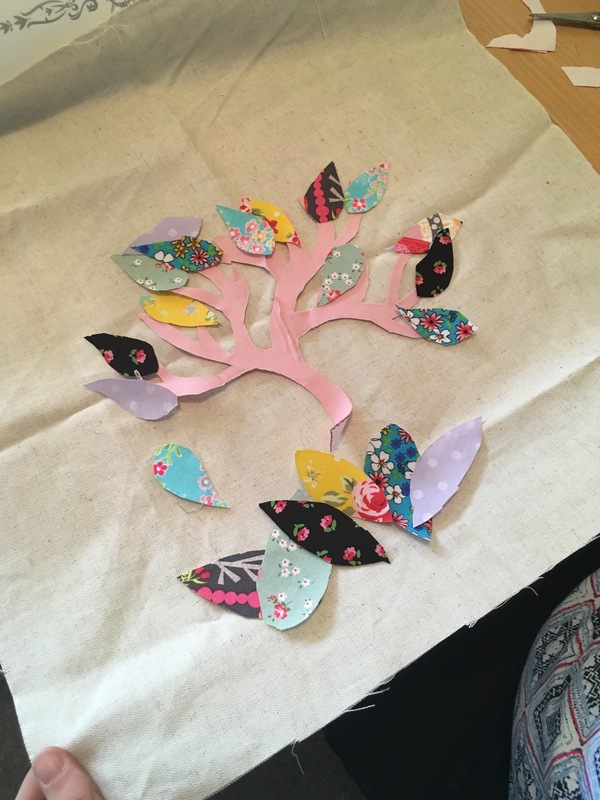 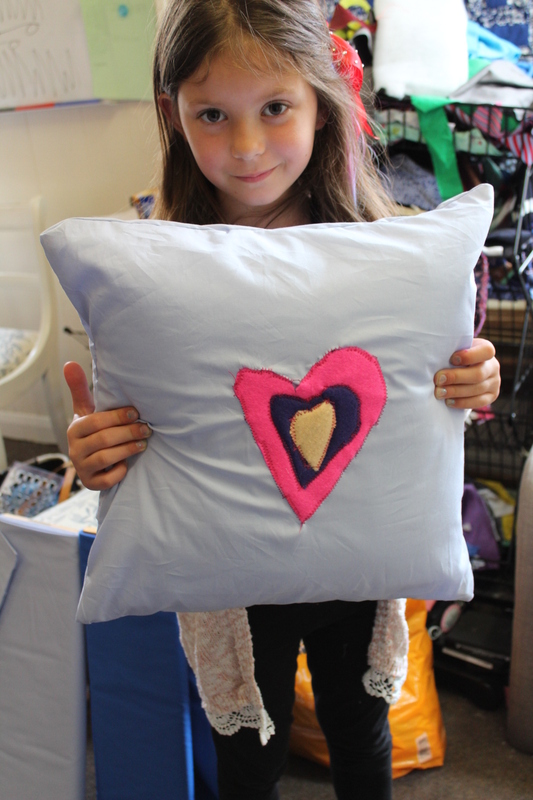 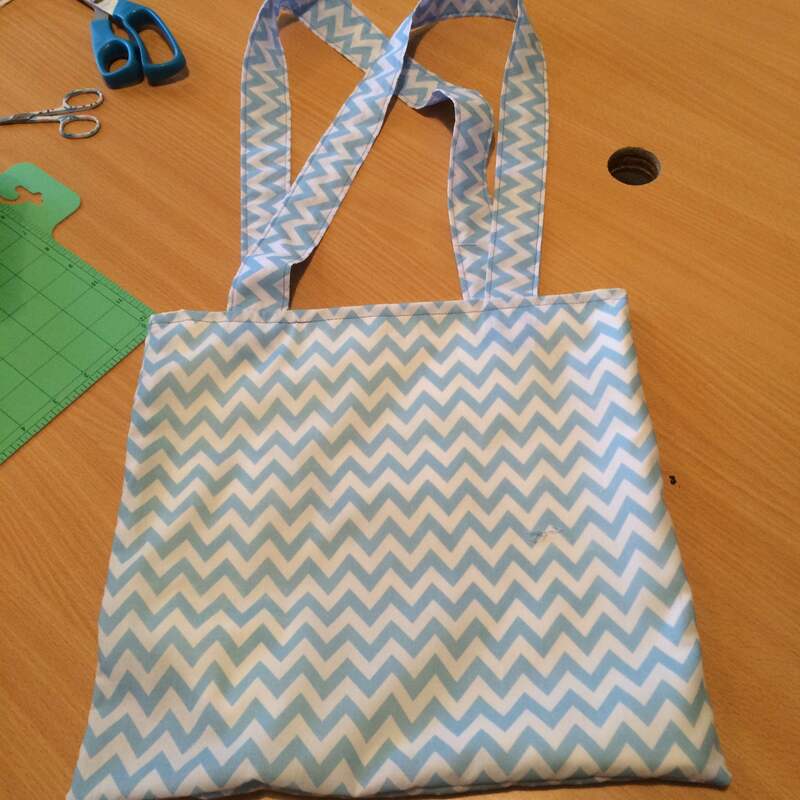 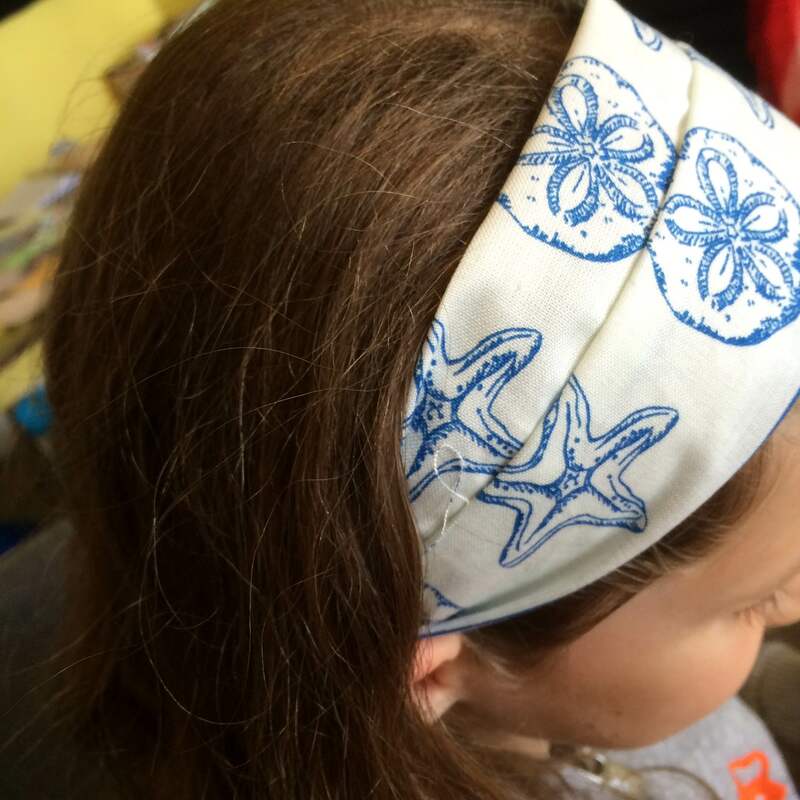 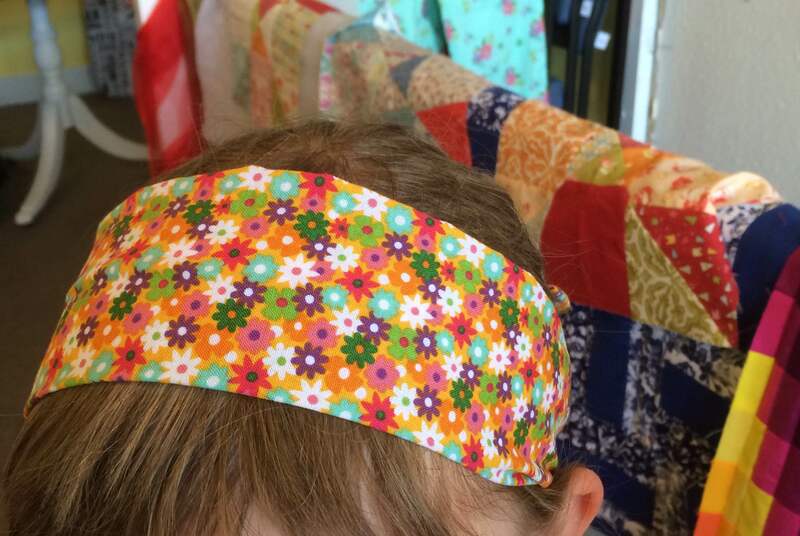 This is one of my favourite workshops, where mother and daughters team up to make an item. 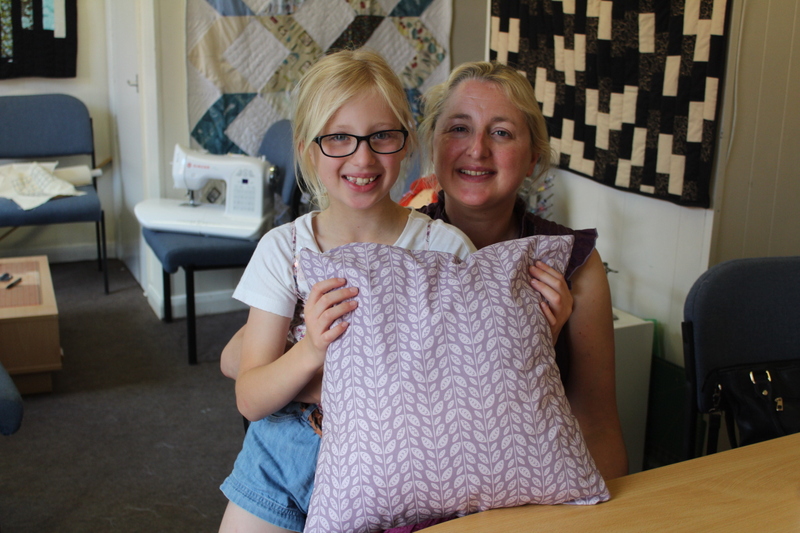 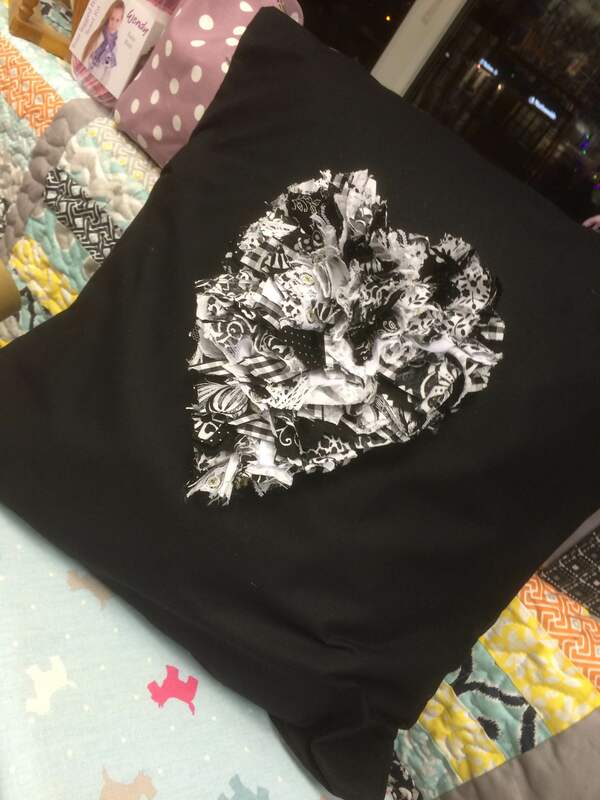 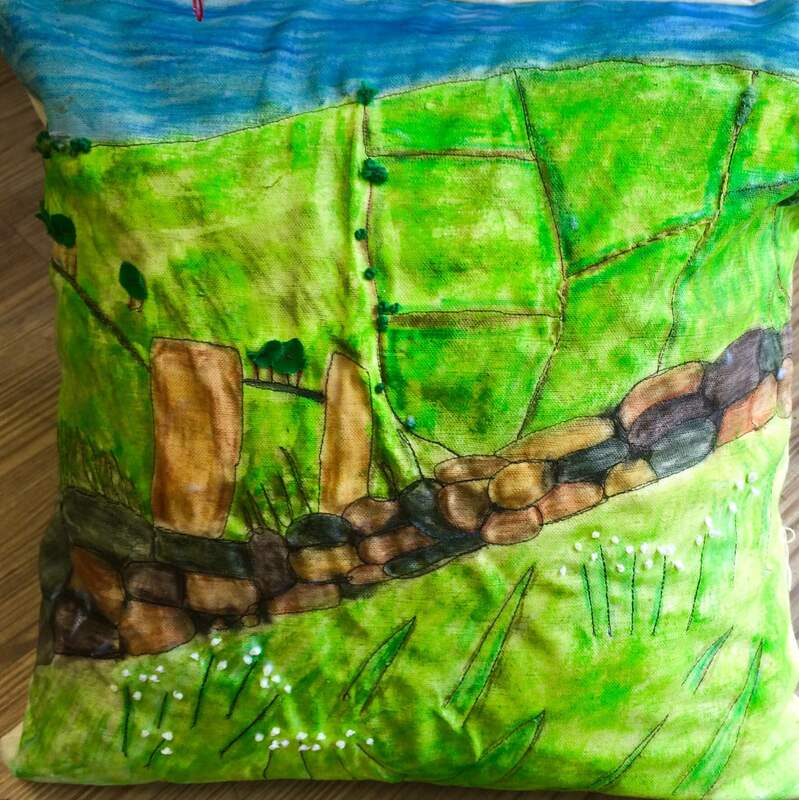 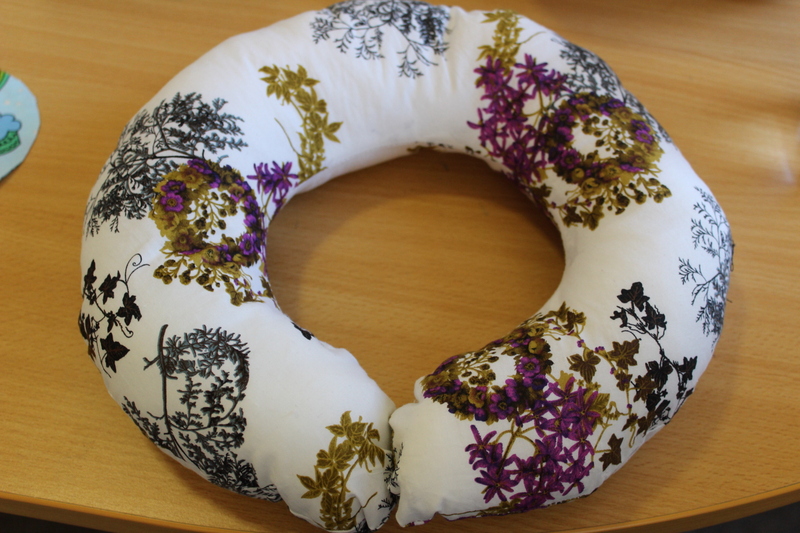 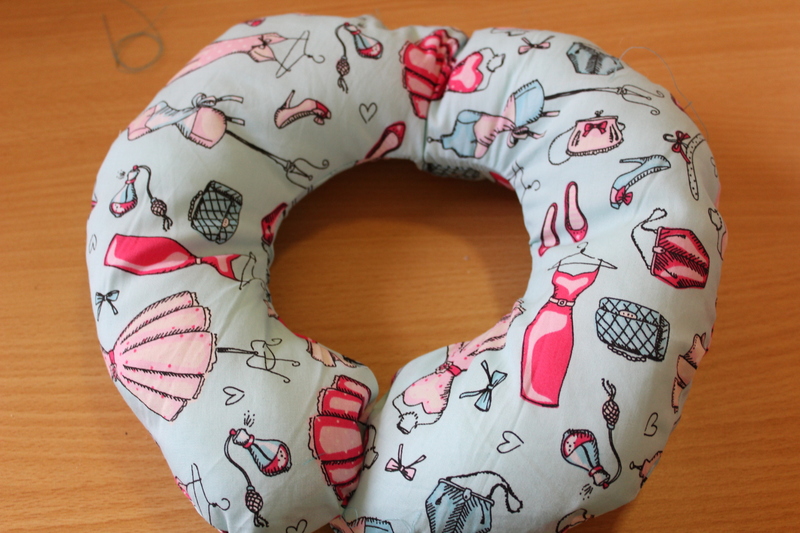 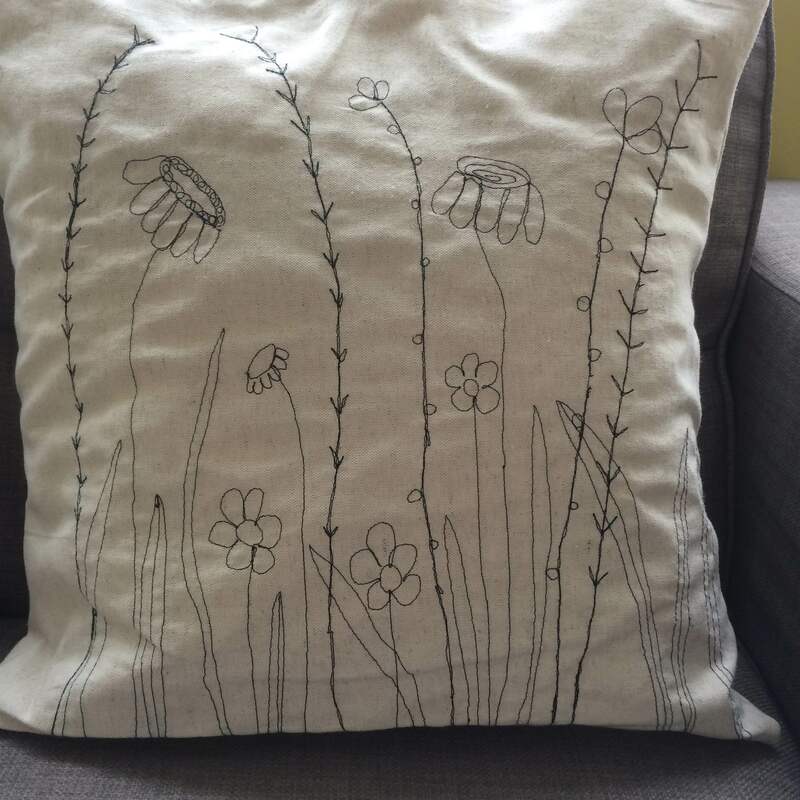 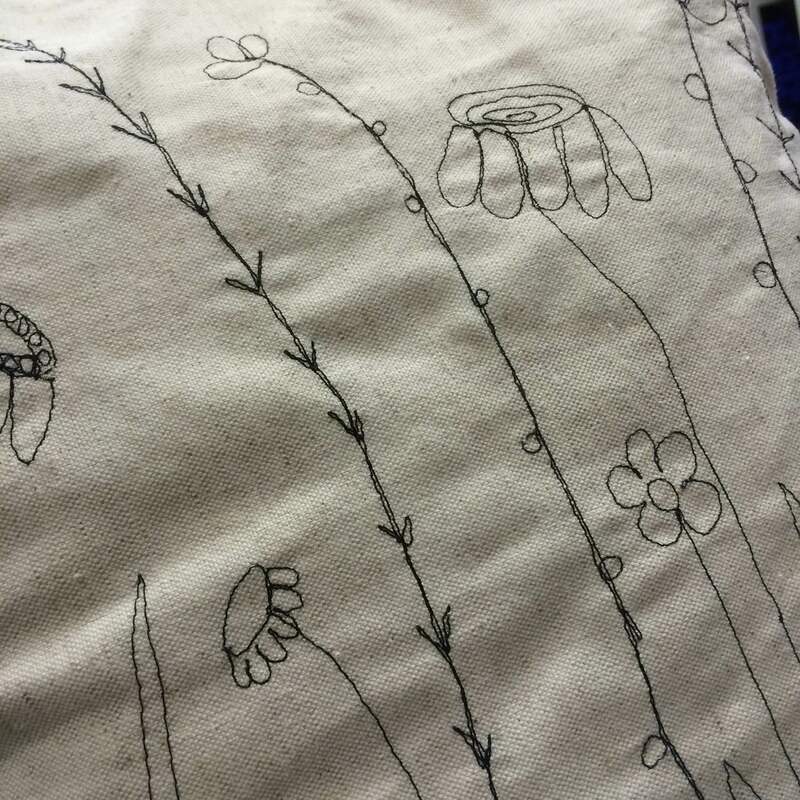 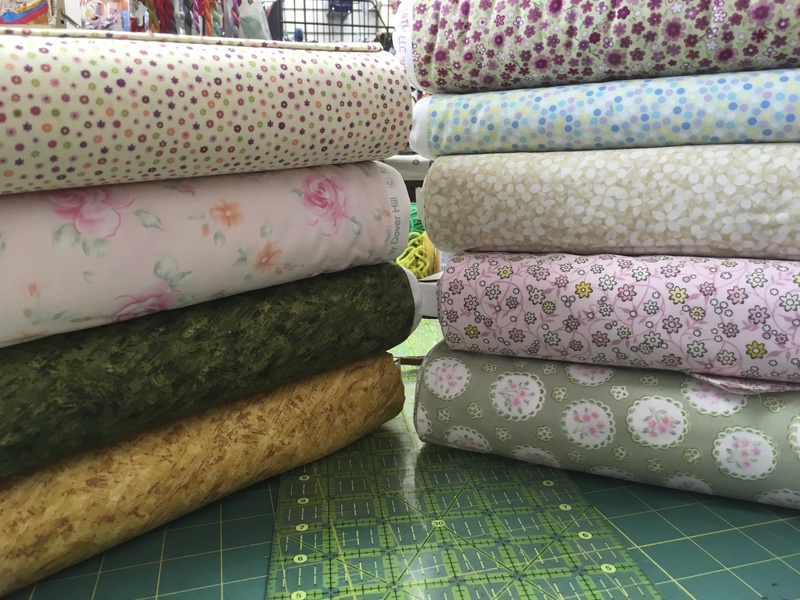 This months class focused on cushion making…..
Lots of new fabrics in too………just look at them all…..
I’m Ready For The Weekend !!!! 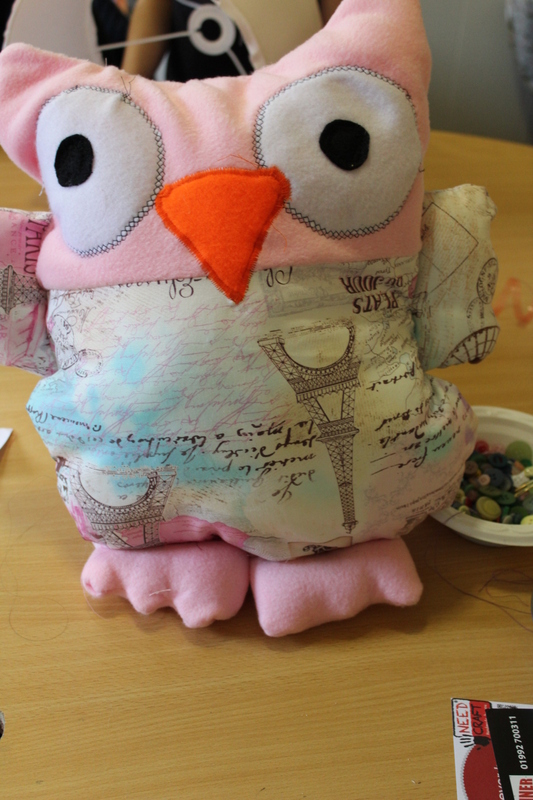 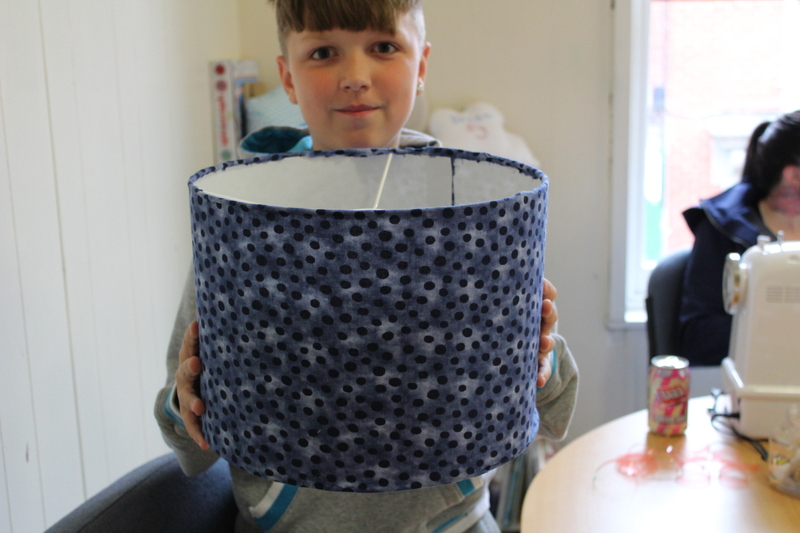 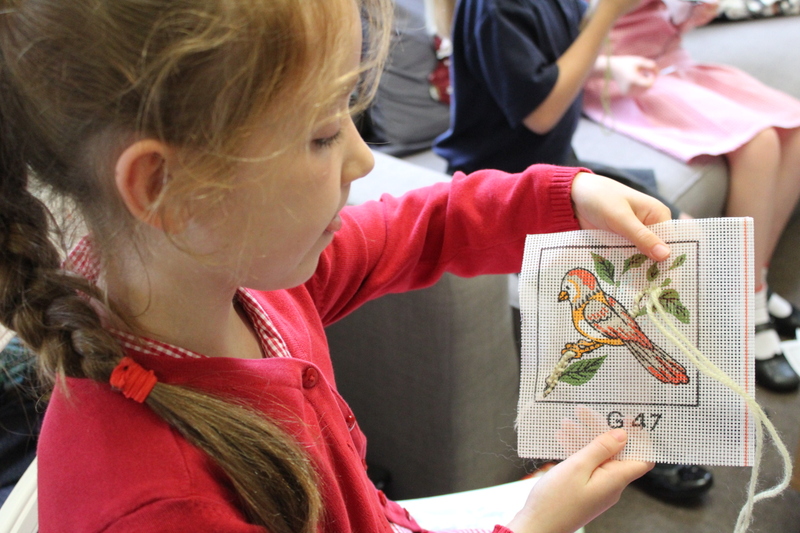 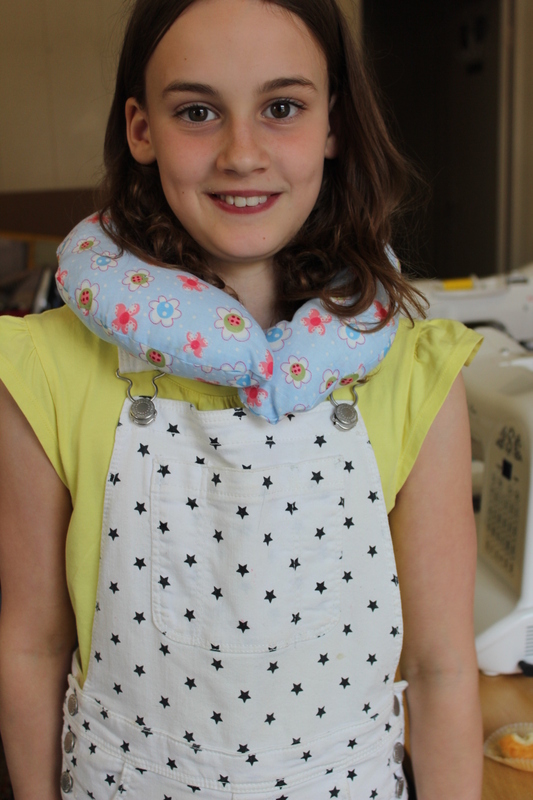 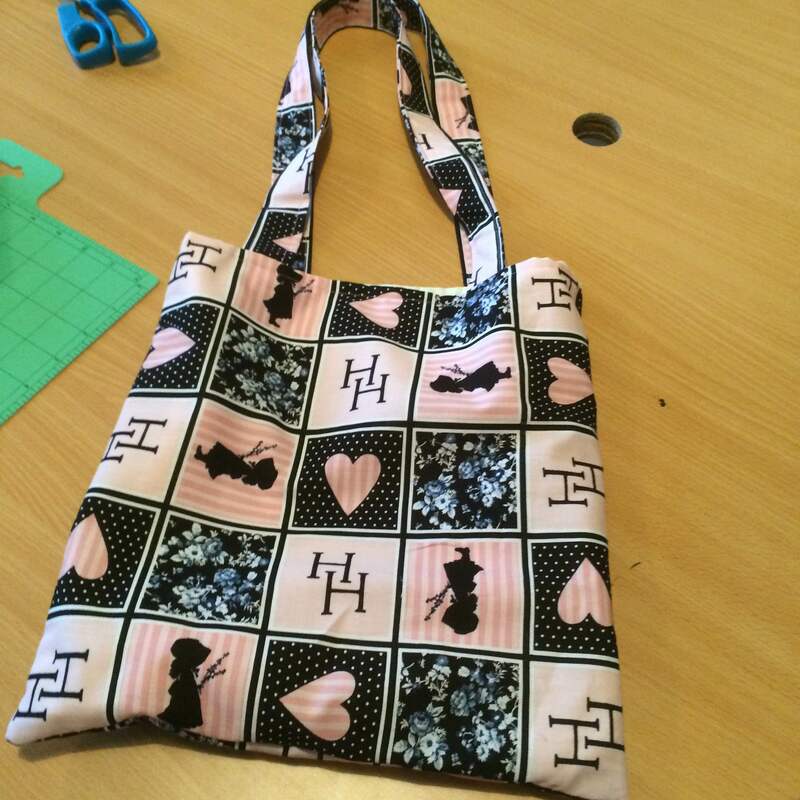 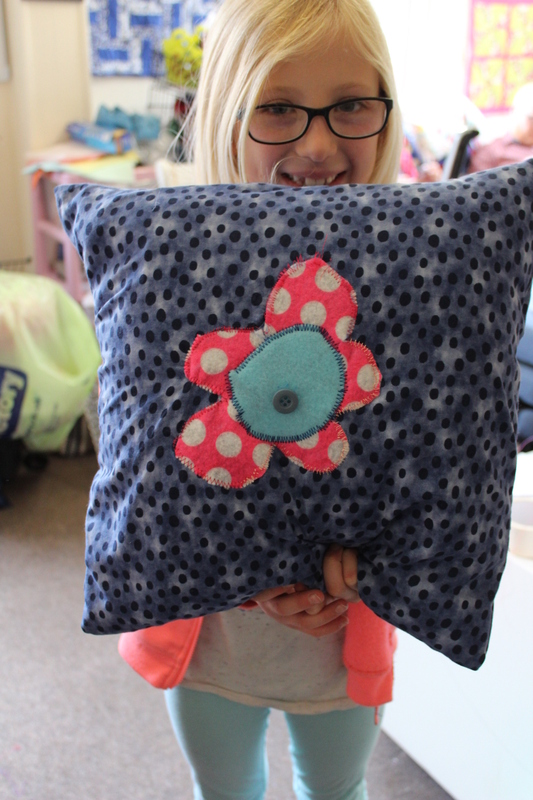 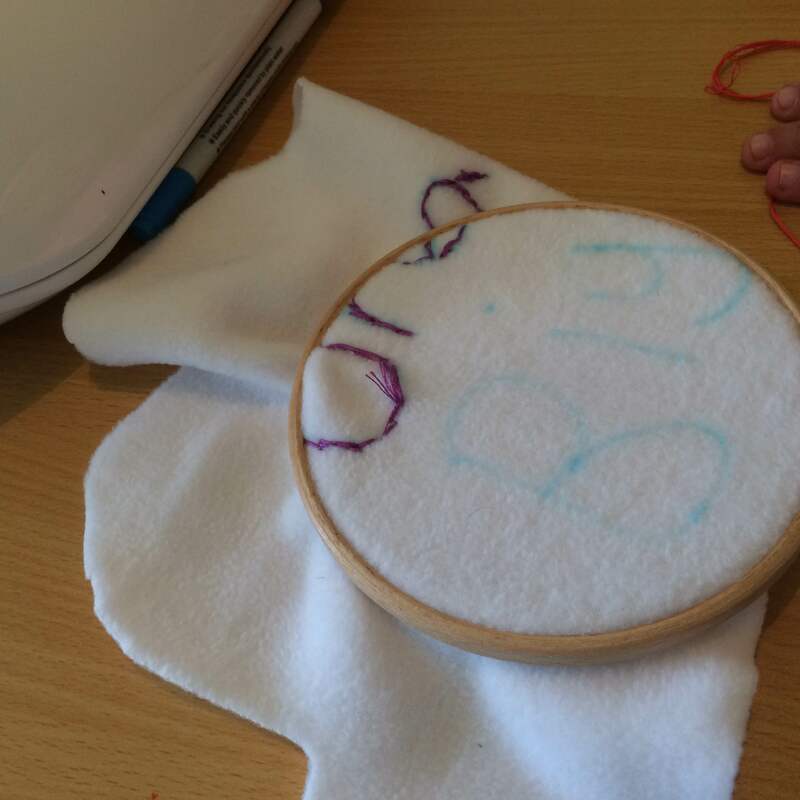 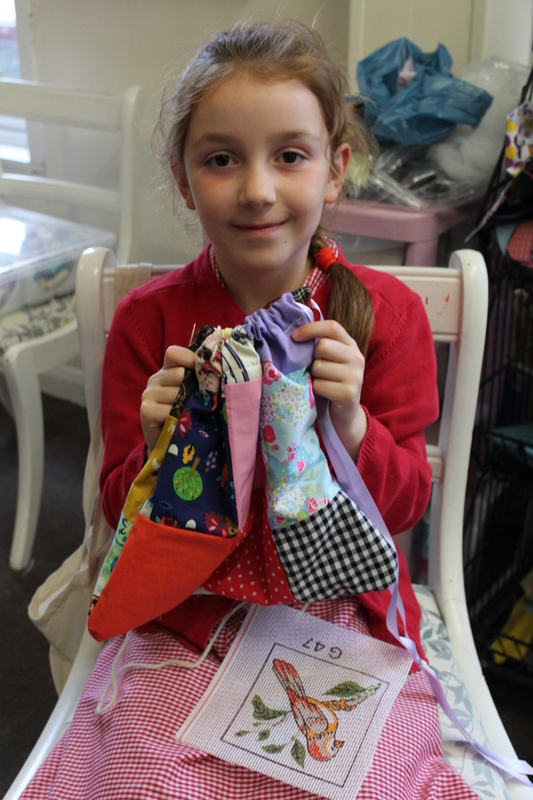 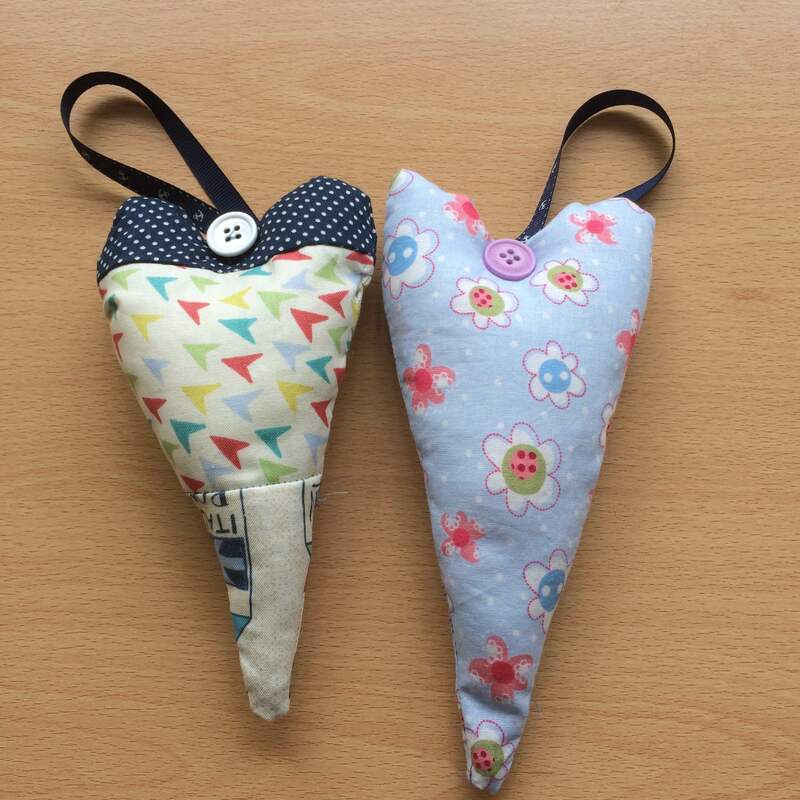 On Monday and Wednesday I had my new Sewing Bee sessions start for 8-12yrs. 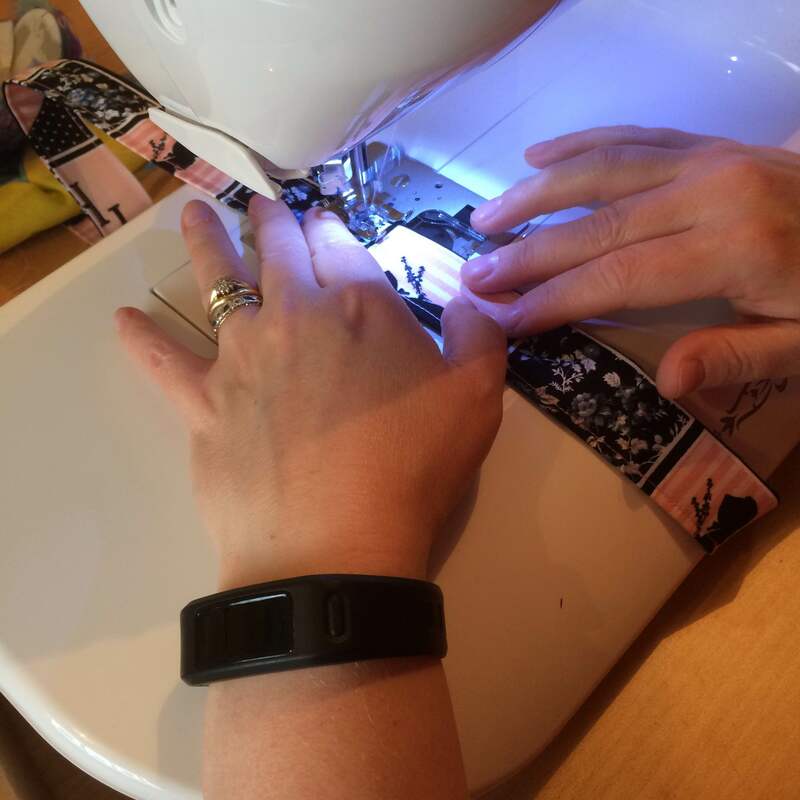 Both sessions were brilliant but I have nothing to show you as yet as they are getting to grips on the machines and completing little challenges to help them relax. 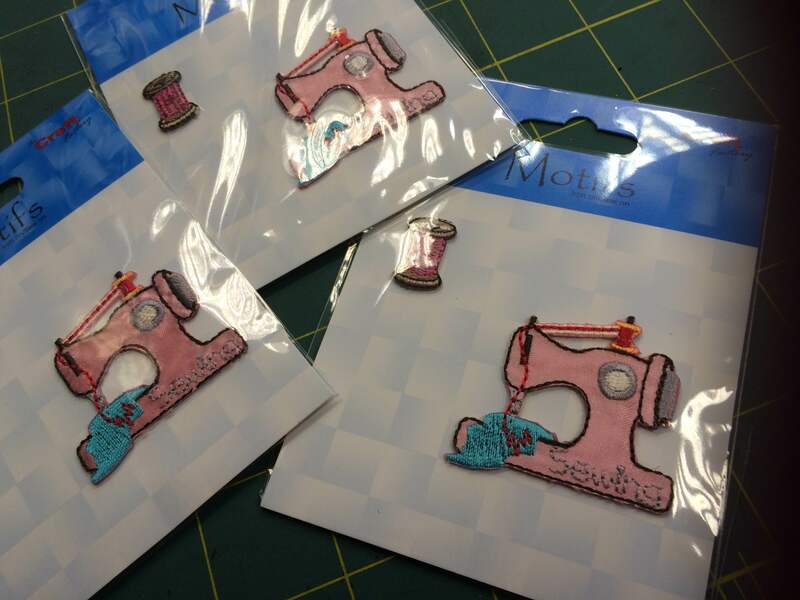 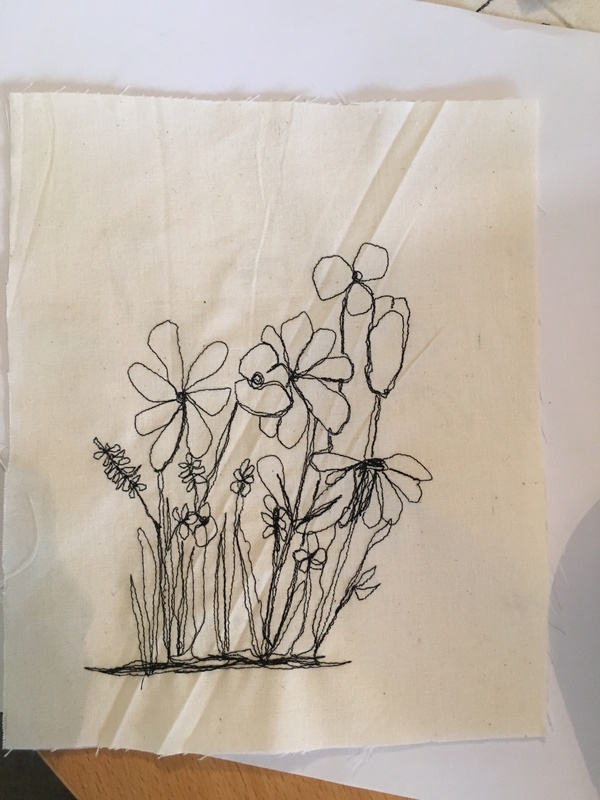 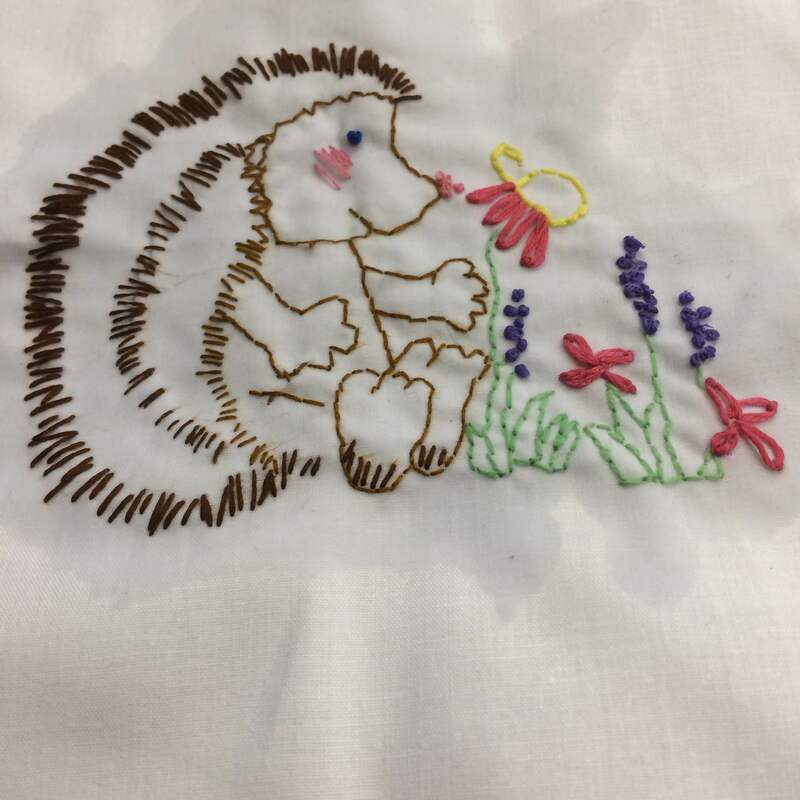 Monday evening it was the adults turn and four ladies joined me in the Free Motion Embroidery Introduction Workshop. 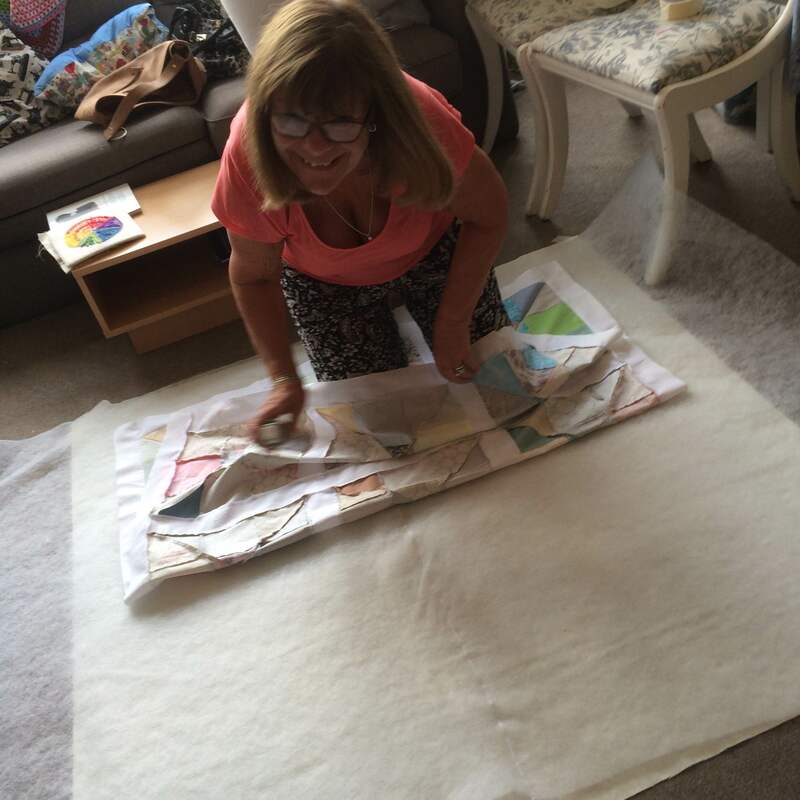 This is a great session and people are always impressed with the results. 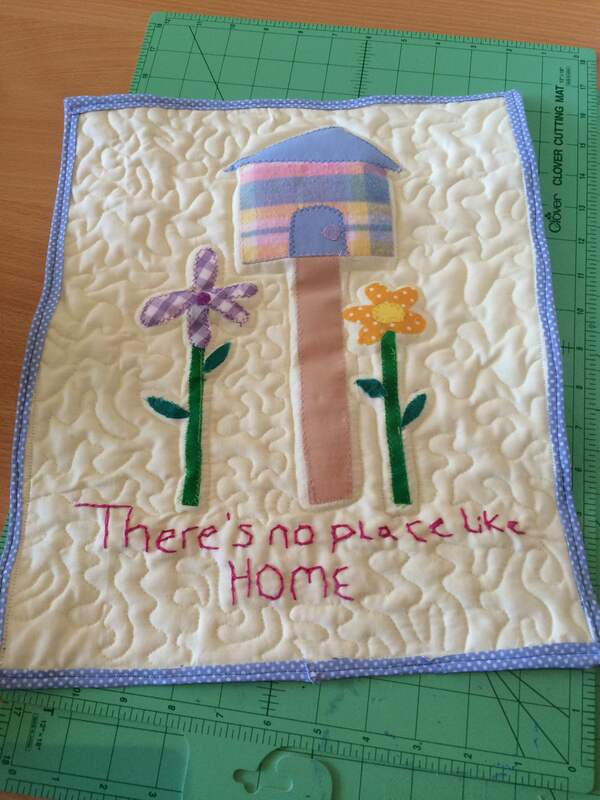 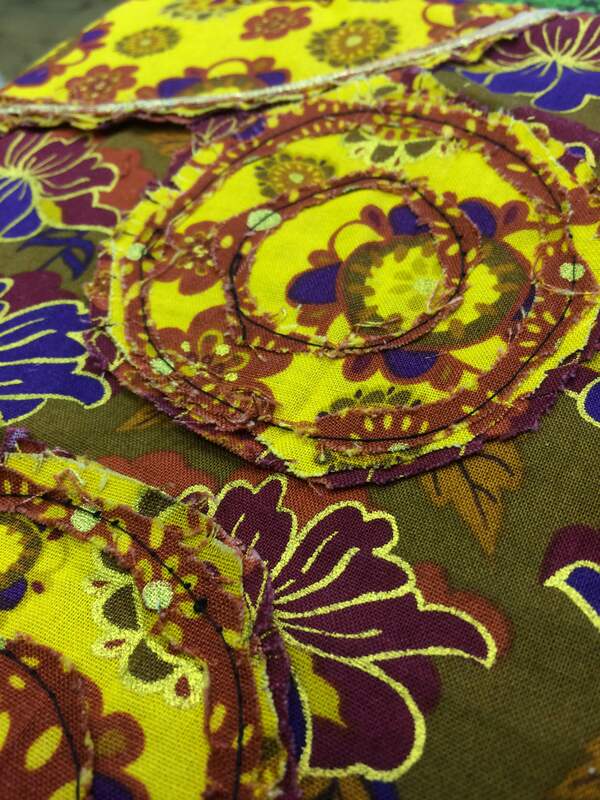 Then it was on to the 2nd evening of the quilting course and yet again I’m so pleased with the results. 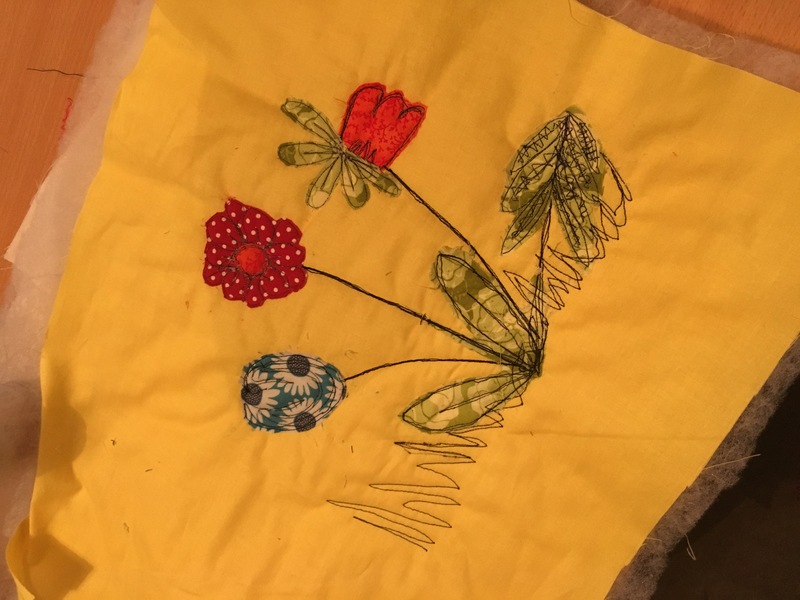 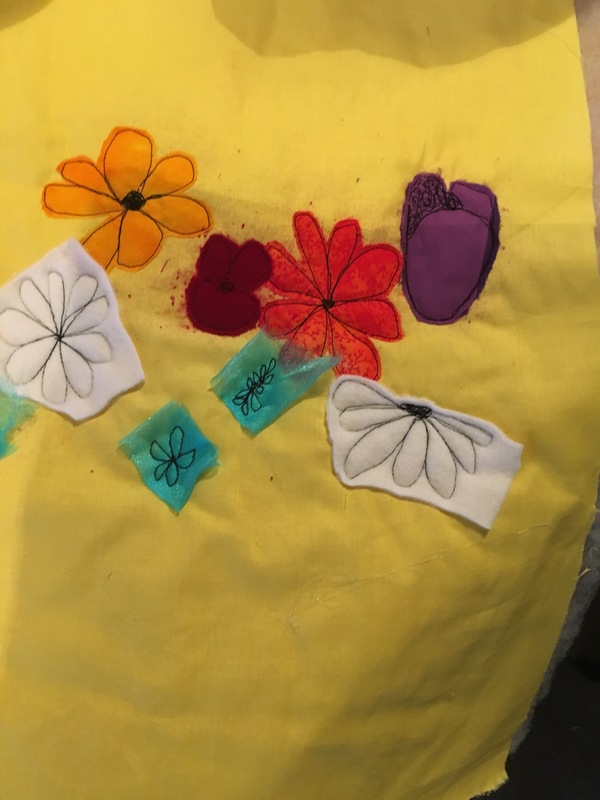 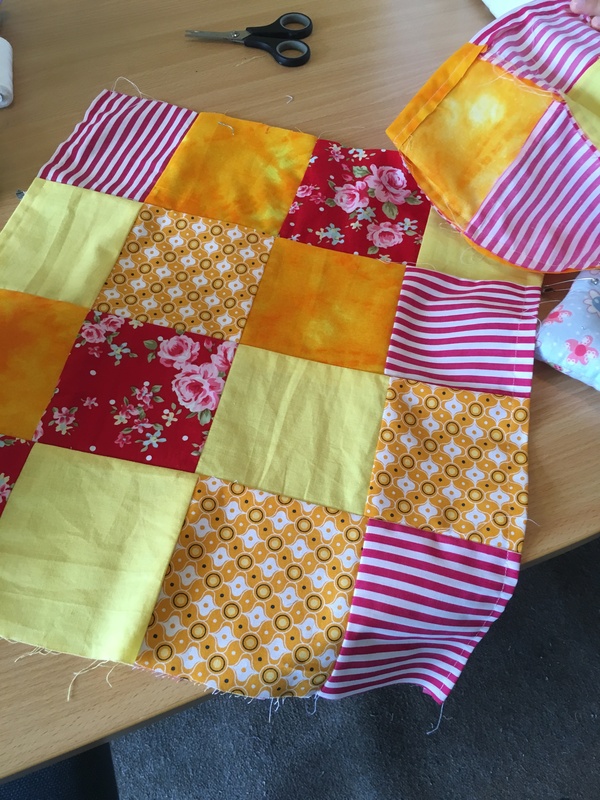 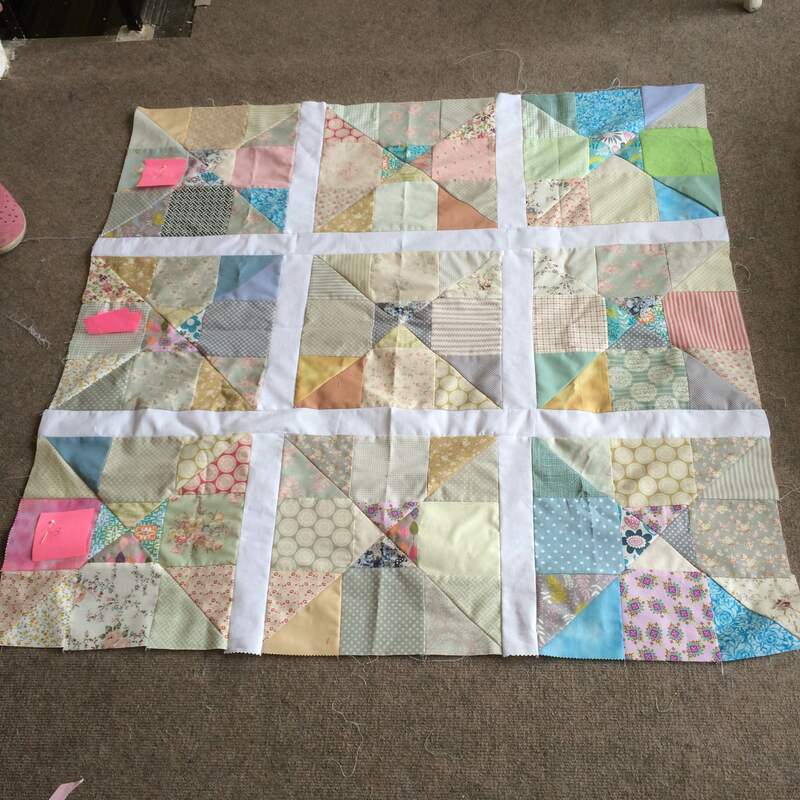 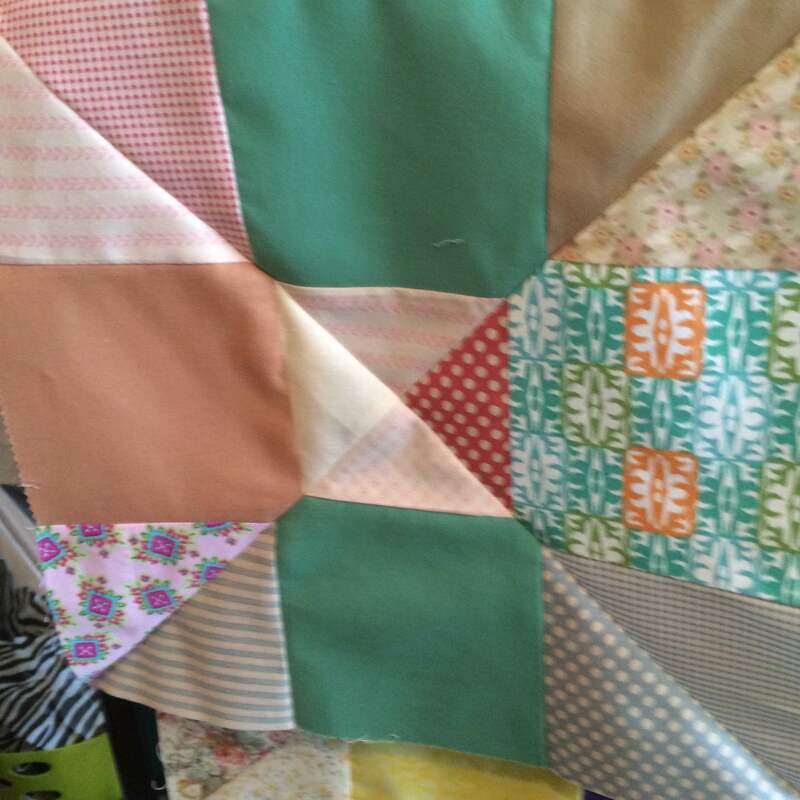 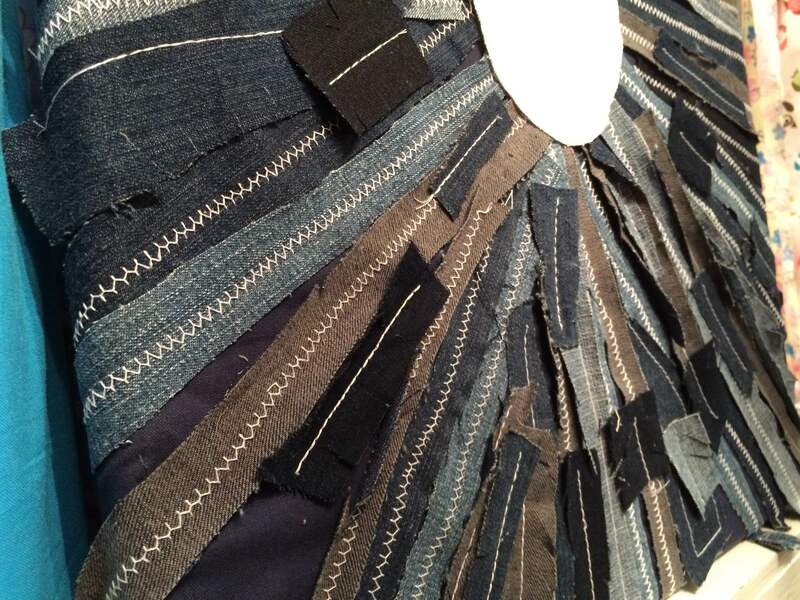 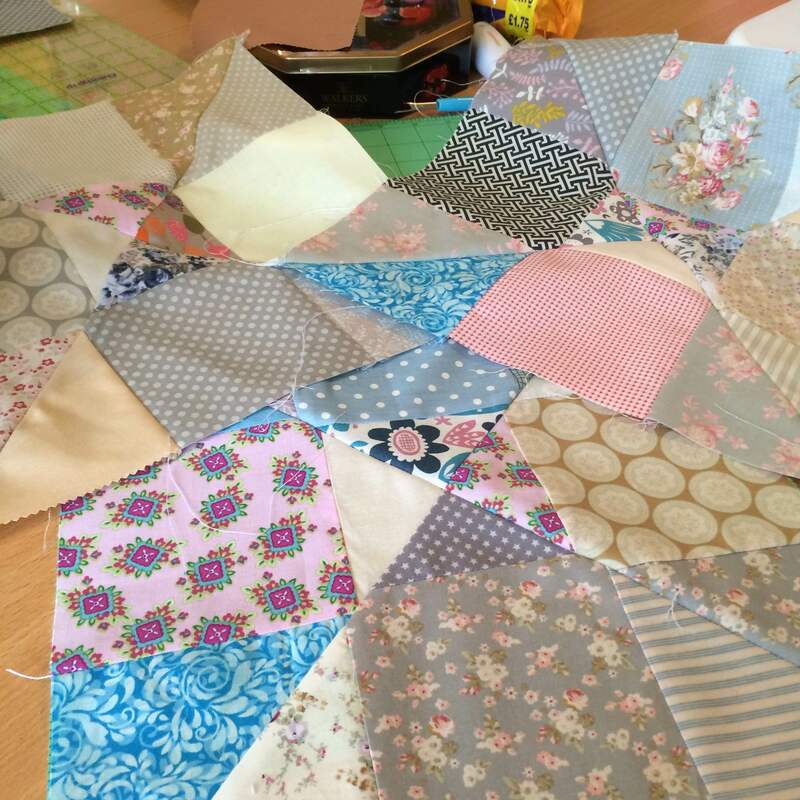 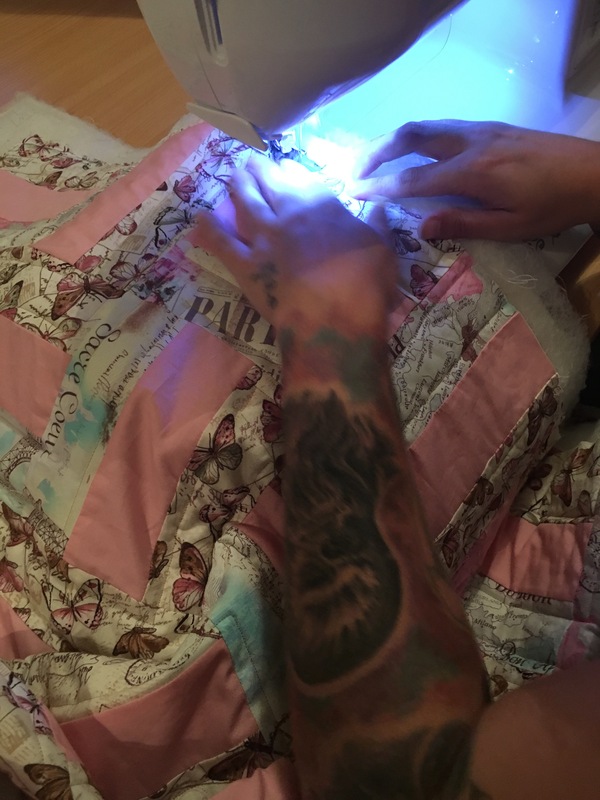 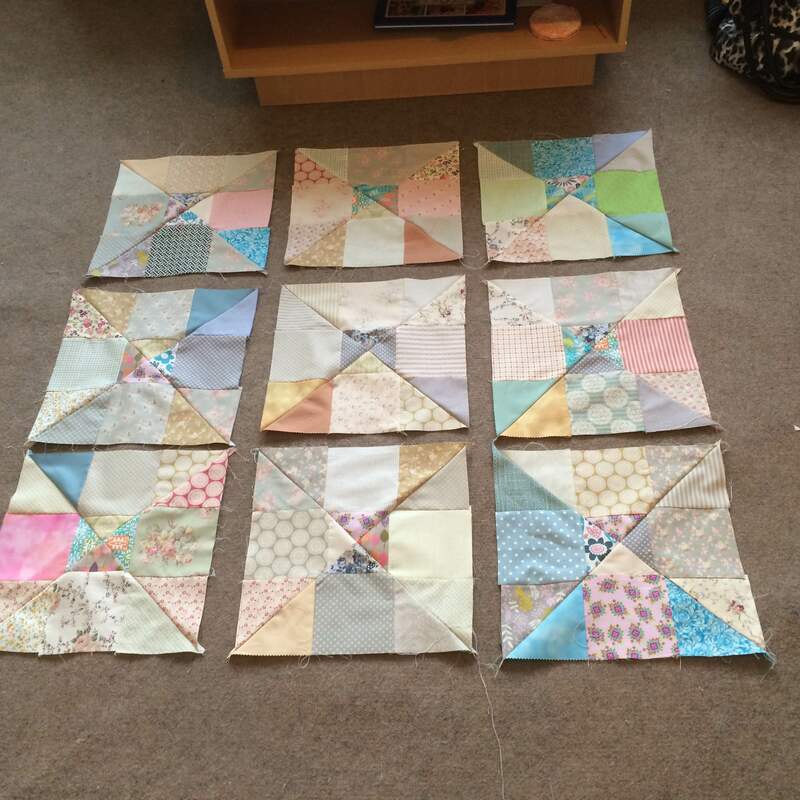 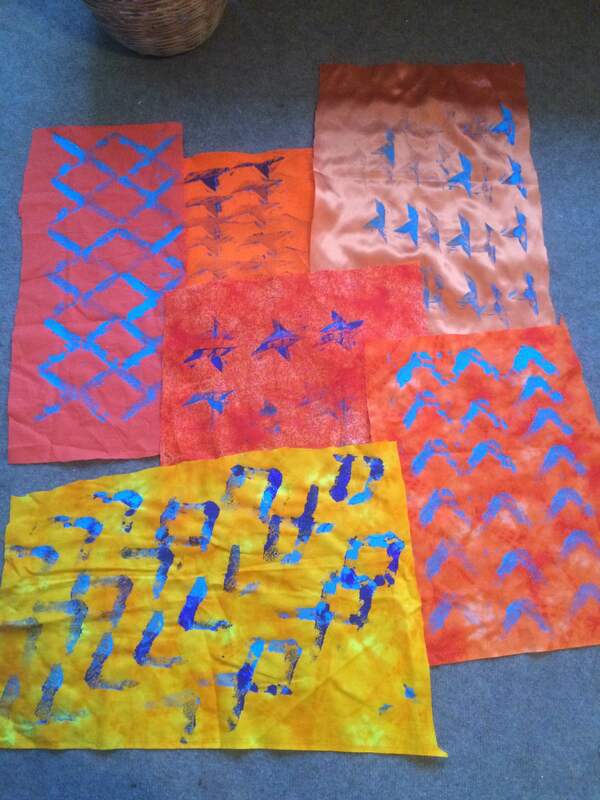 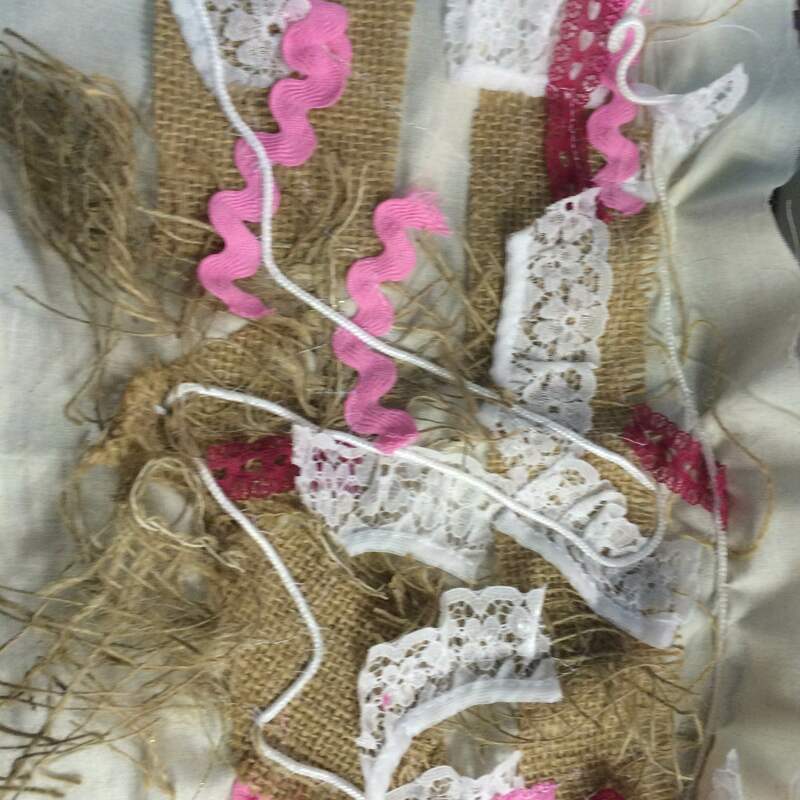 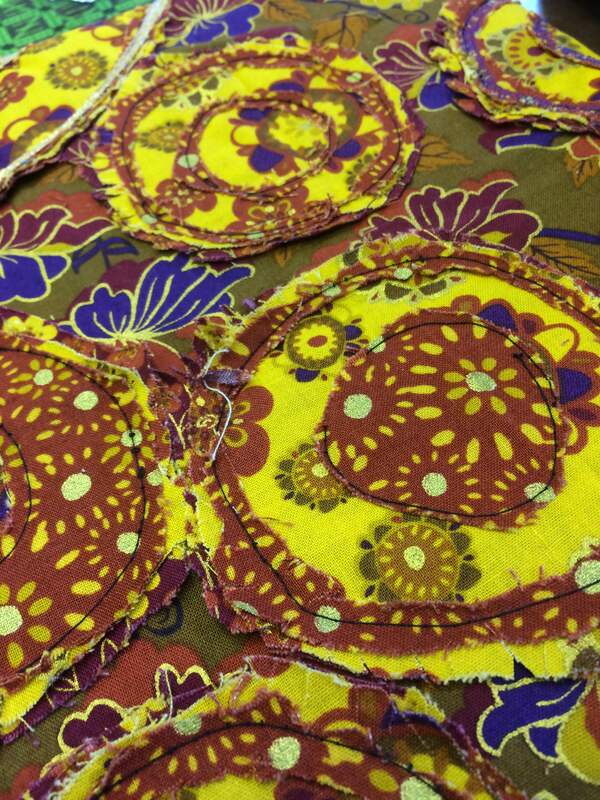 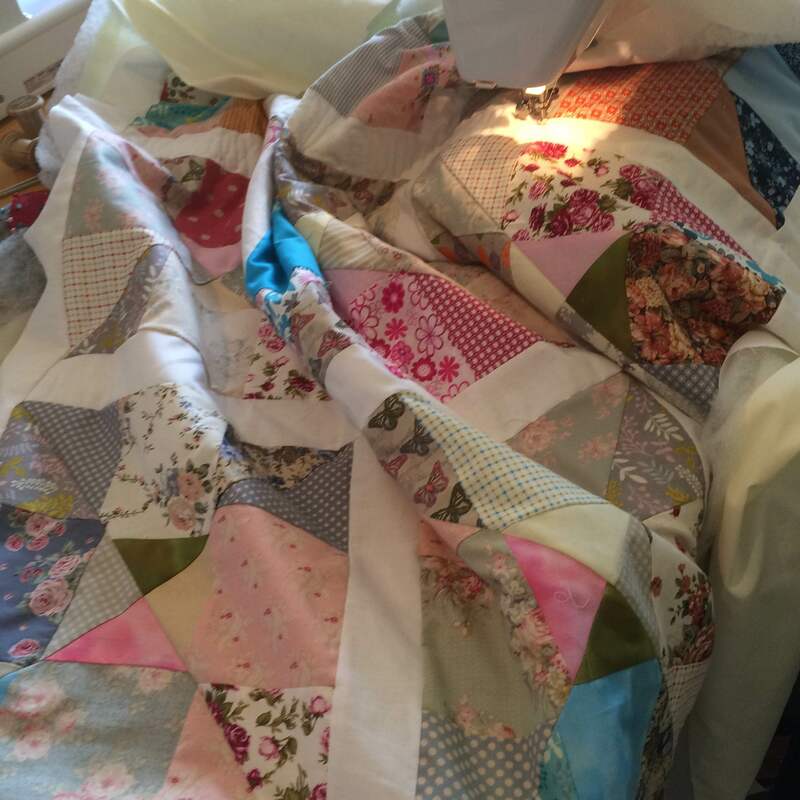 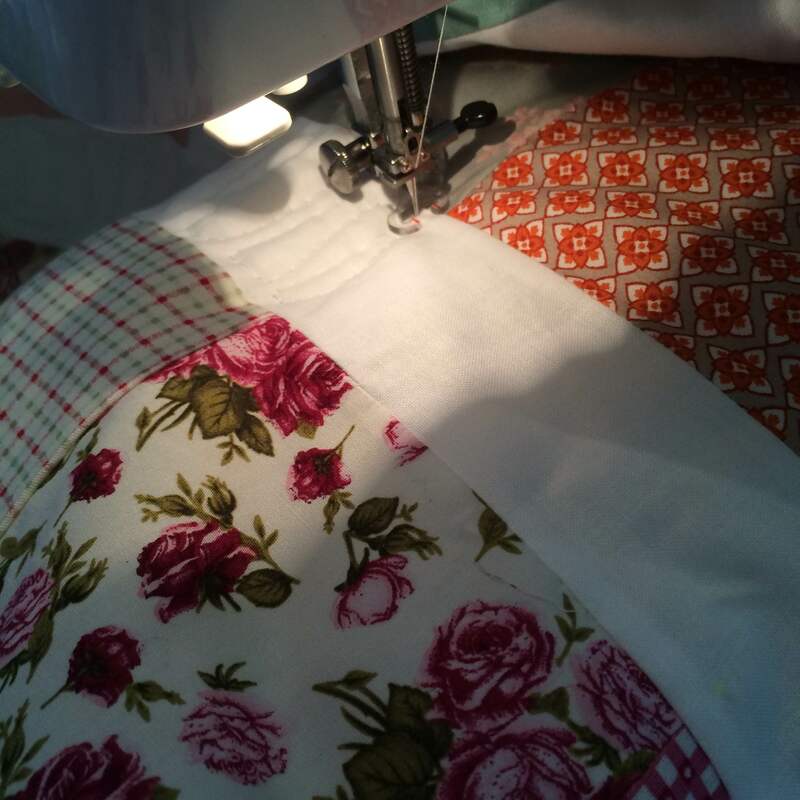 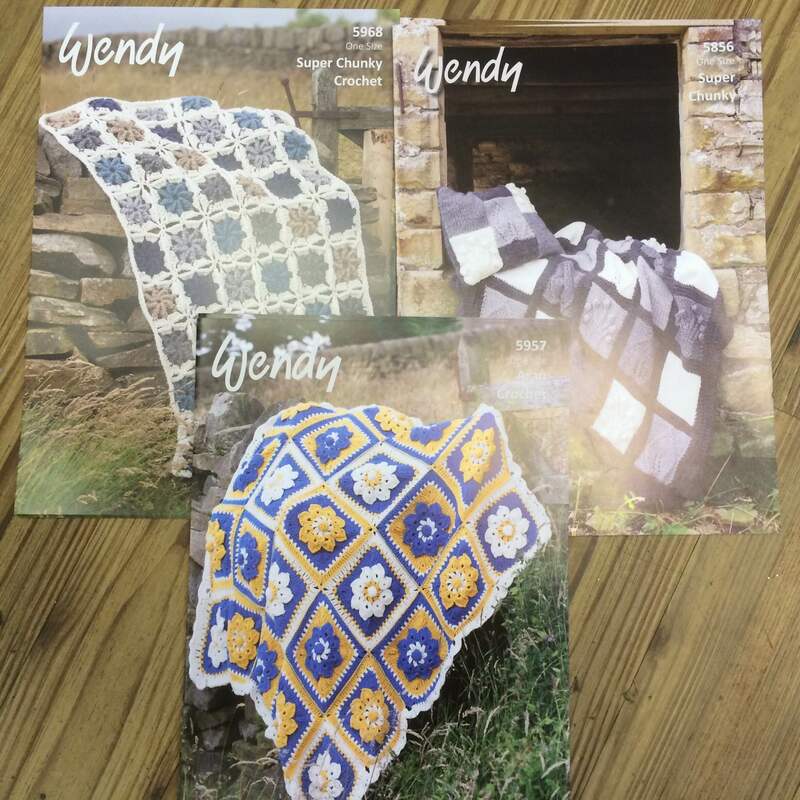 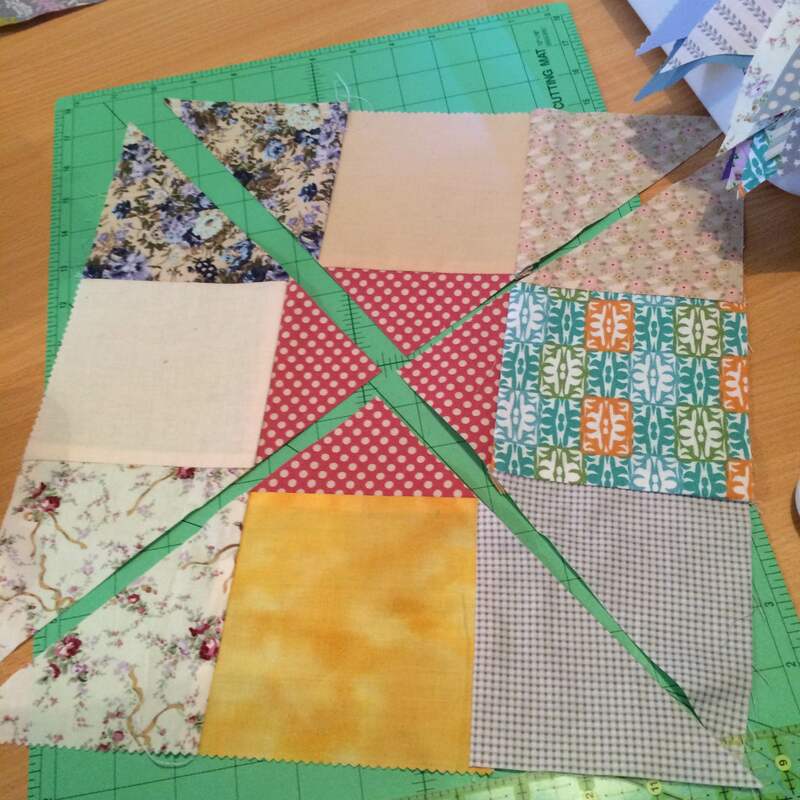 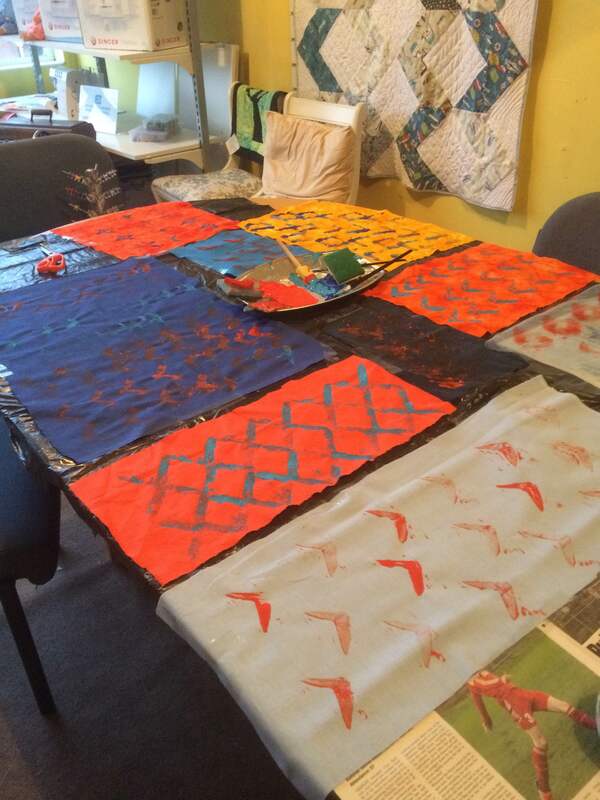 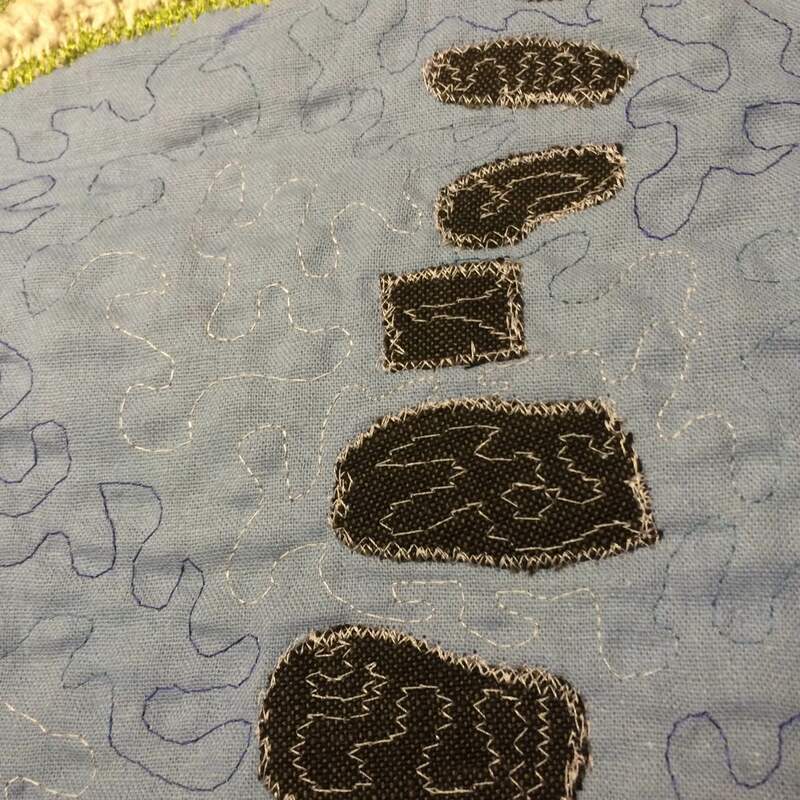 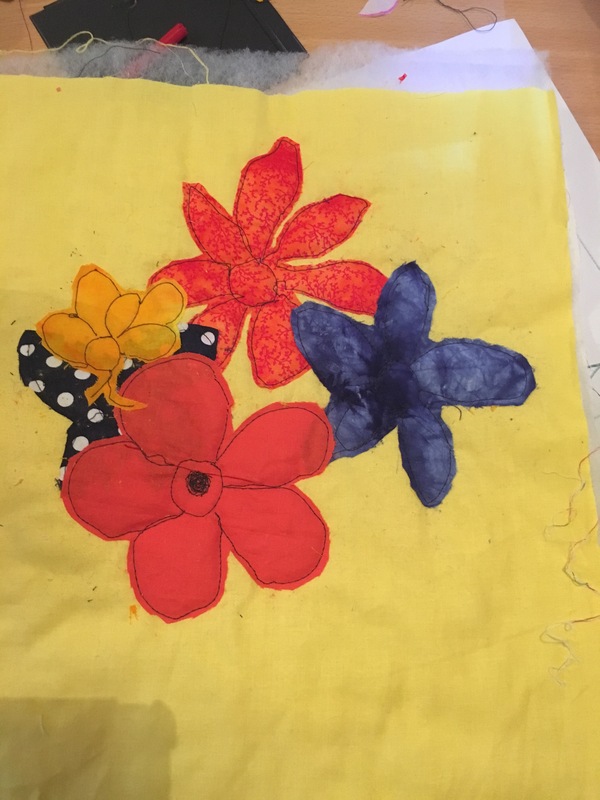 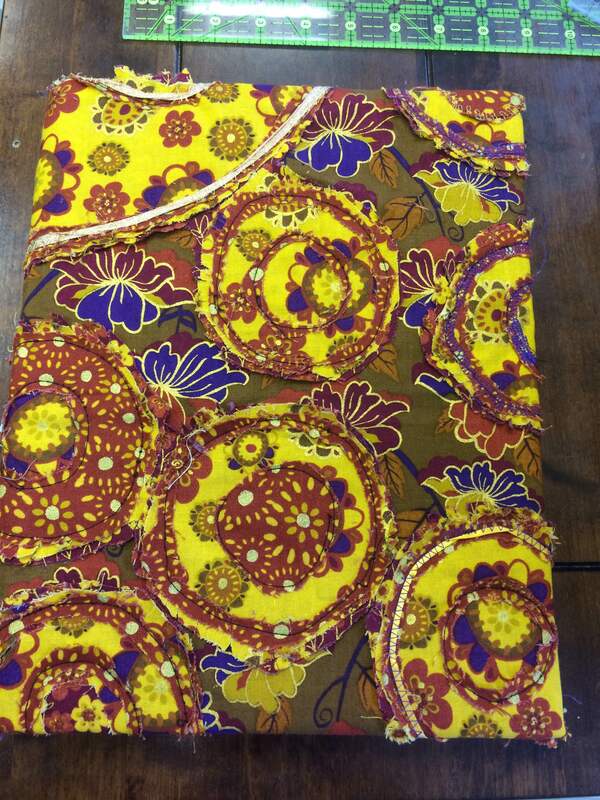 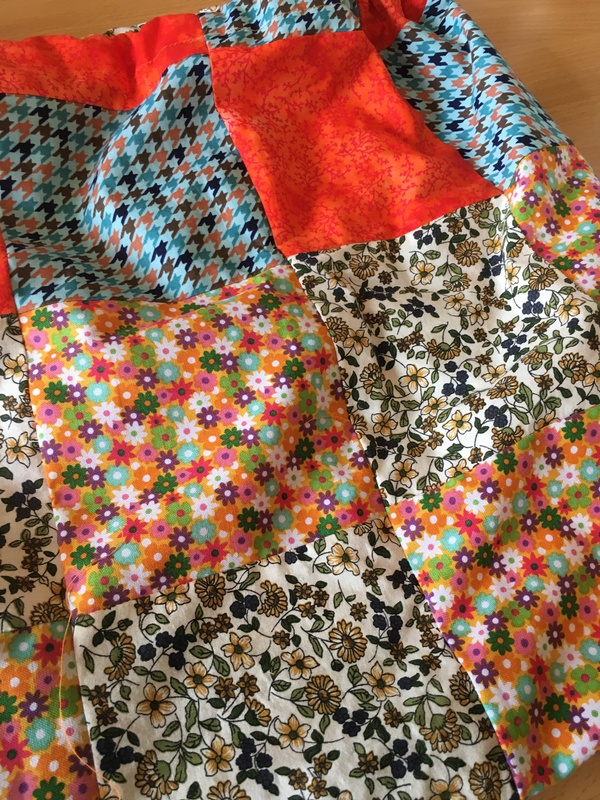 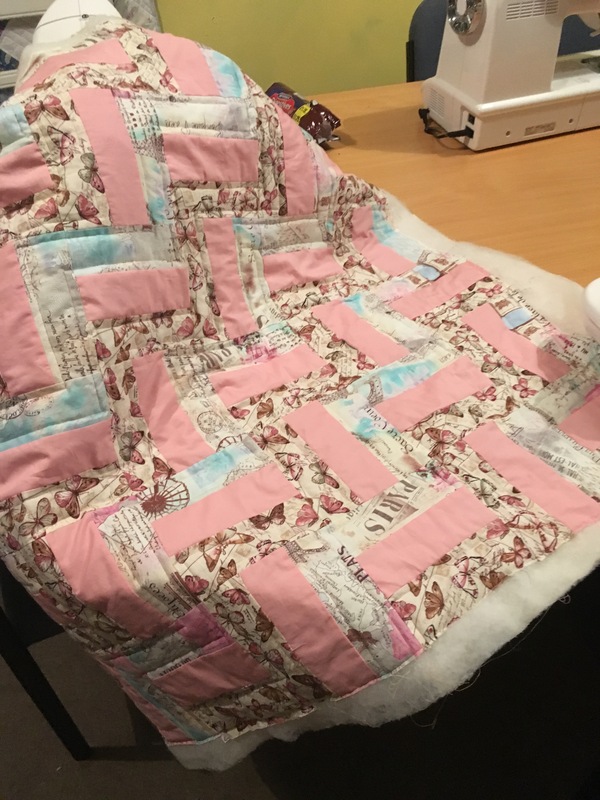 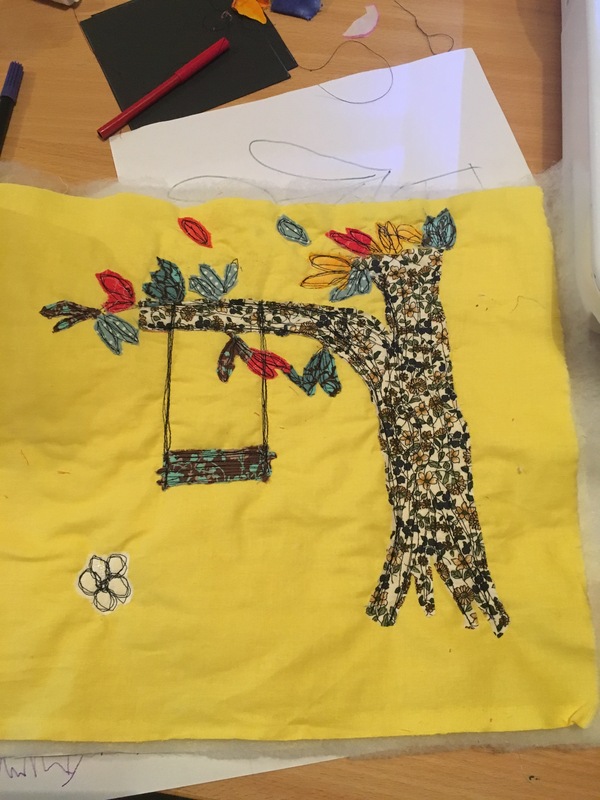 The ladies worked extremely hard and I can’t wait to see the finished quilts…. 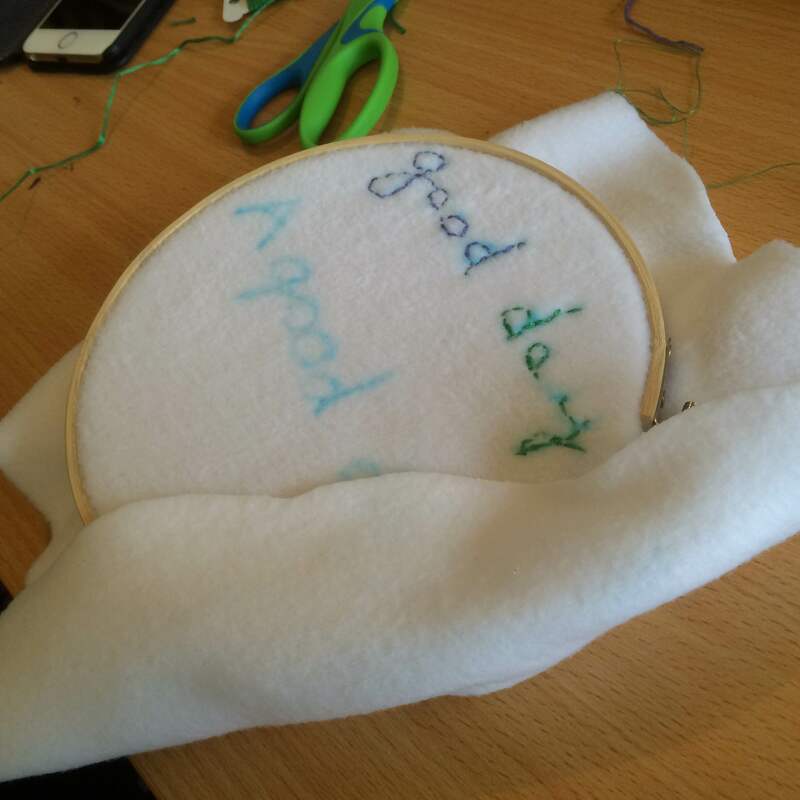 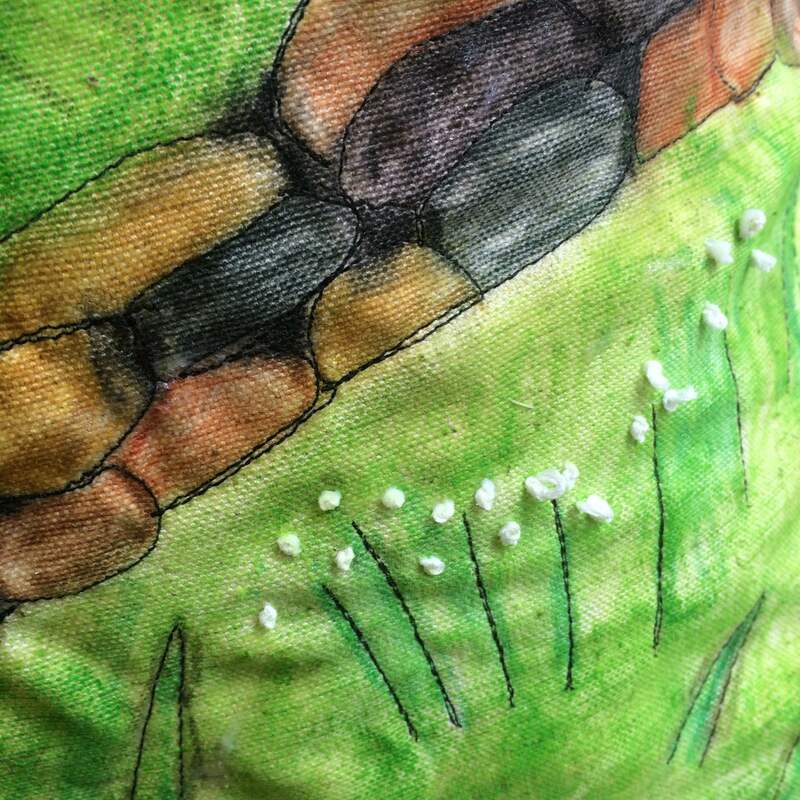 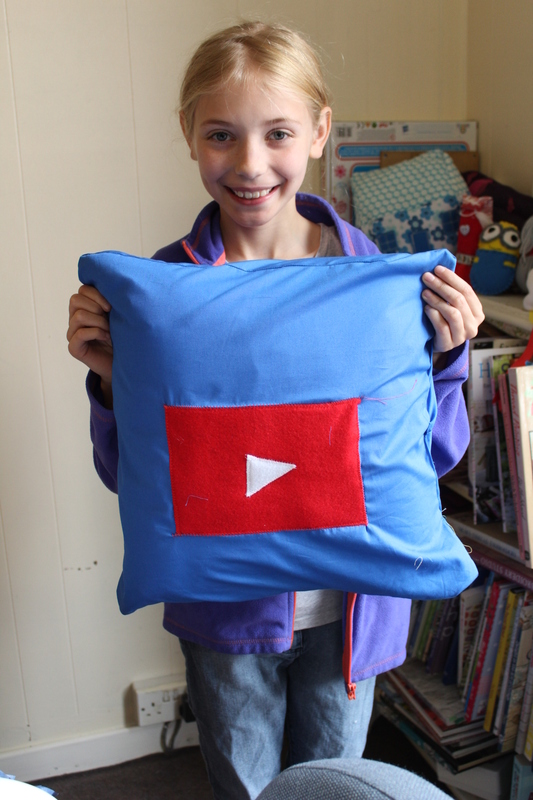 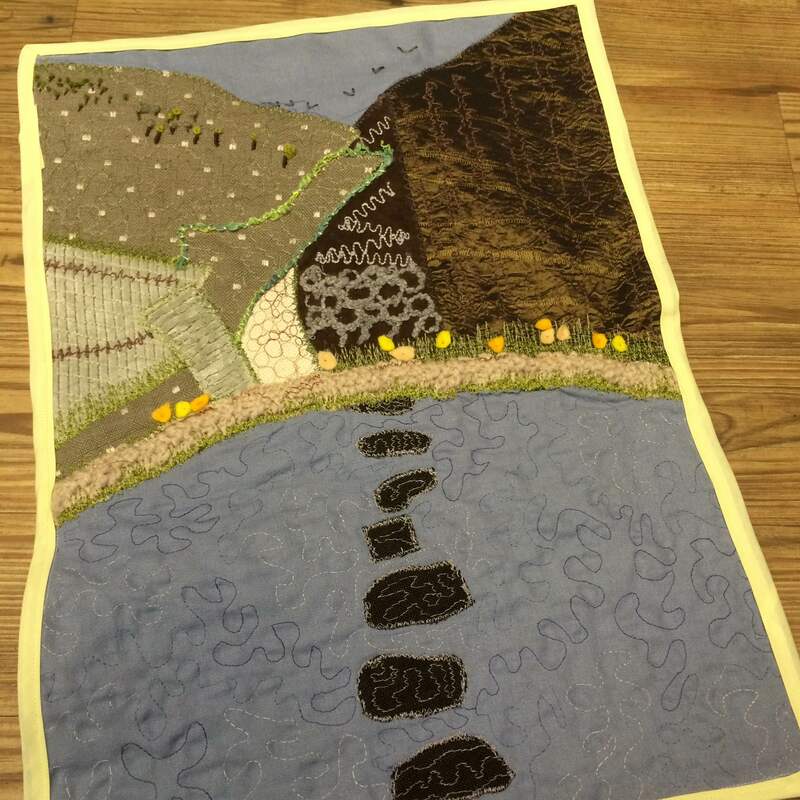 I’ve had a little bit of time to get some stitching finished…. 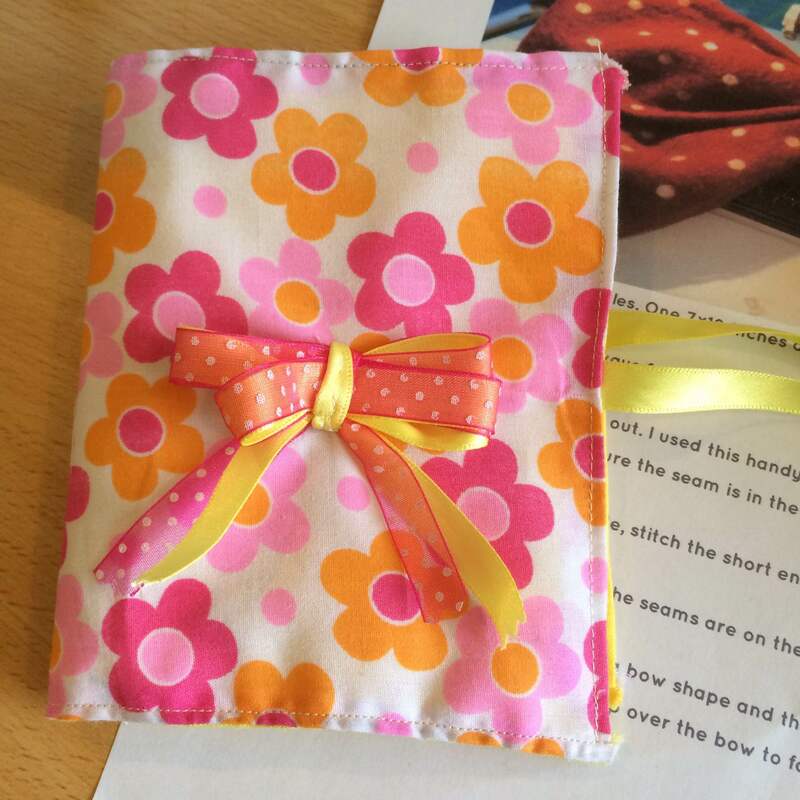 Thank you to everyone that reads our blog. 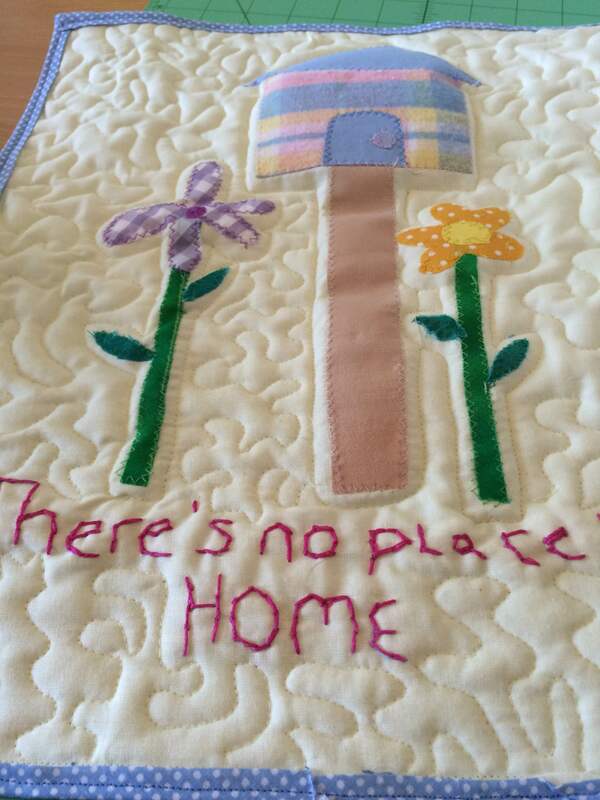 We are gaining more readers and followers recently which means so much. 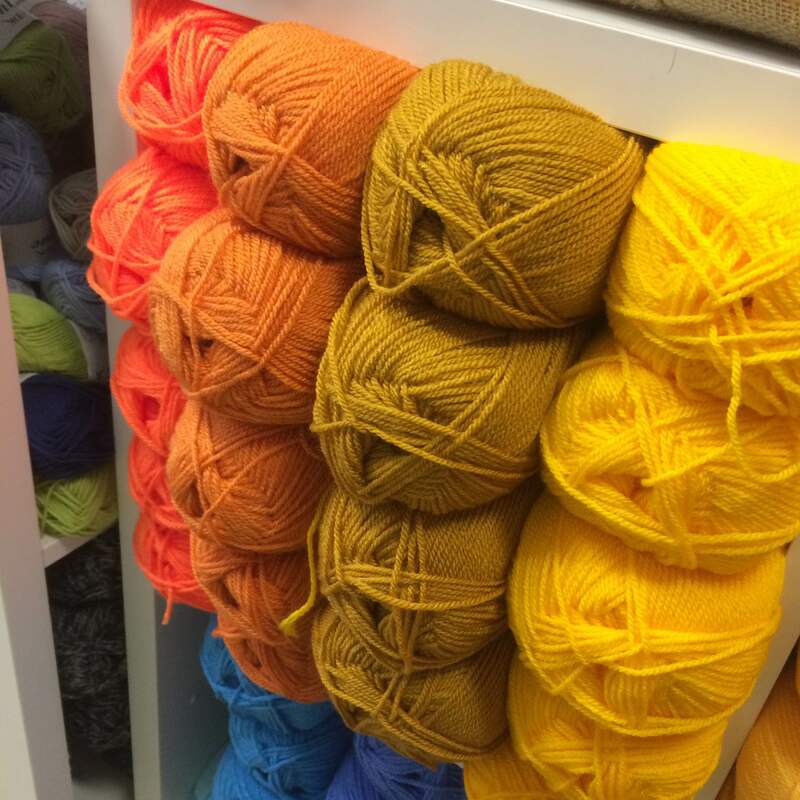 Lets crack on with the week shall we? 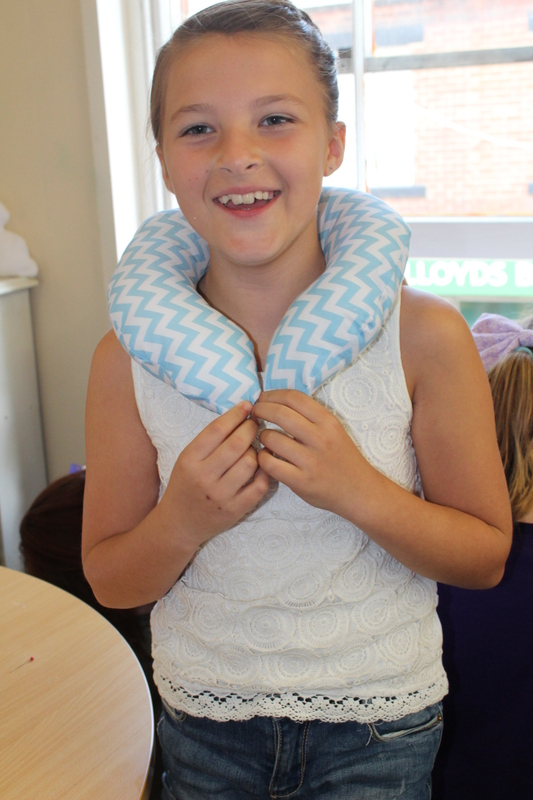 Its been a short week but still packed with fun ! 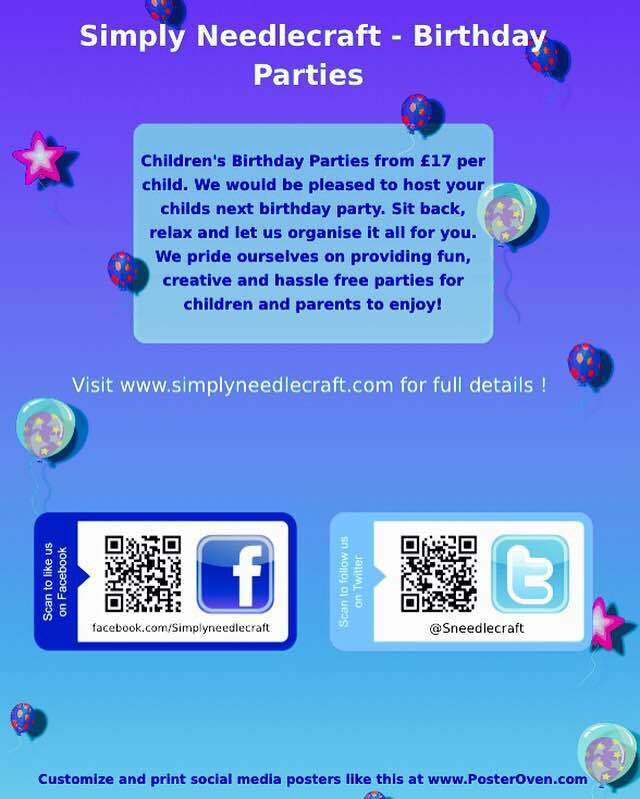 Our children’s Party plans are going well. 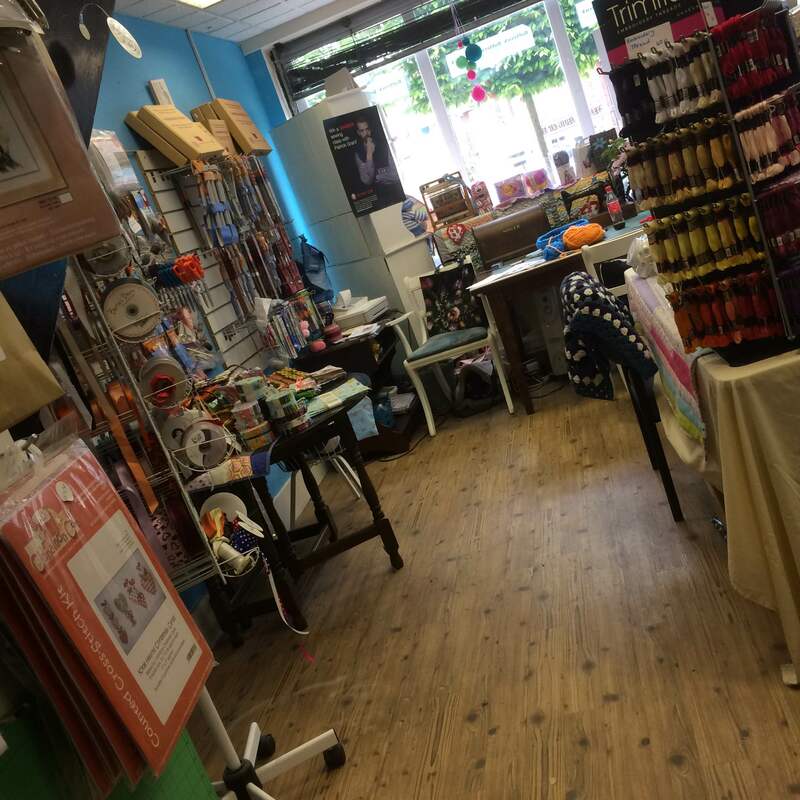 To find out more please click here here you’ll be able to get info on packages and prices as well as booking. 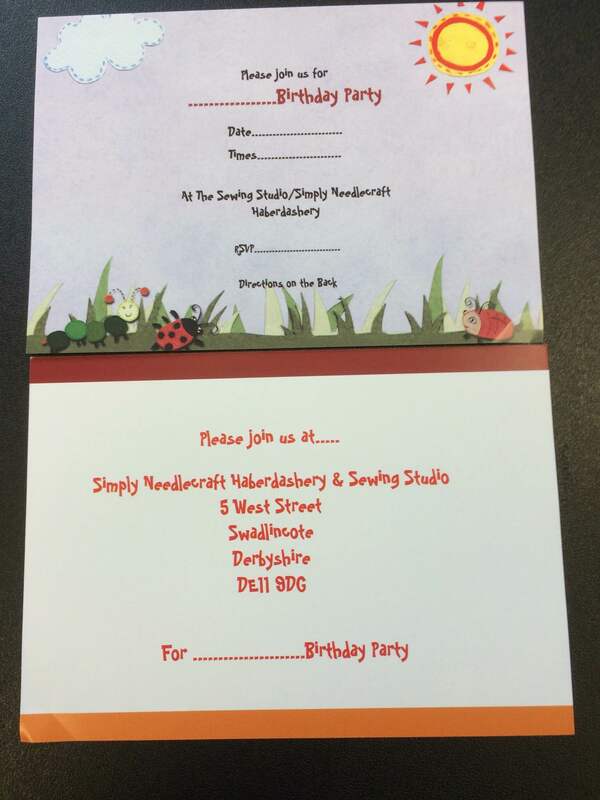 Our party invitations arrived too this week…. 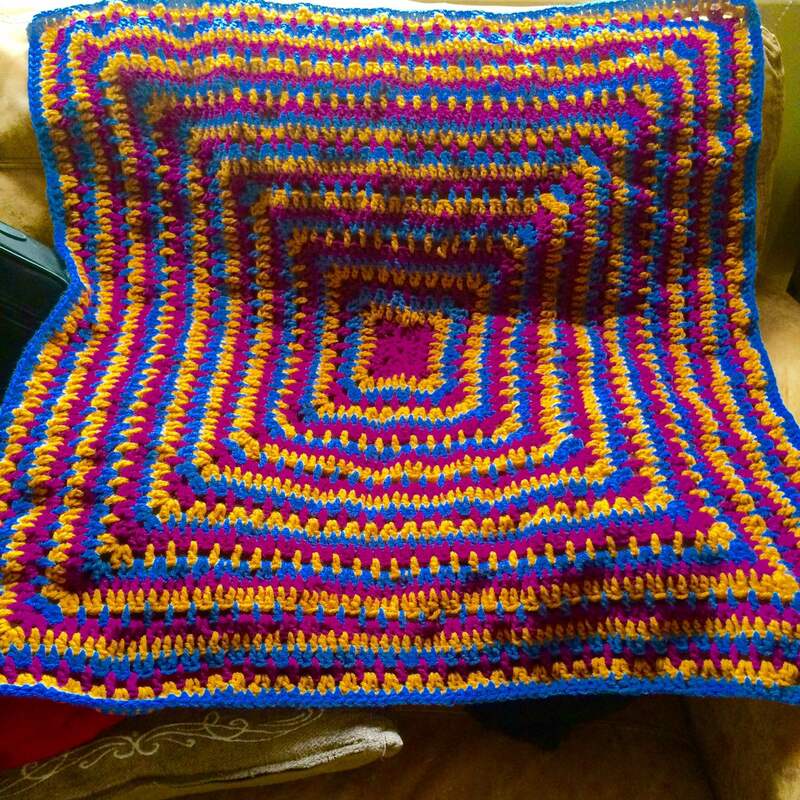 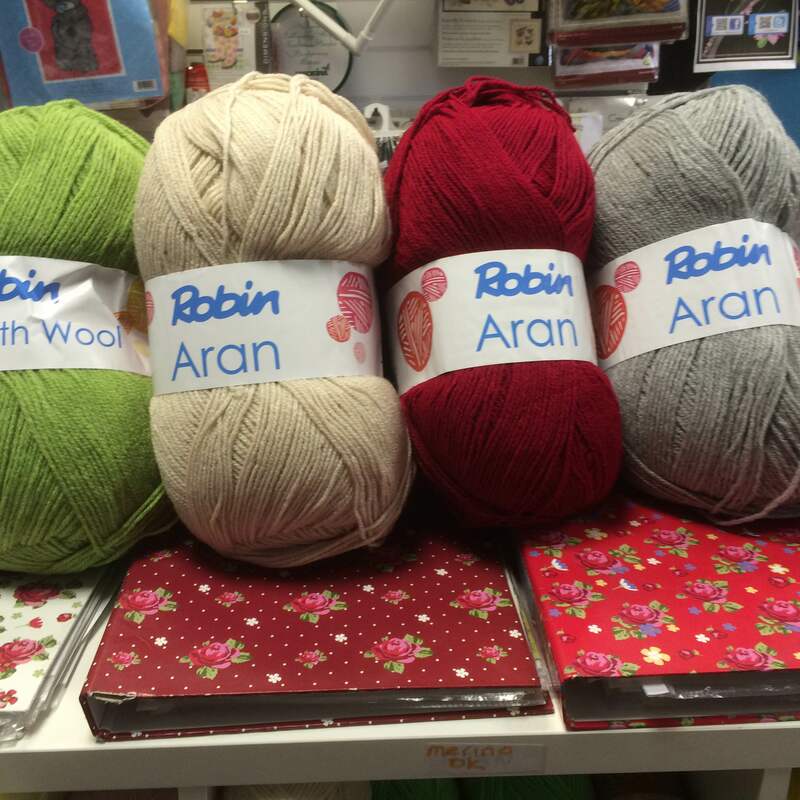 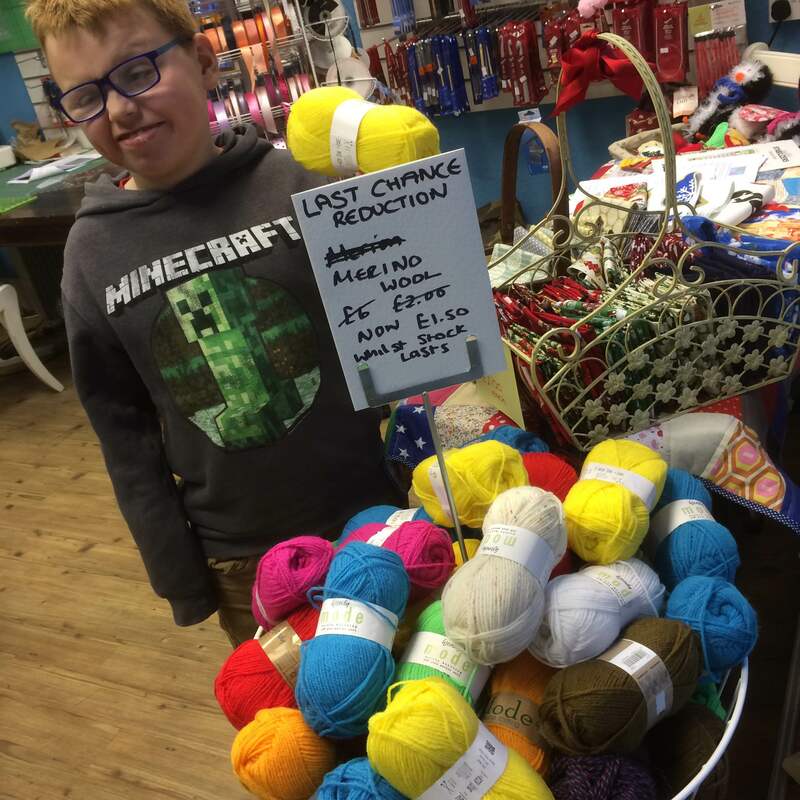 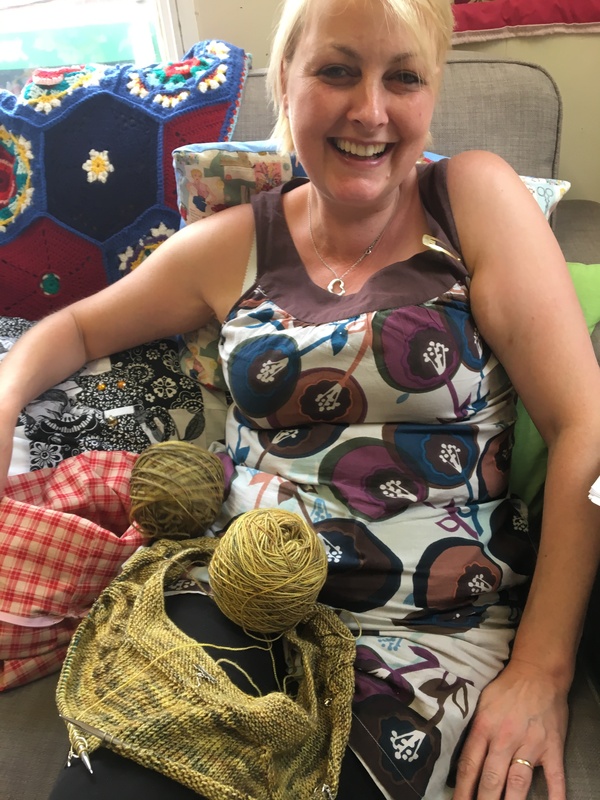 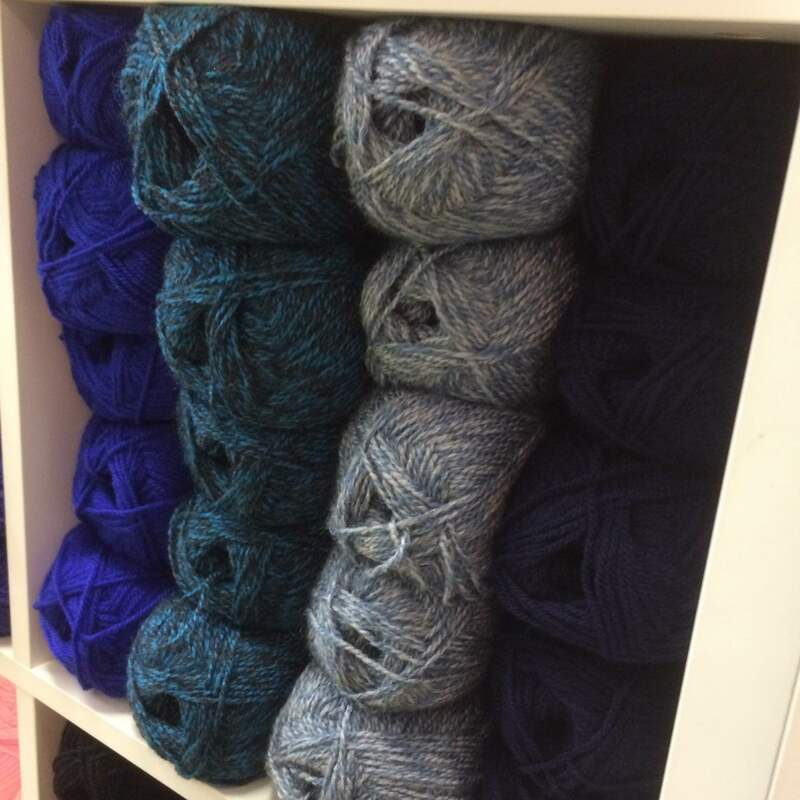 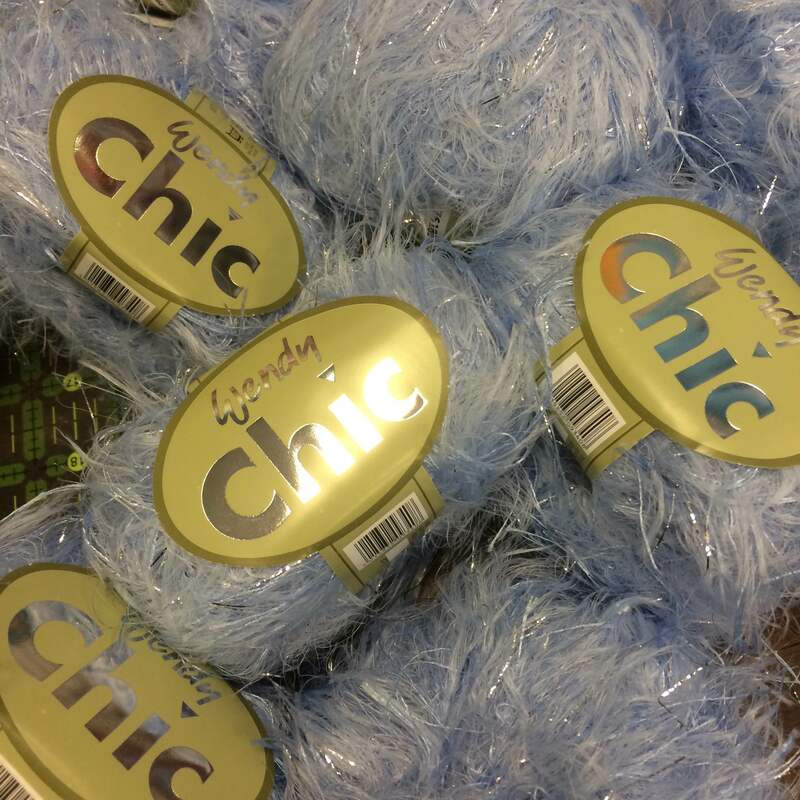 The Big News – Yarn Bombing ! 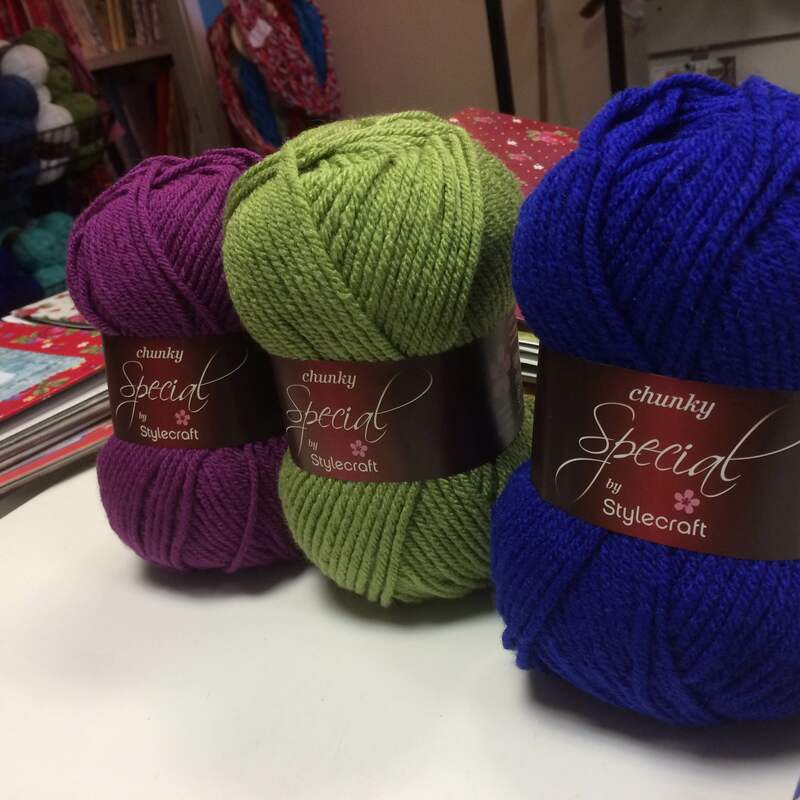 Yes you heard right ! 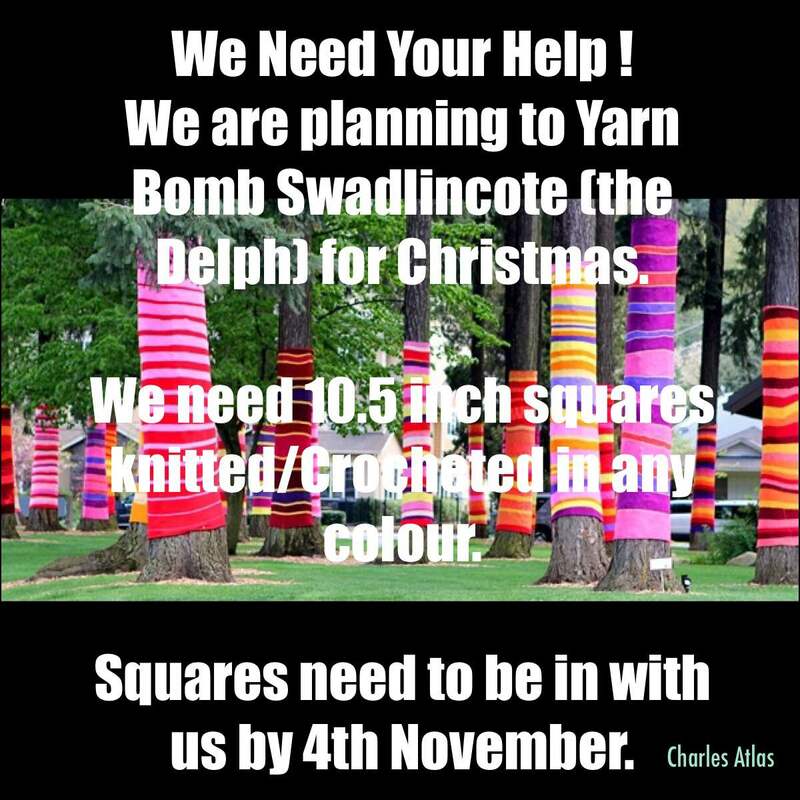 The local council has agreed to let us yarn bomb the town (the Delph) for Christmas. 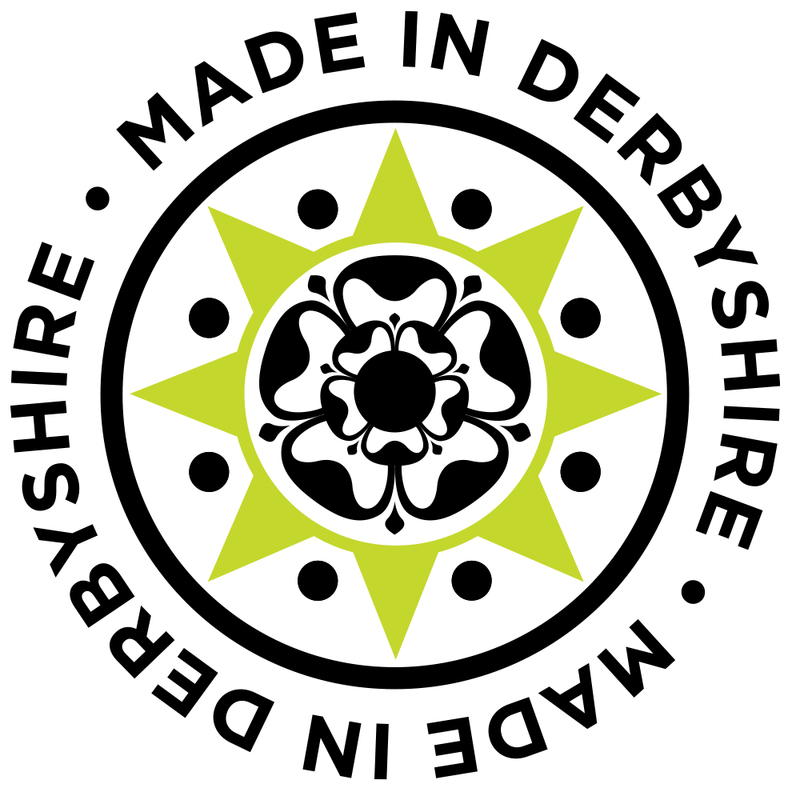 The displays will be put on show on the day of the Christmas light switch on event and will remain up until new year. 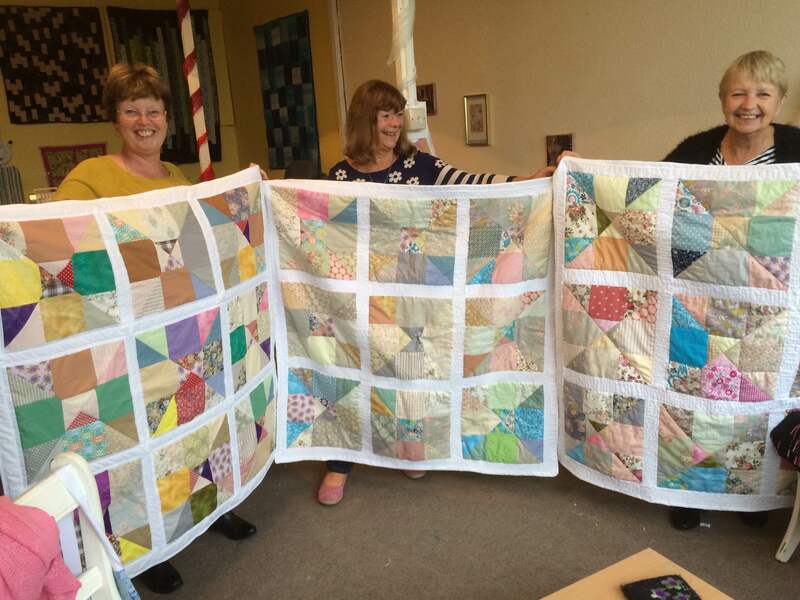 I had a very proud moment when my ladies from this months quilting course finished their lap quilts using a disappearing nine patch design. 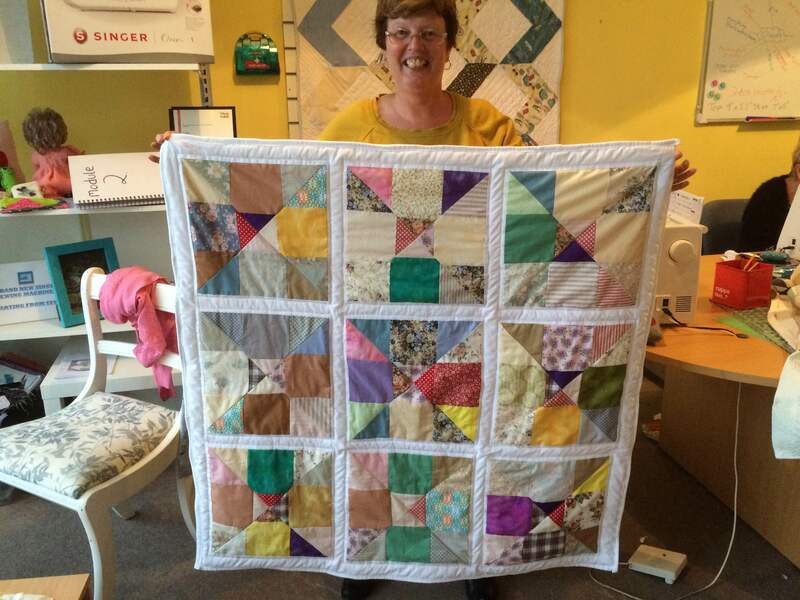 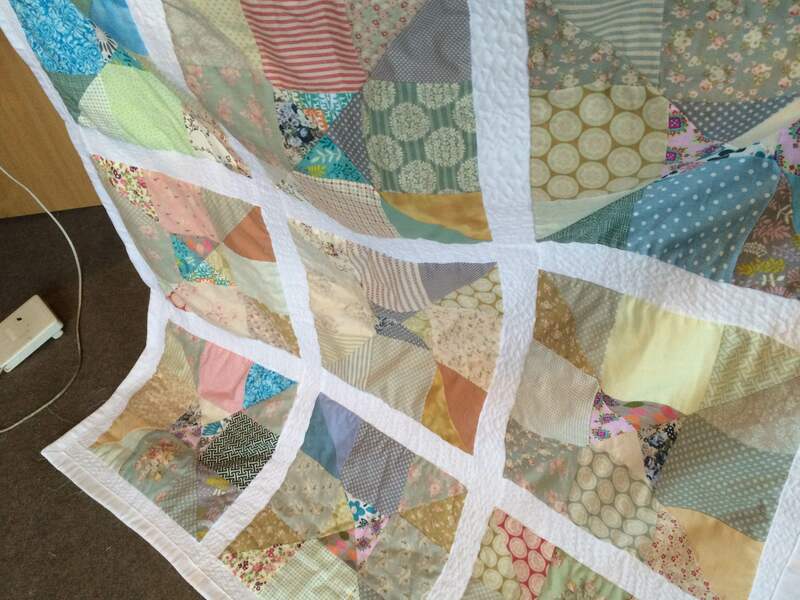 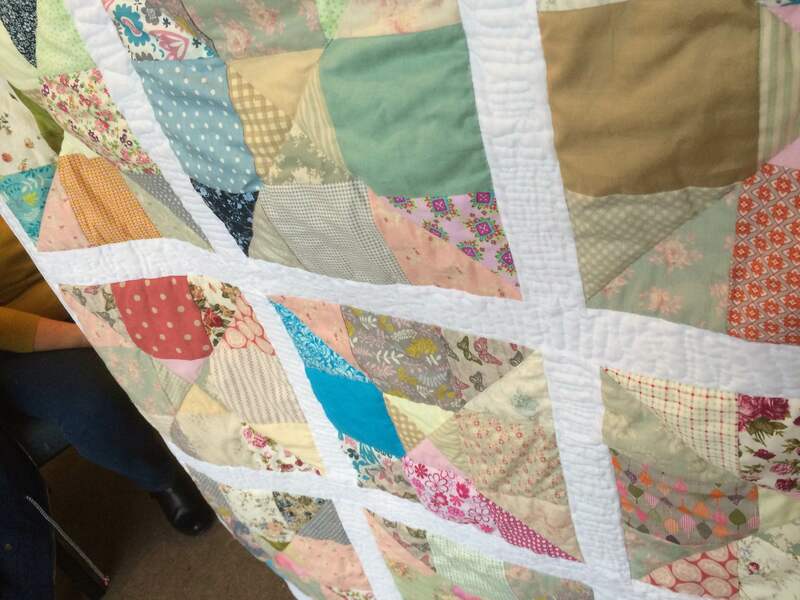 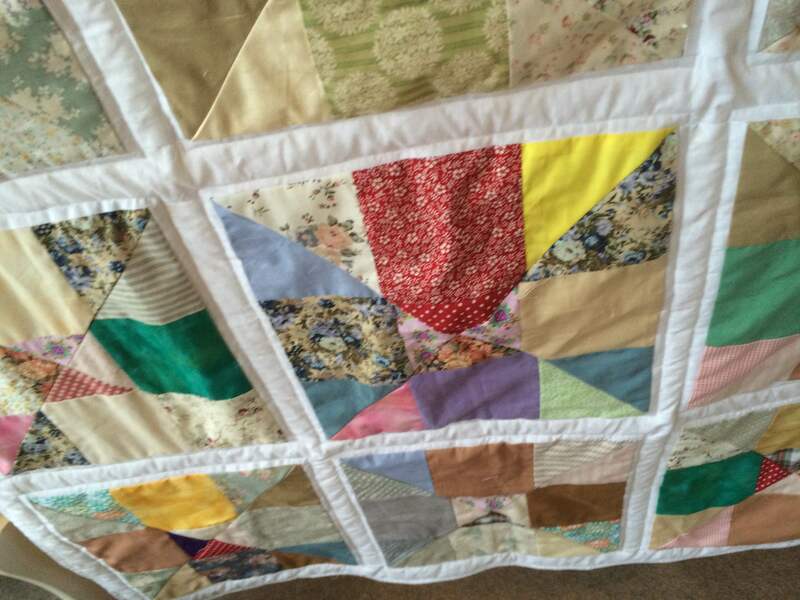 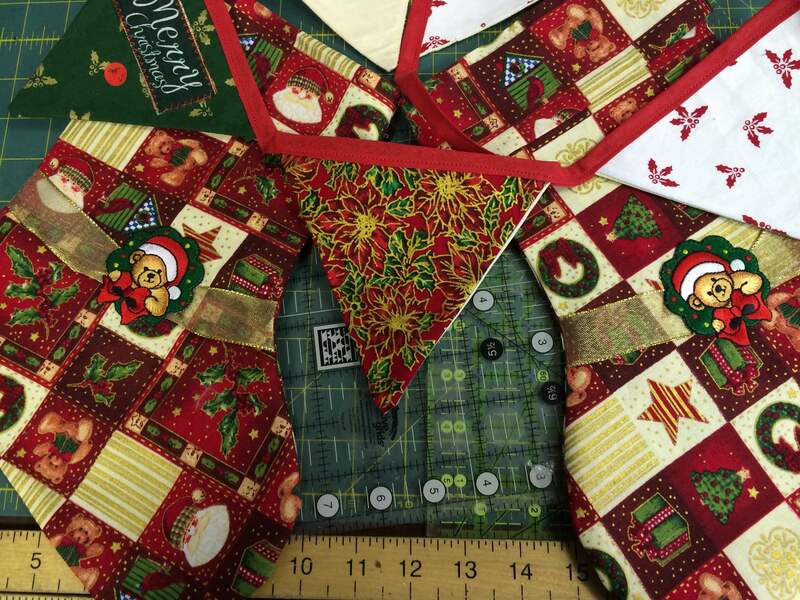 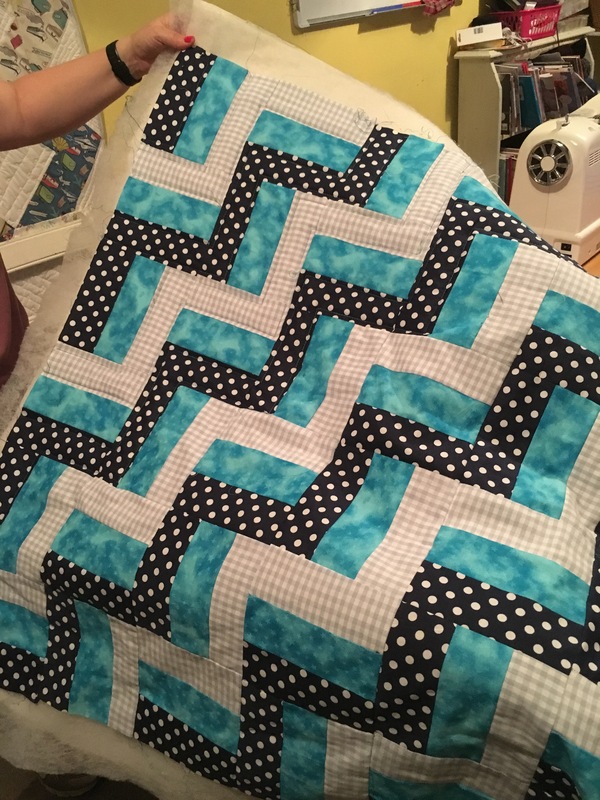 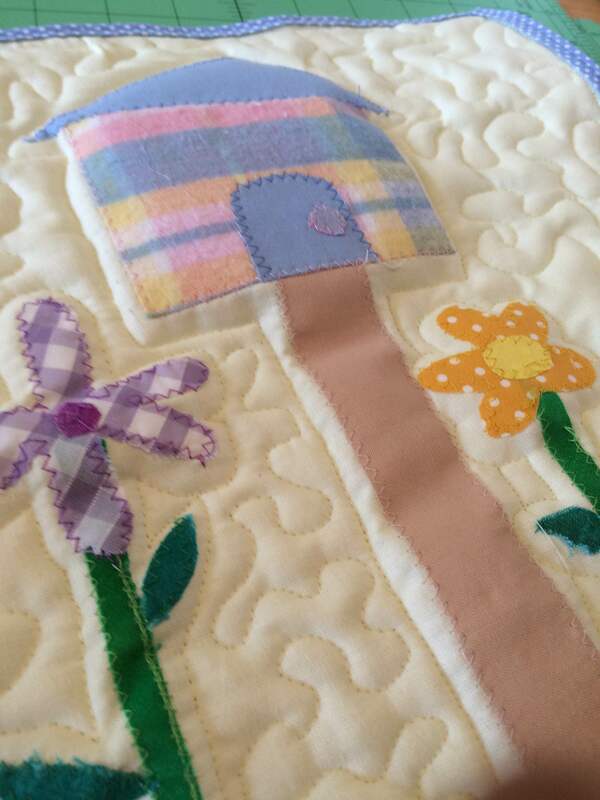 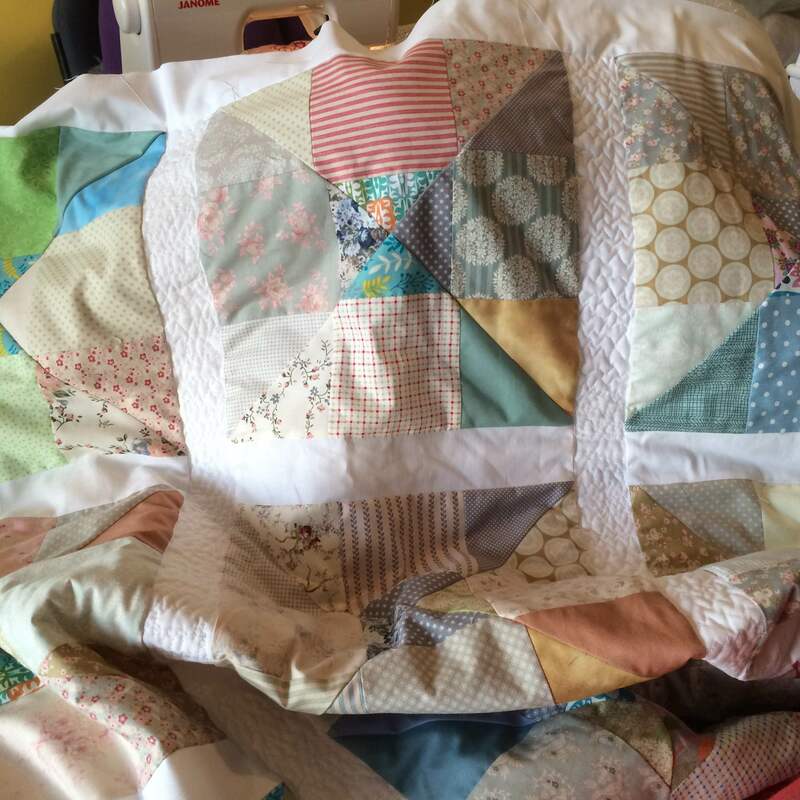 They have cut, sewn, pieced, basted, bordered, quilted and binded these gorgeous quilts. 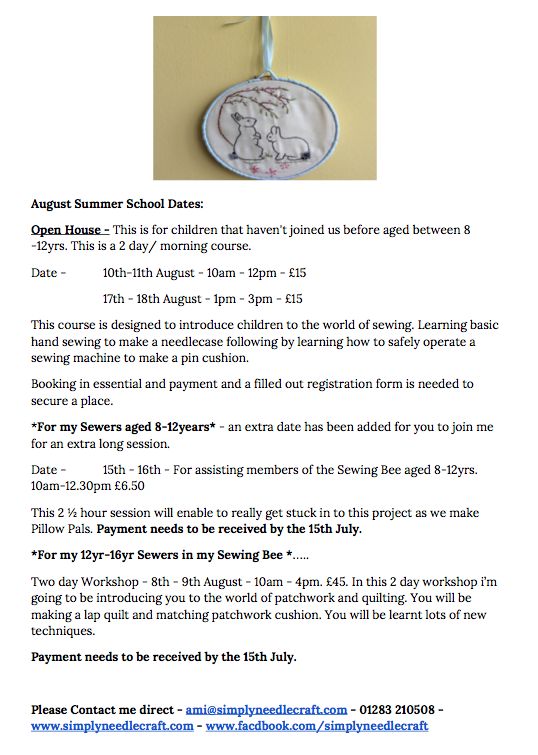 All beginners I might add. 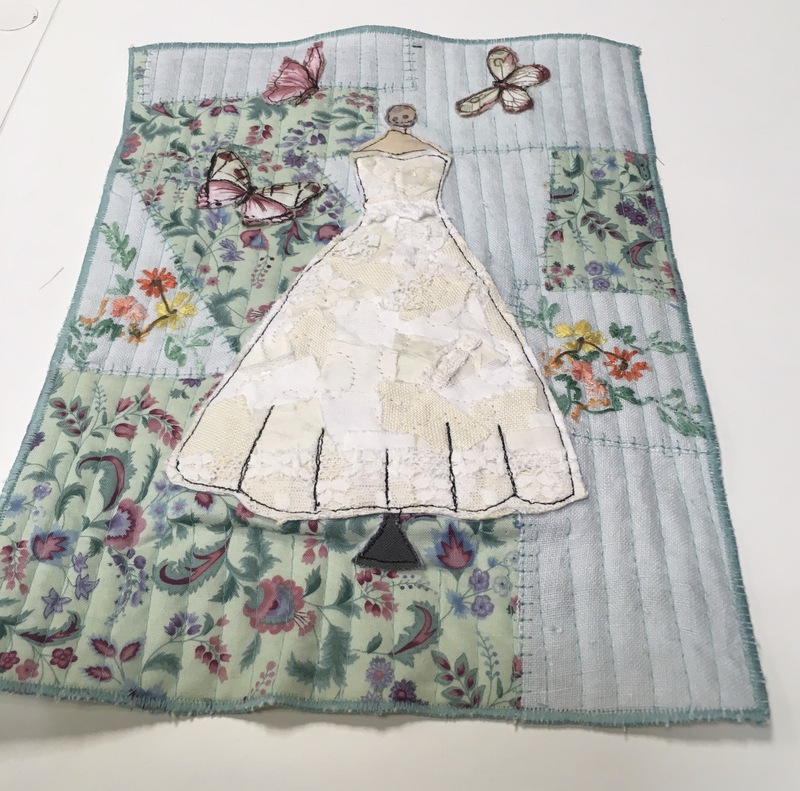 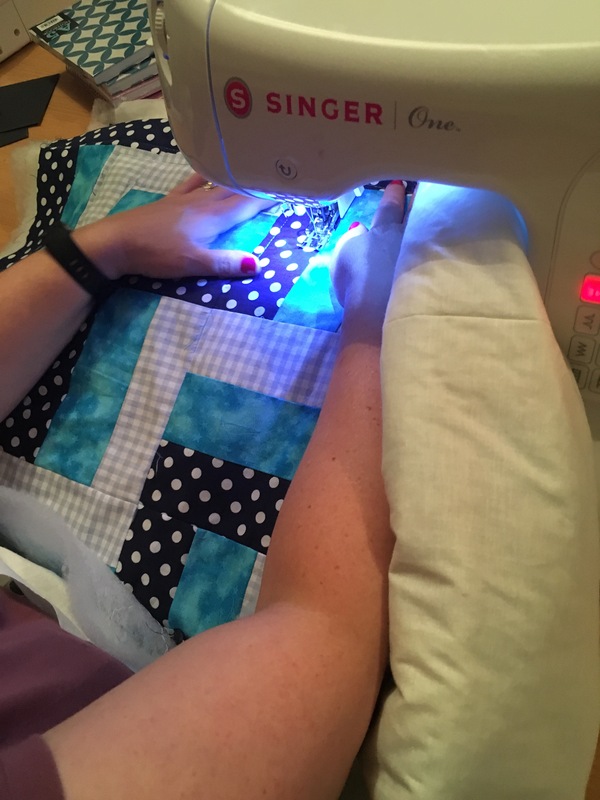 June’s quilting course – 3 part is full I’m afraid but next week I’ll be sitting down with my diary and planning dates for July. 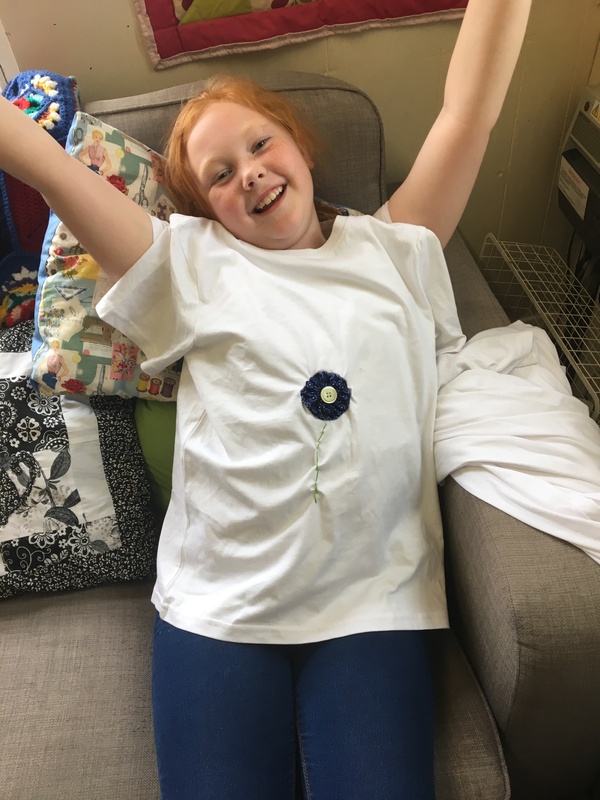 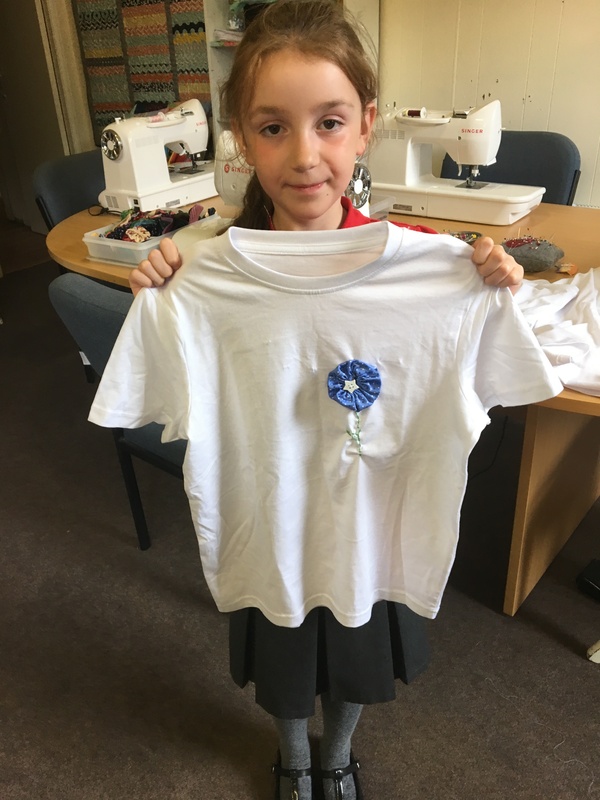 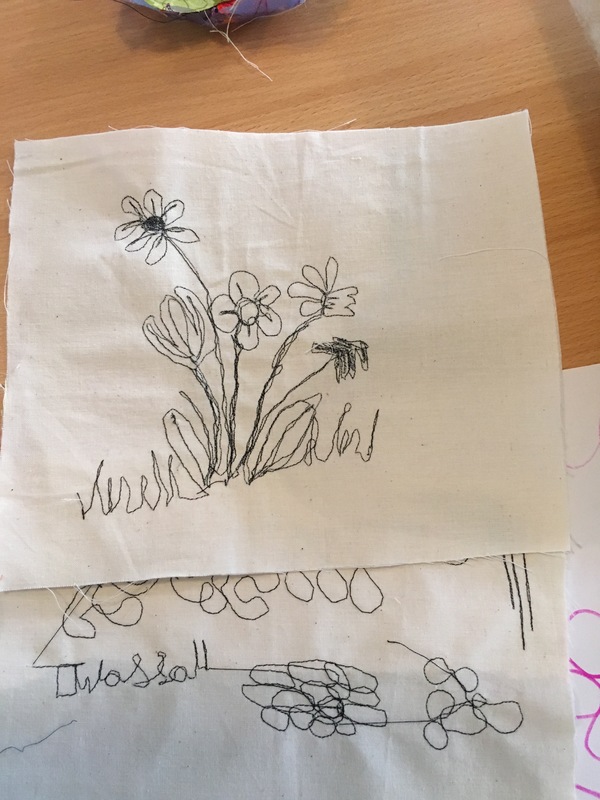 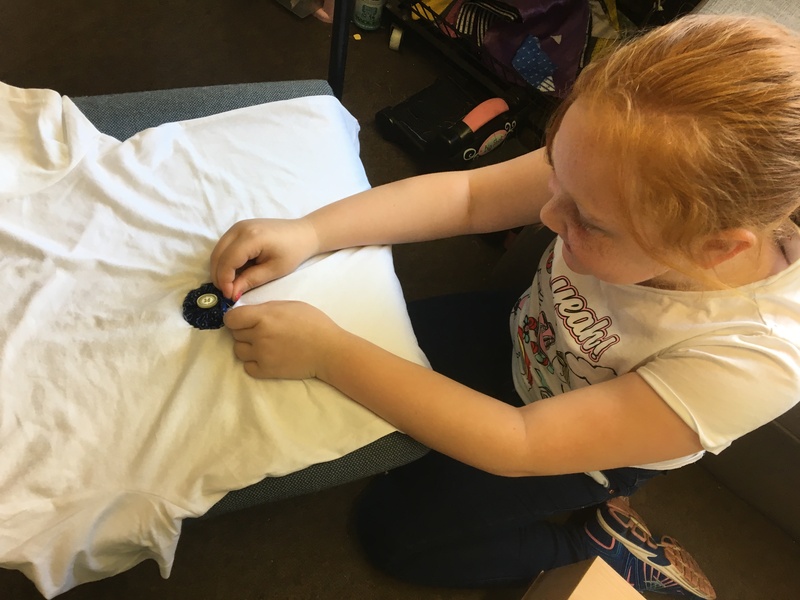 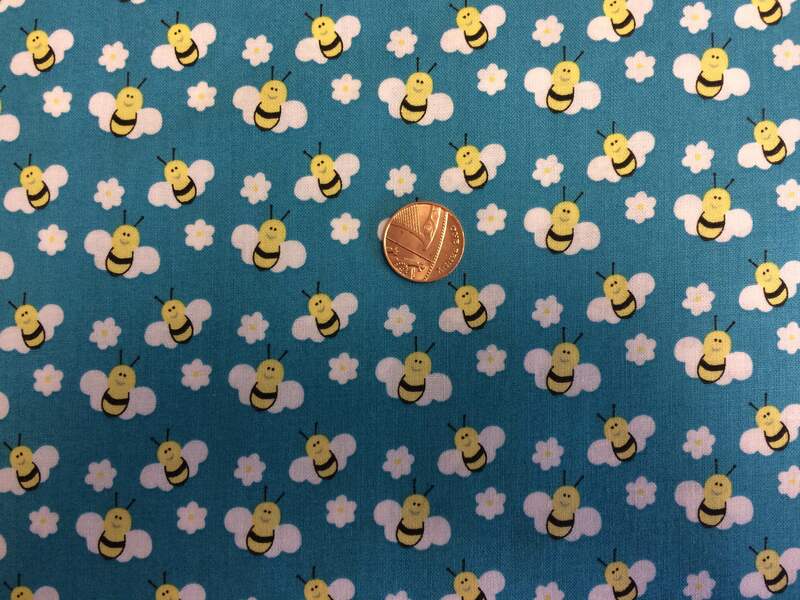 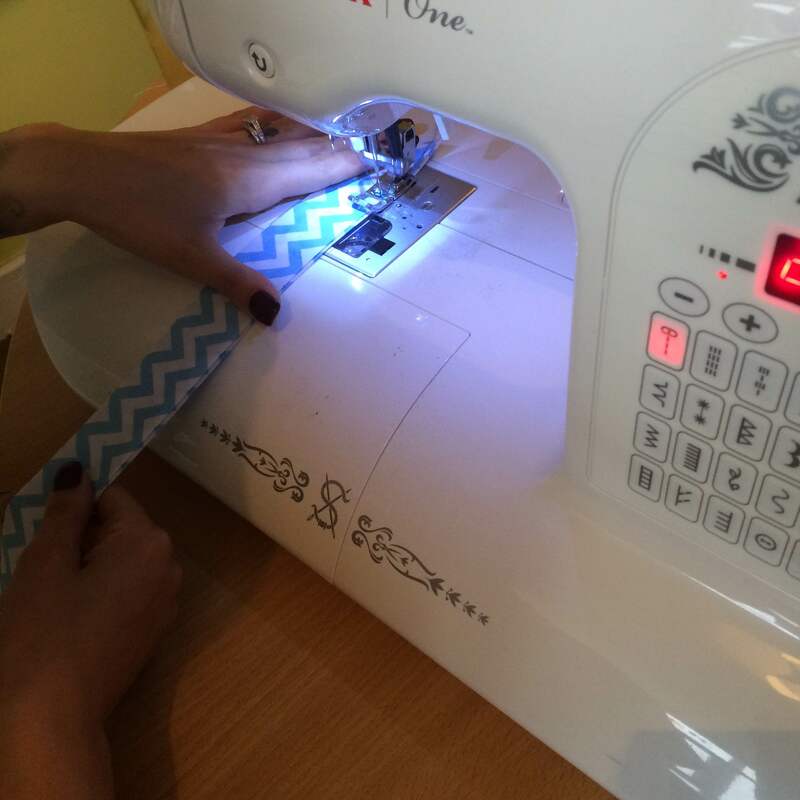 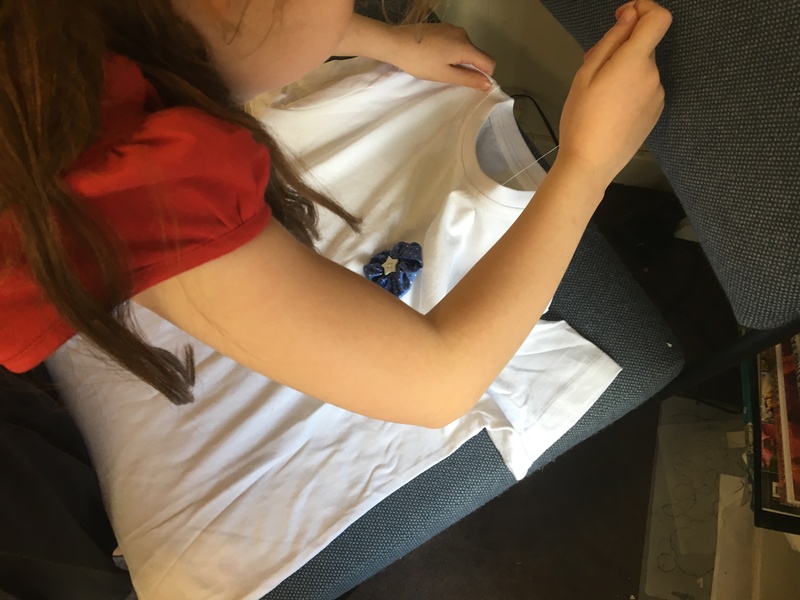 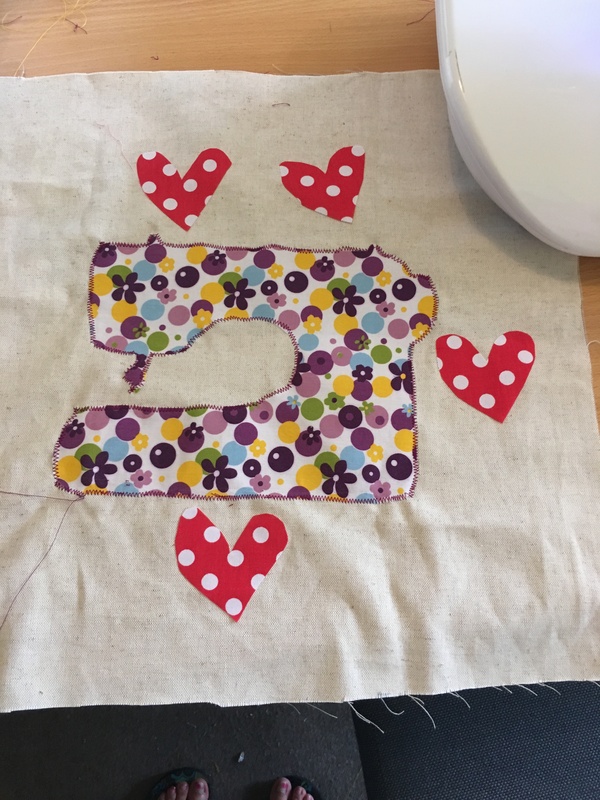 Also quickly I have a new Children’s Sewing Bee starting Monday 5th September 4pm – 5pm for the 8yrs-12yrs…….I have ONE space left. 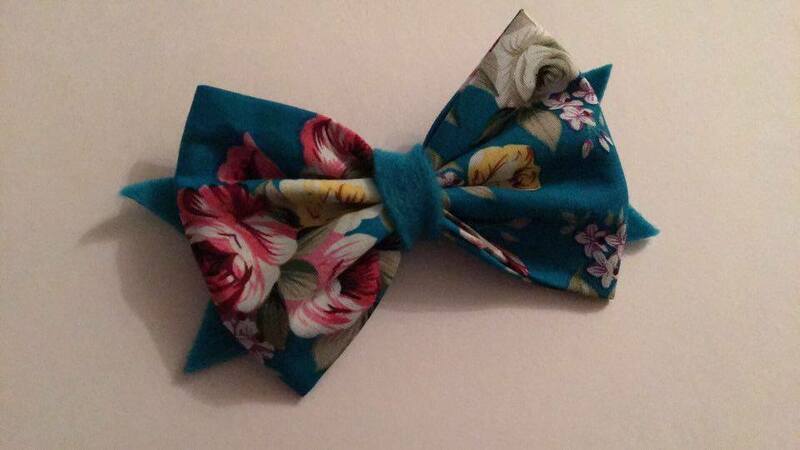 Please contact me if you are interested. 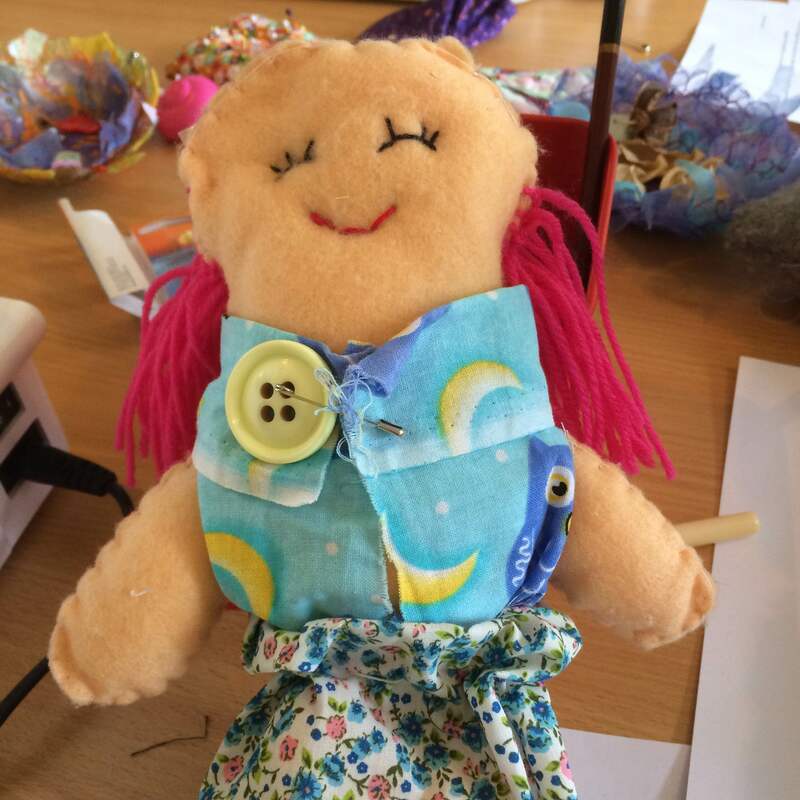 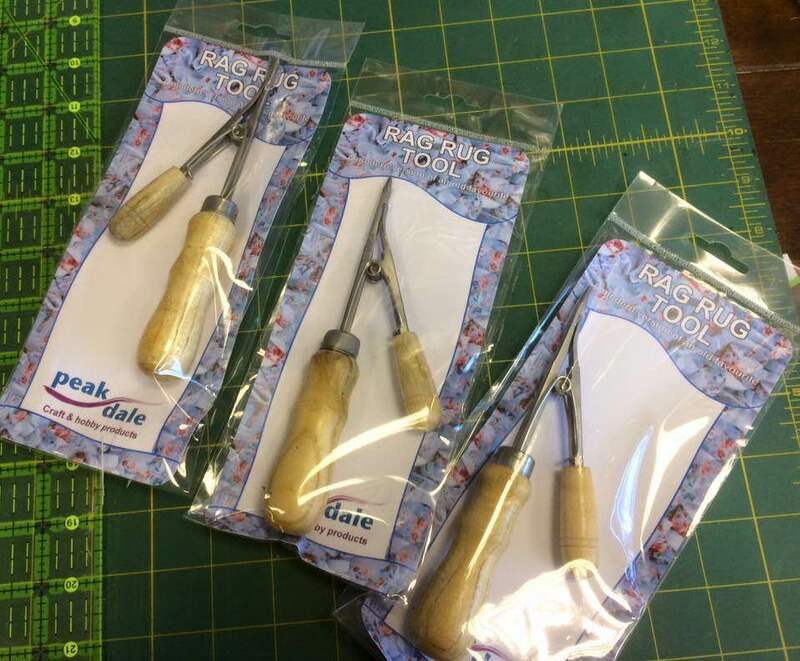 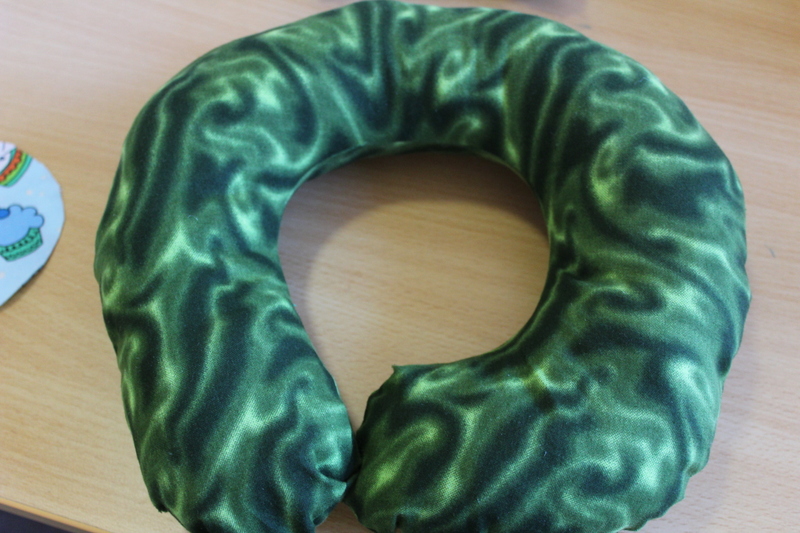 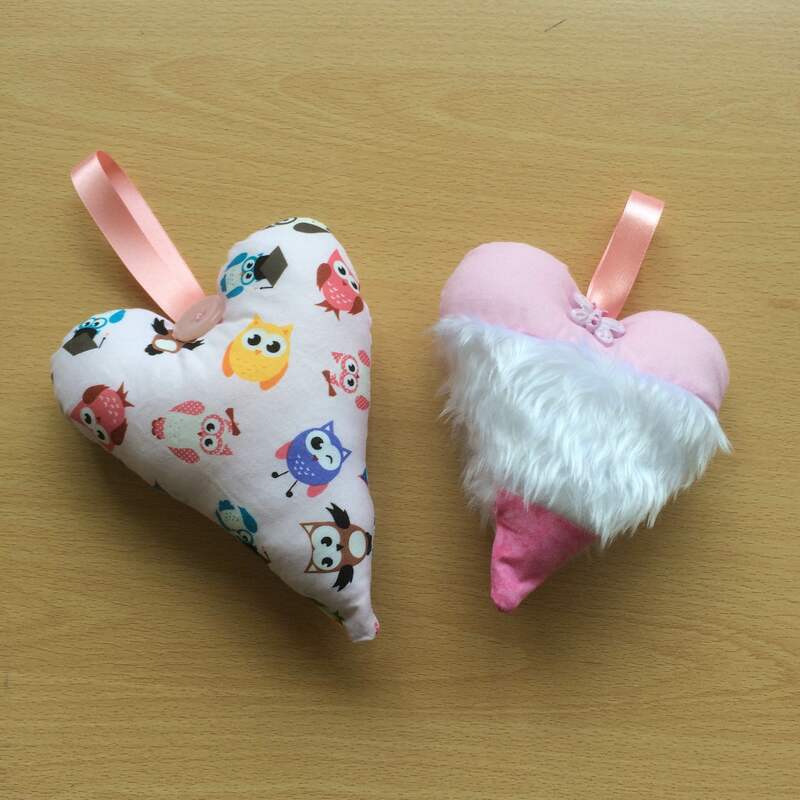 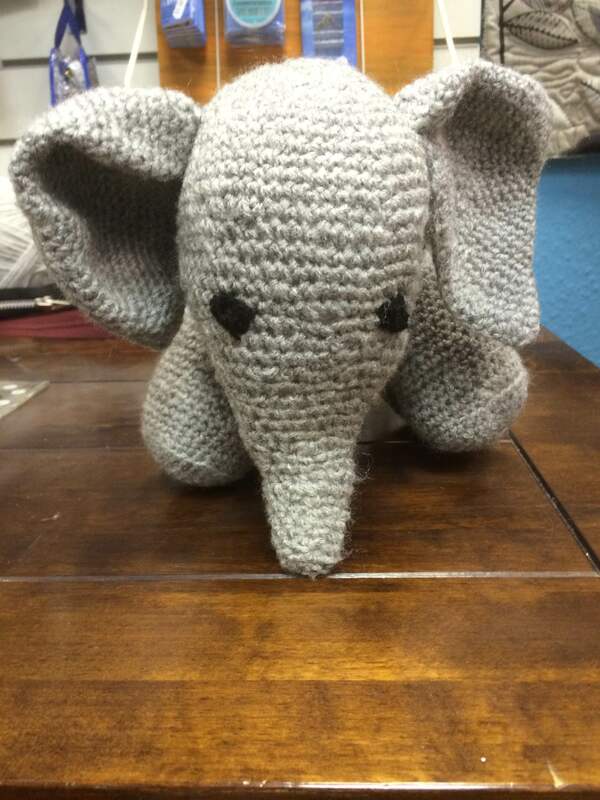 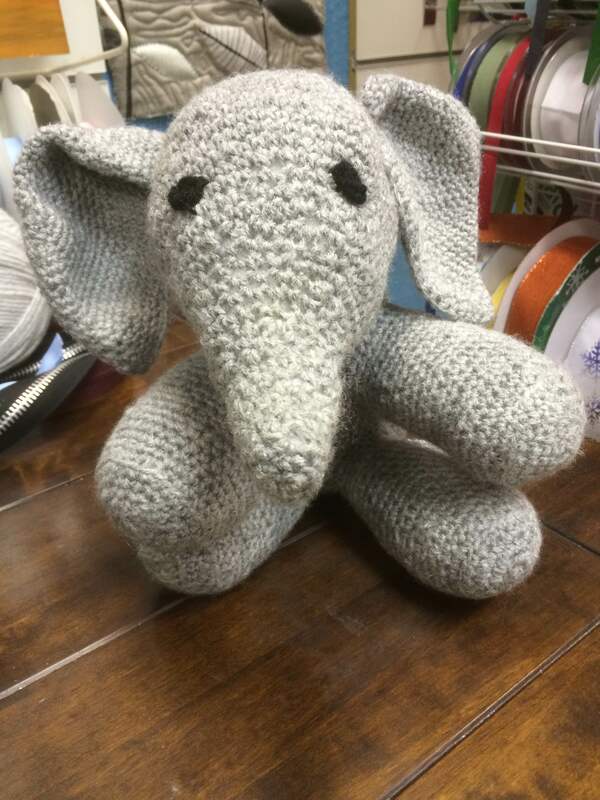 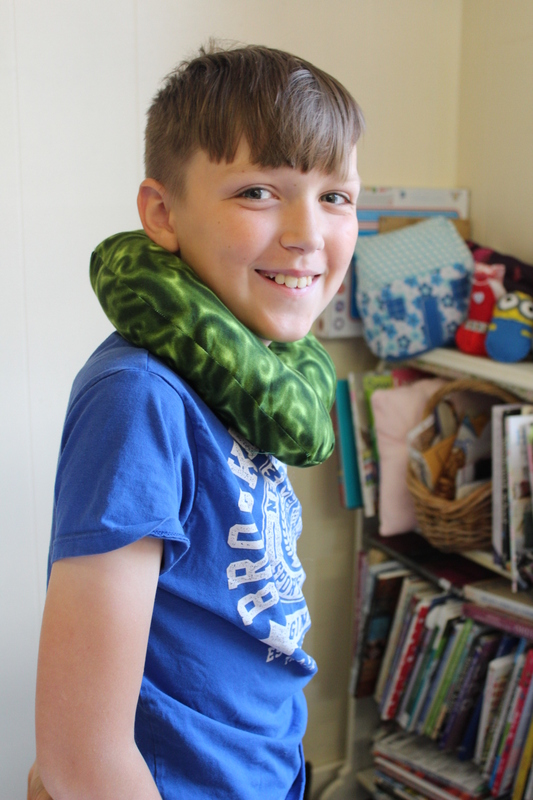 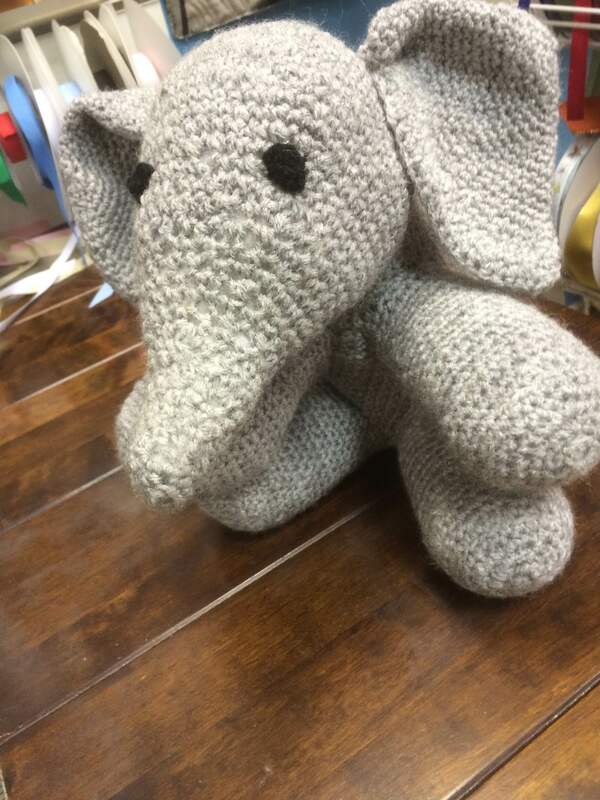 This week I have also been bust setting up a new Facebook group – The Craft Room. 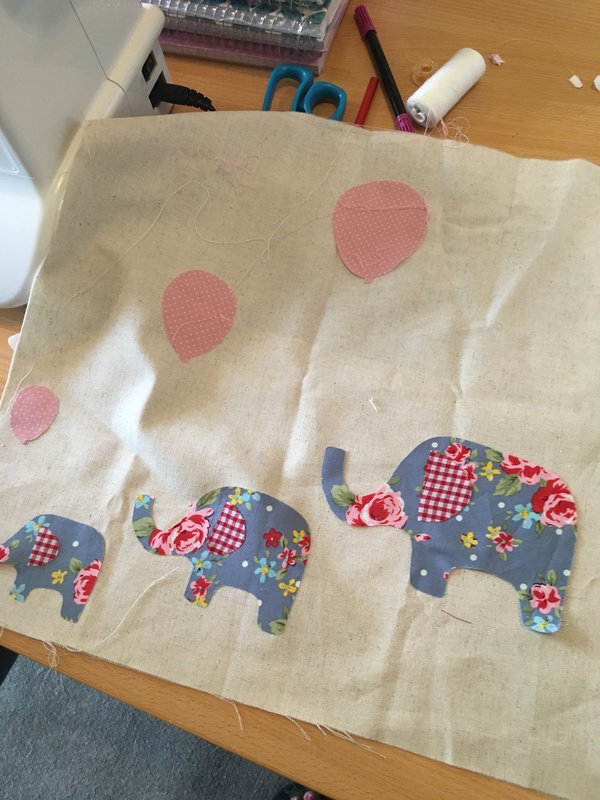 I’ve had quite a creative week this week…. 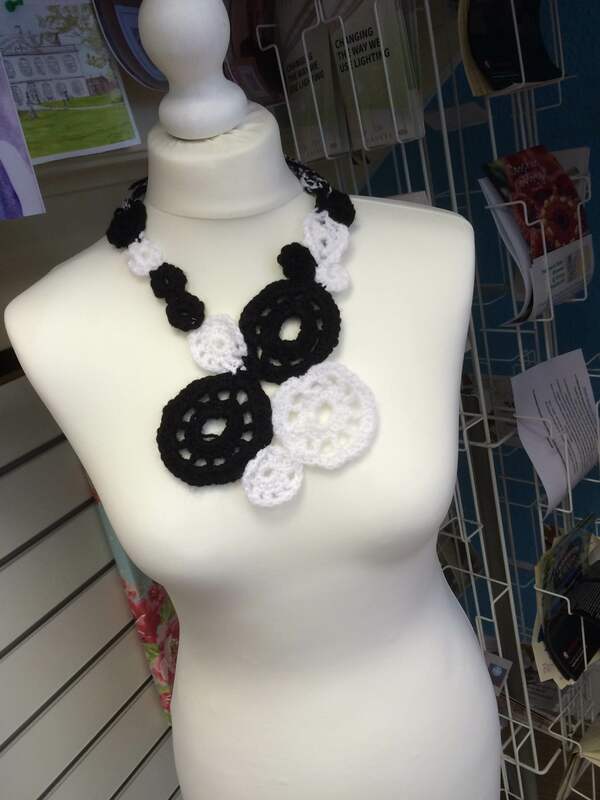 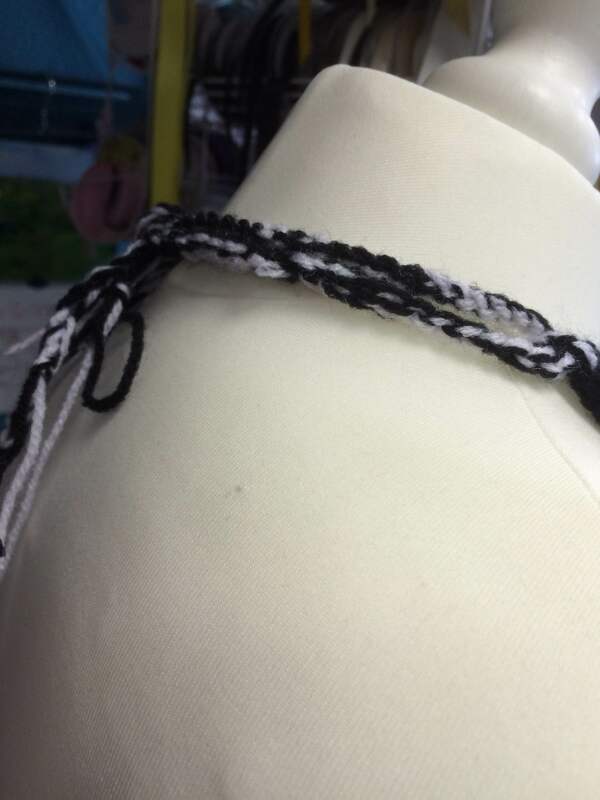 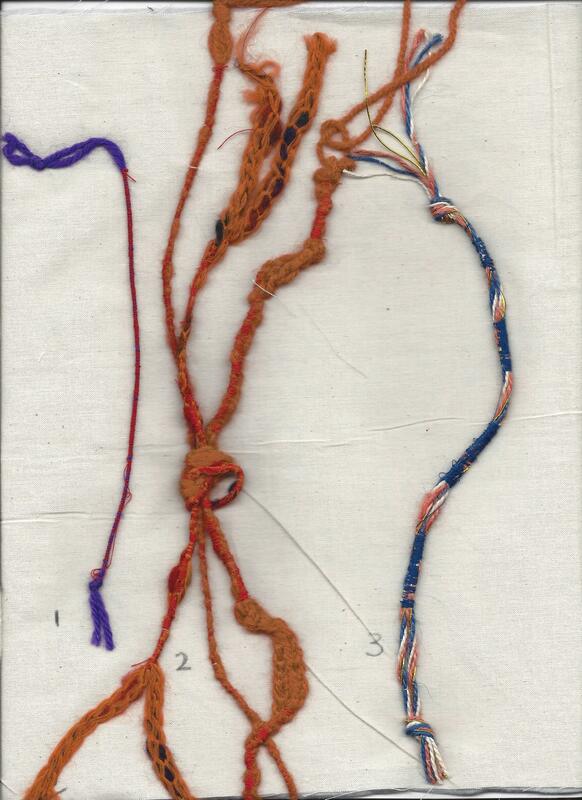 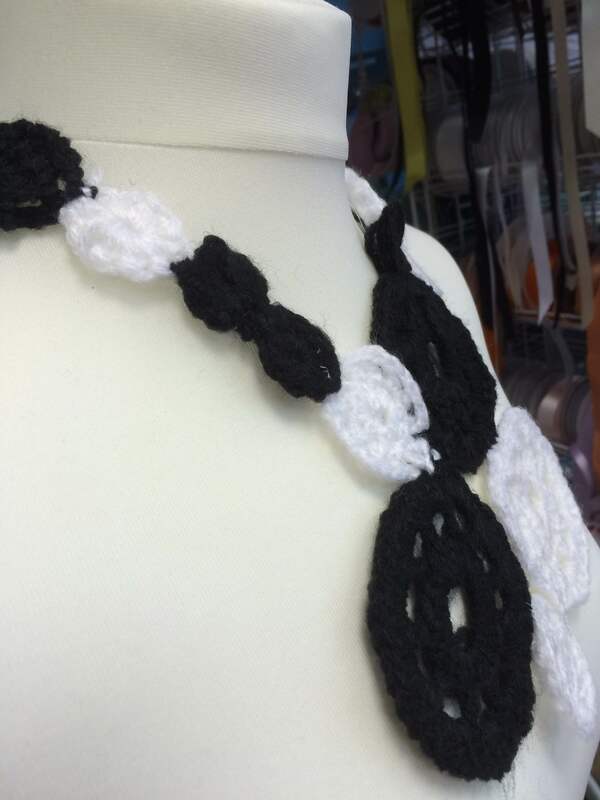 And a crocheted necklace….as part of my coursework. 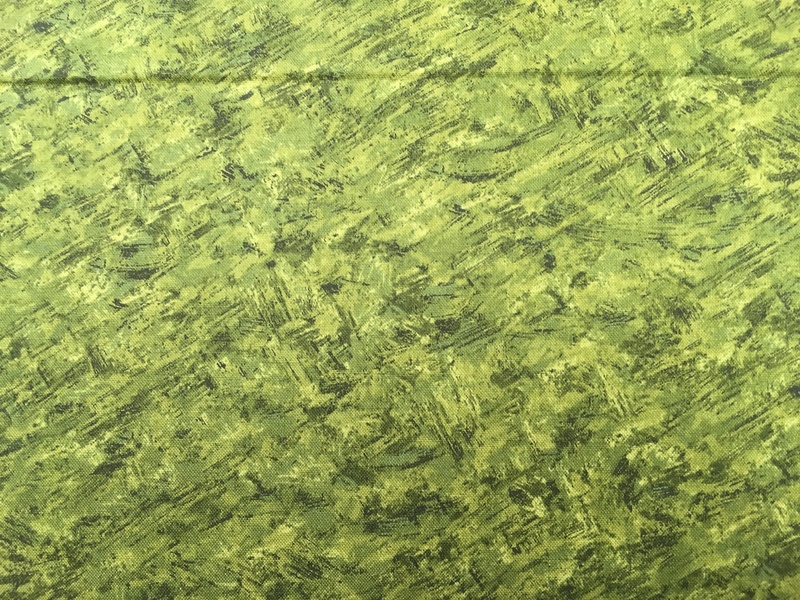 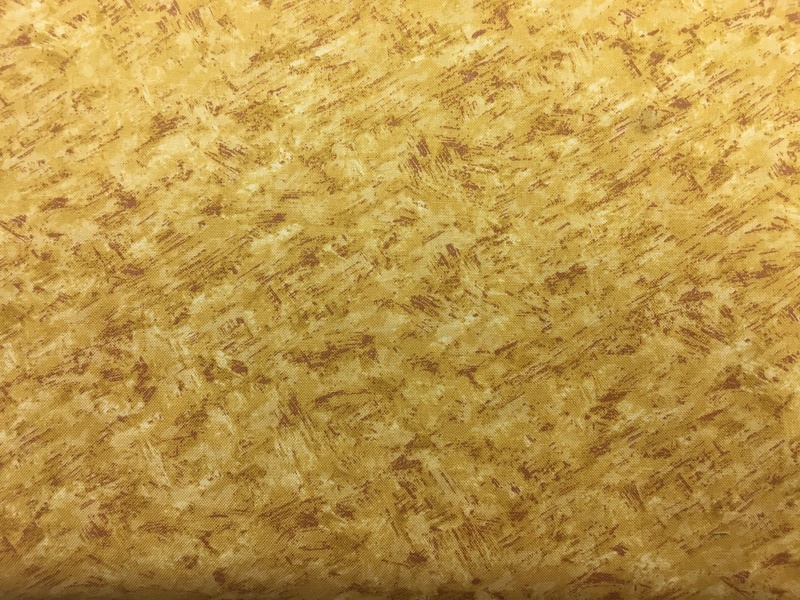 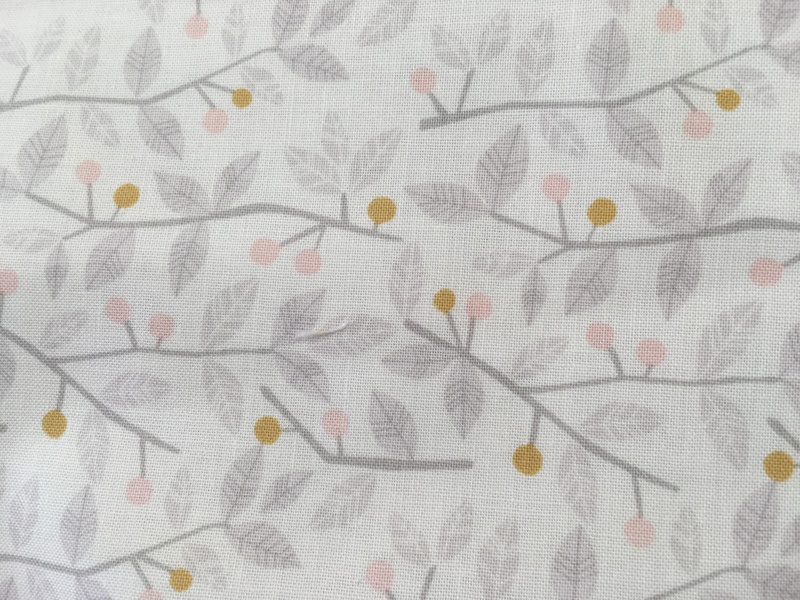 New Fabric, New Yarn & New Website. 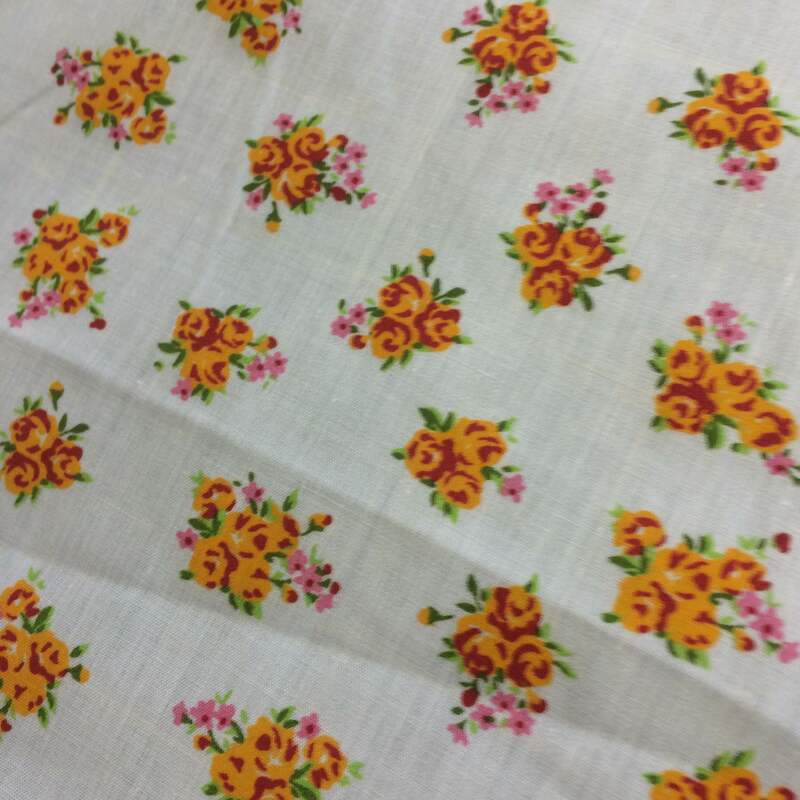 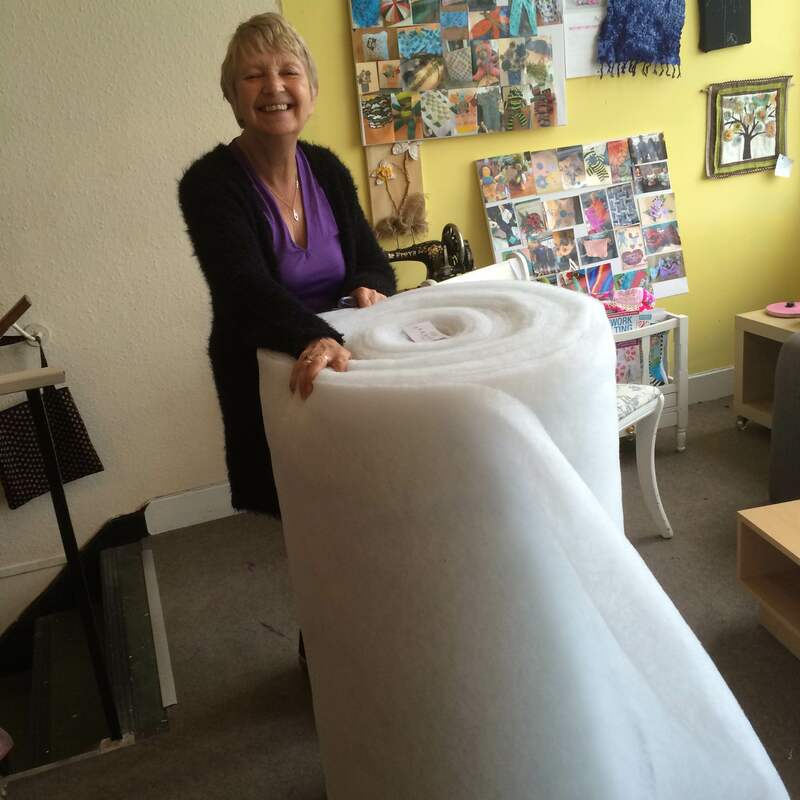 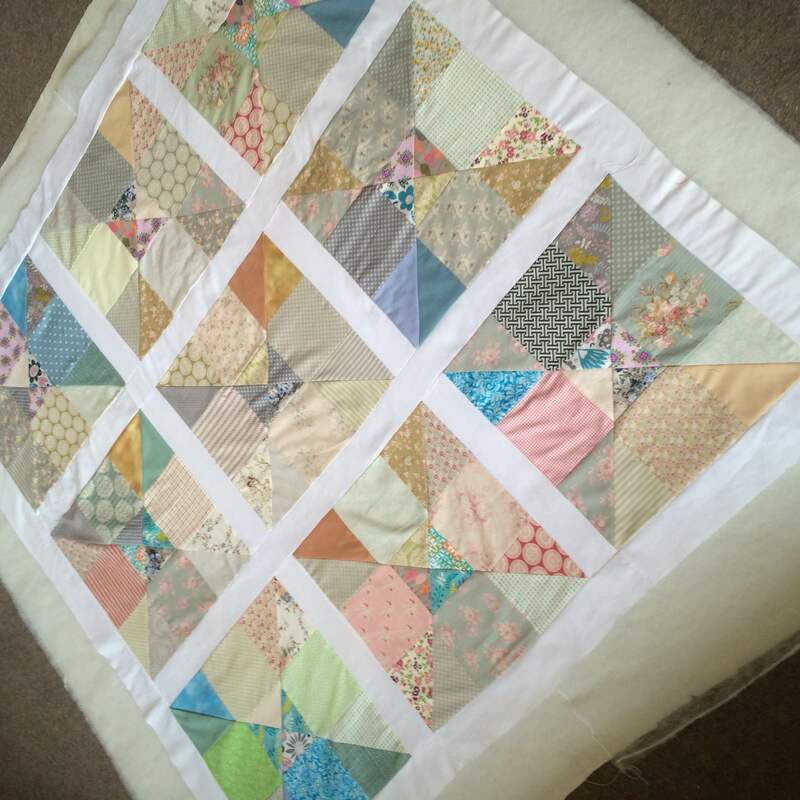 Its been a hectic week of unpacking new stock, working on the website and fitting in time for a bit of quilting. 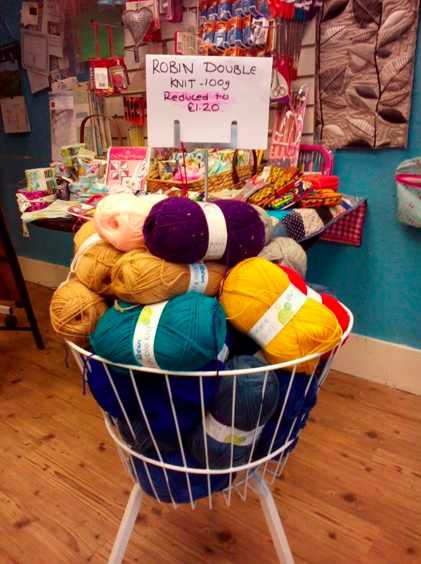 The new website launched with a Click & Collect service which has taken off well. 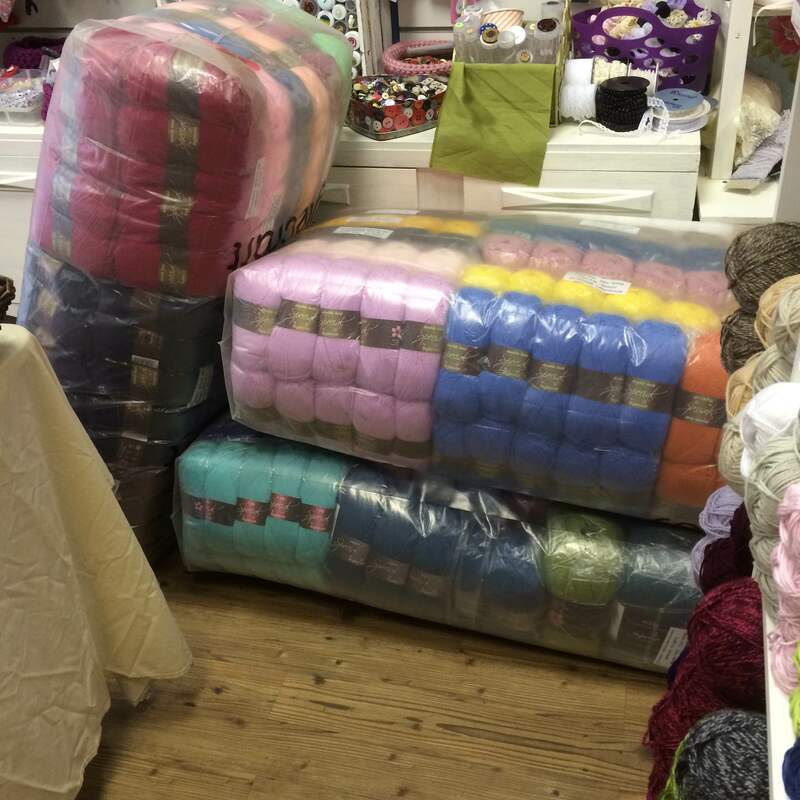 All of our new stock in the future will be loaded straight onto our site for you to reserve and its also available to customers needing postage. 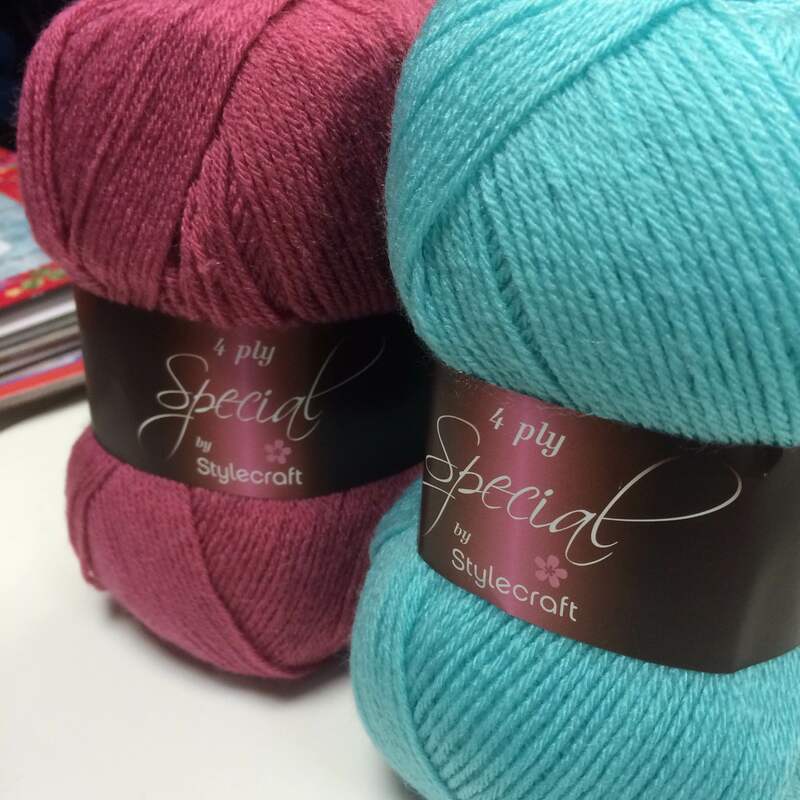 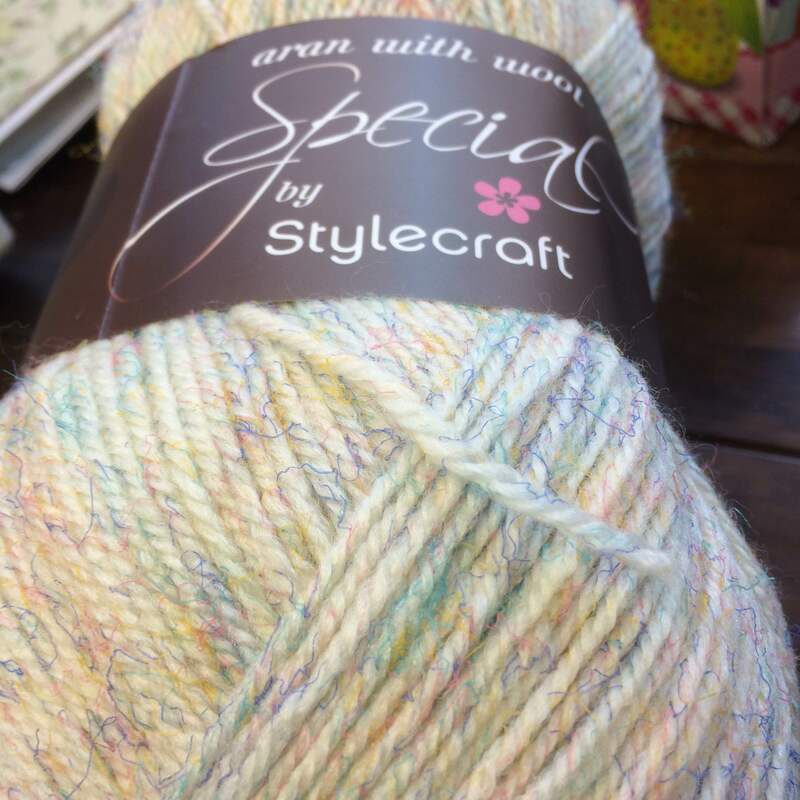 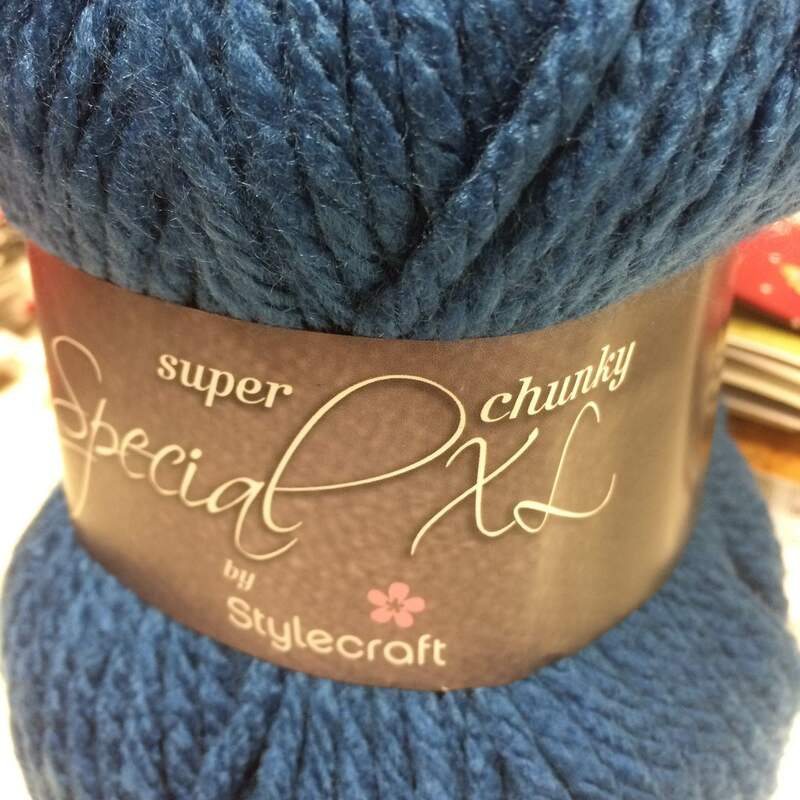 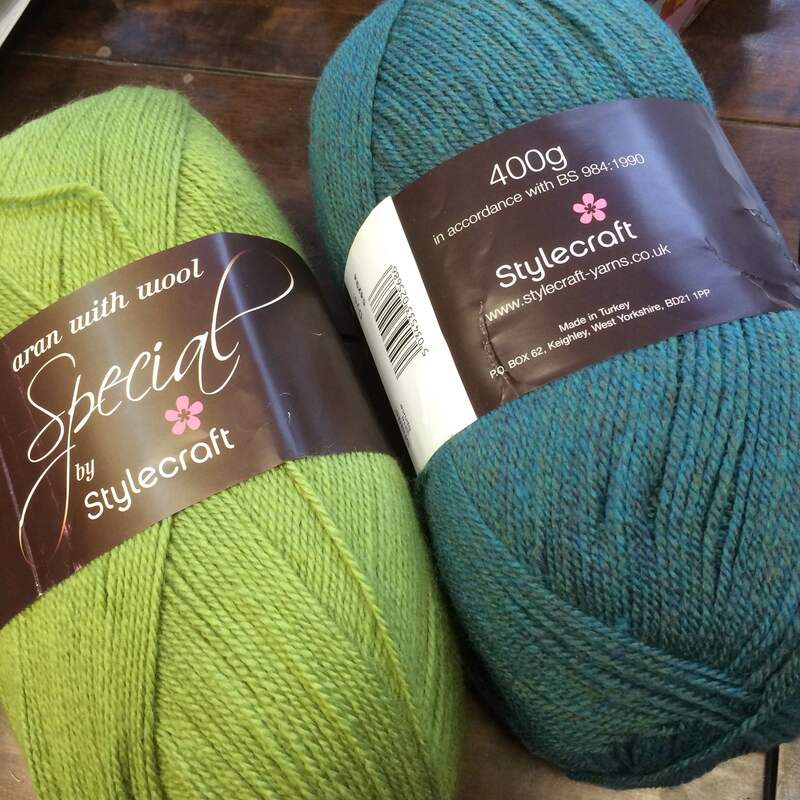 Stylecraft entered the building and wow its been selling quick…. 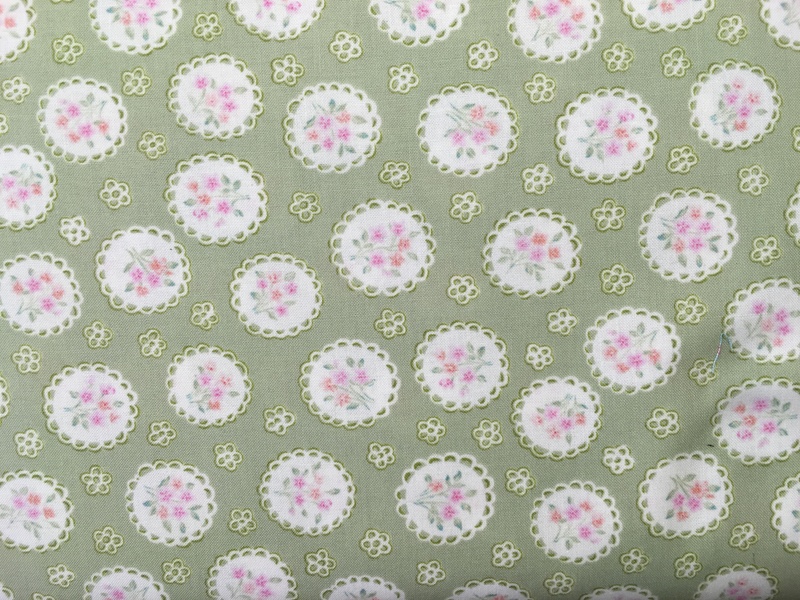 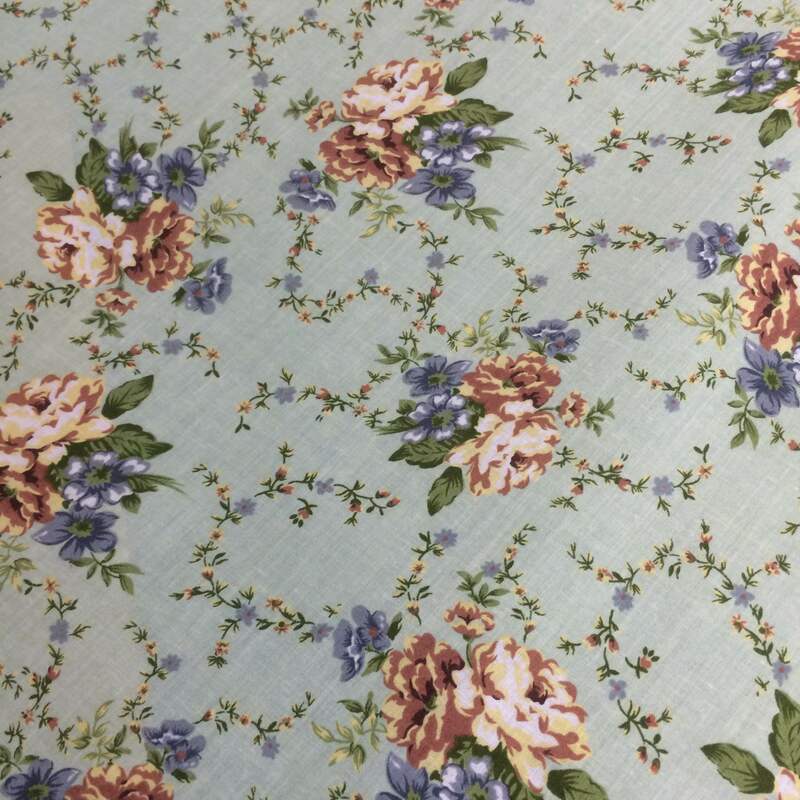 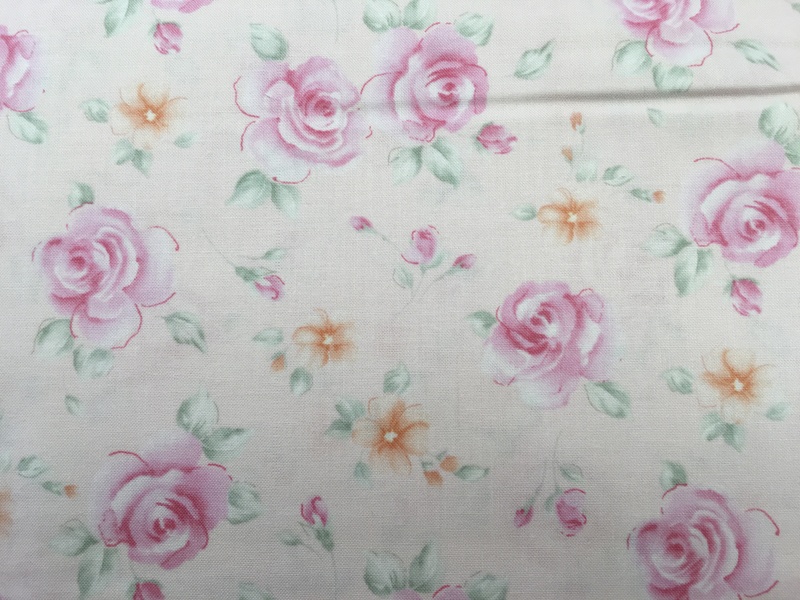 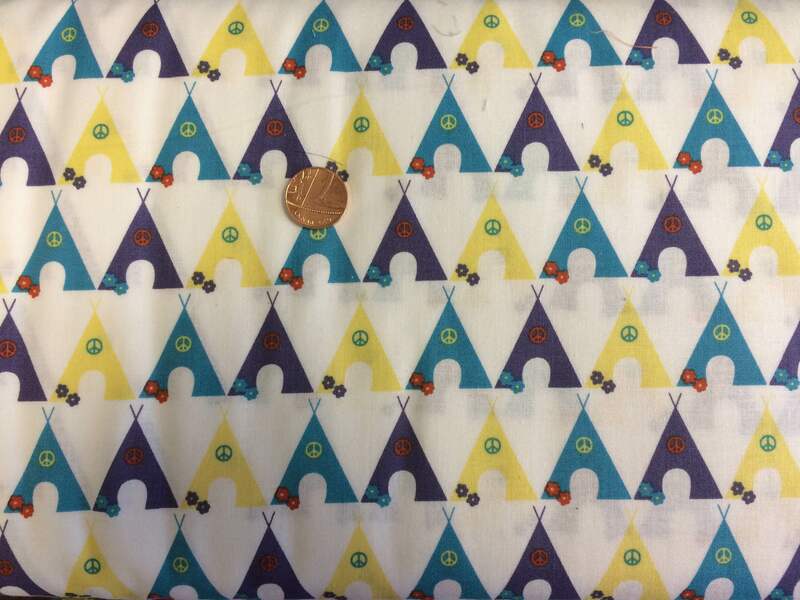 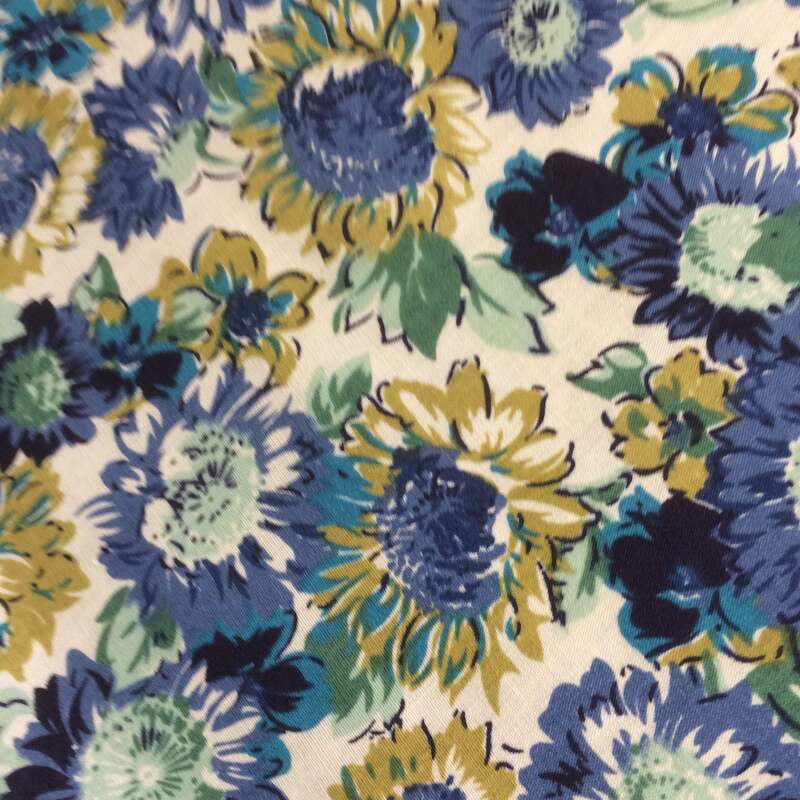 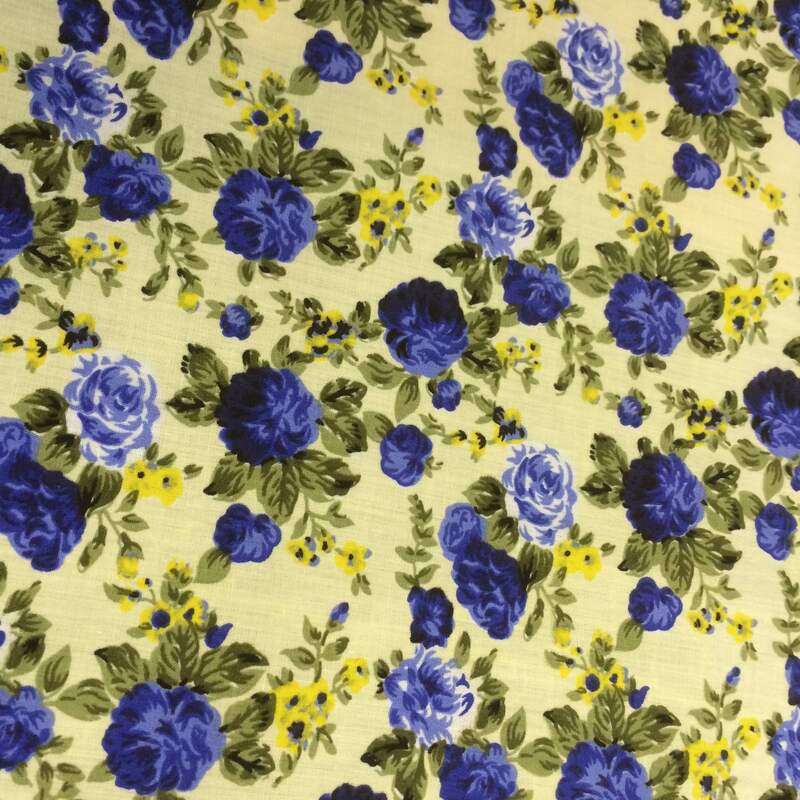 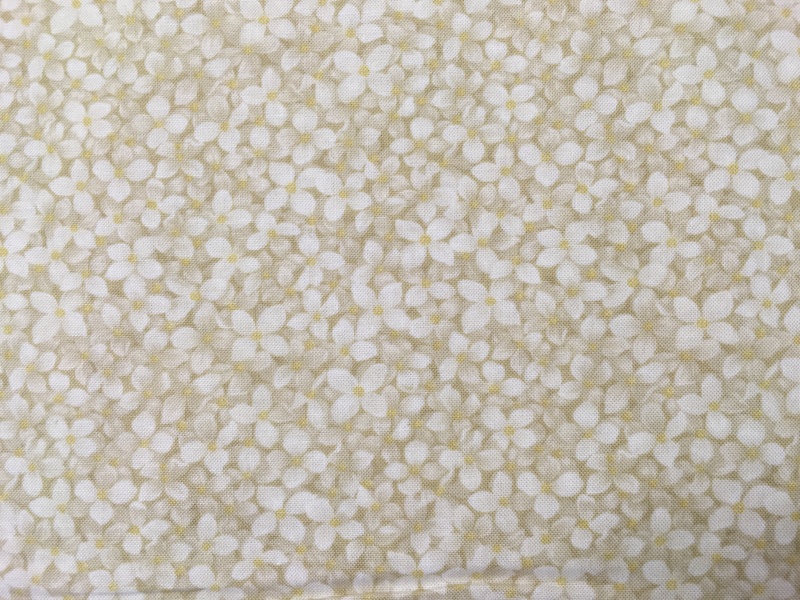 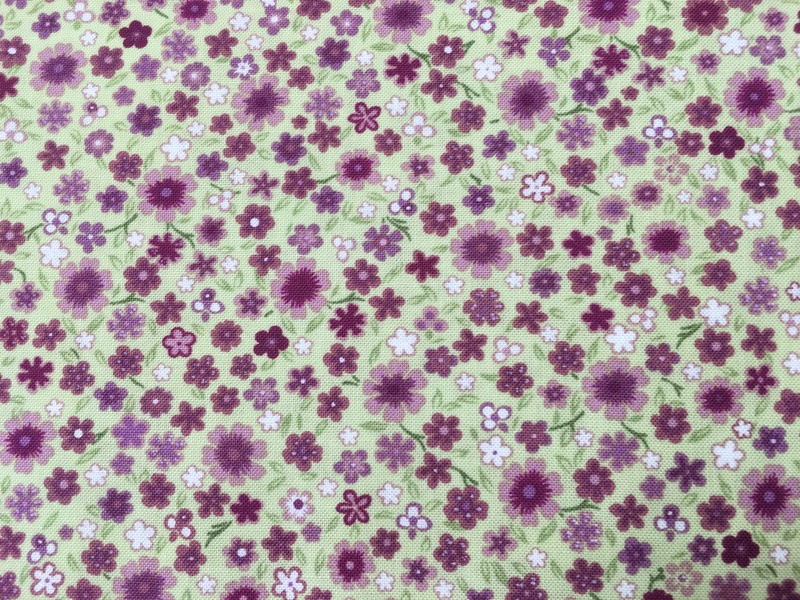 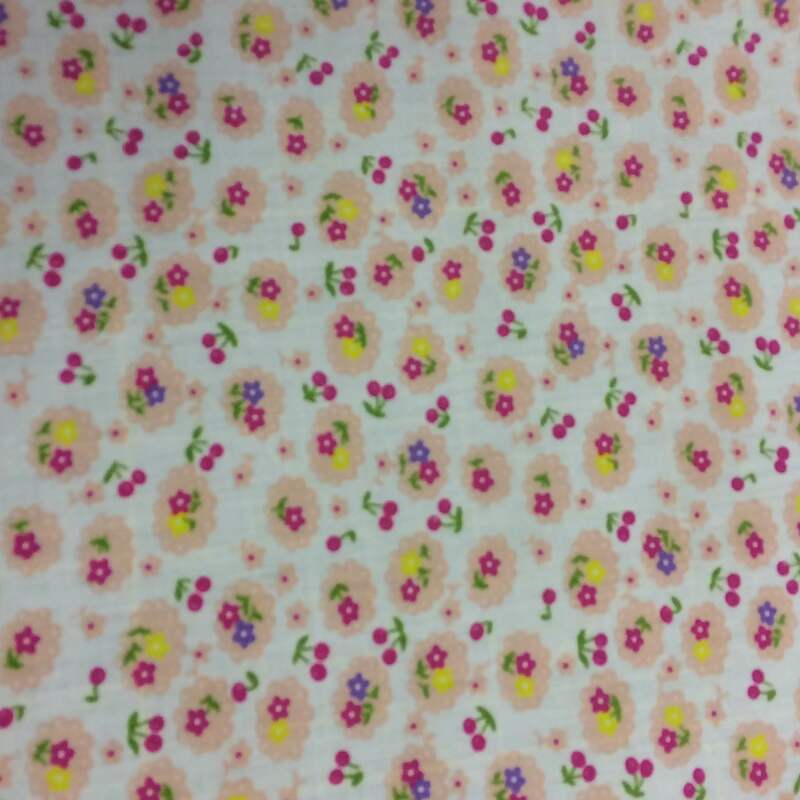 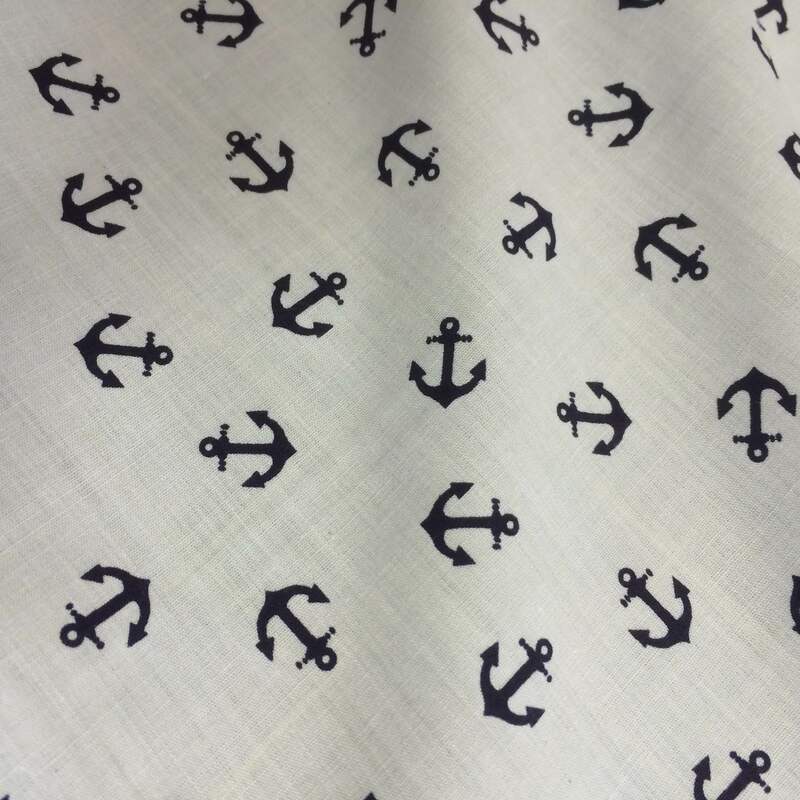 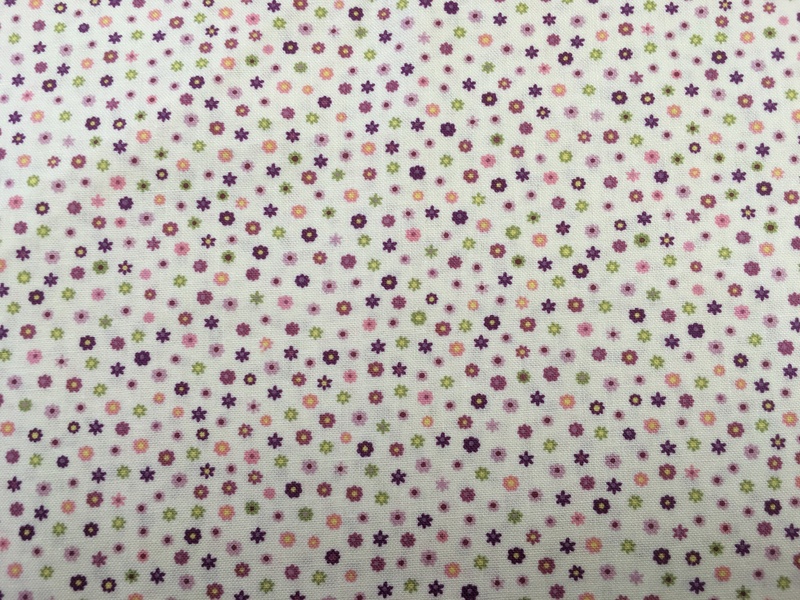 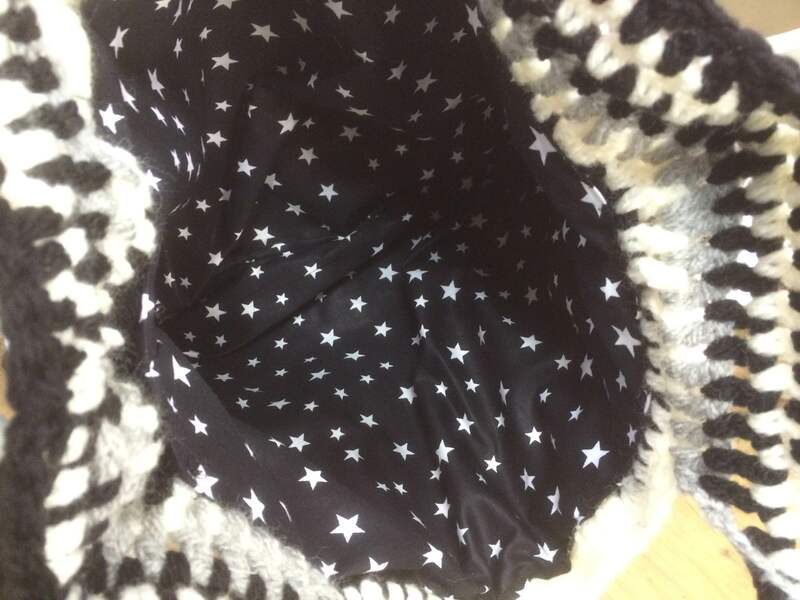 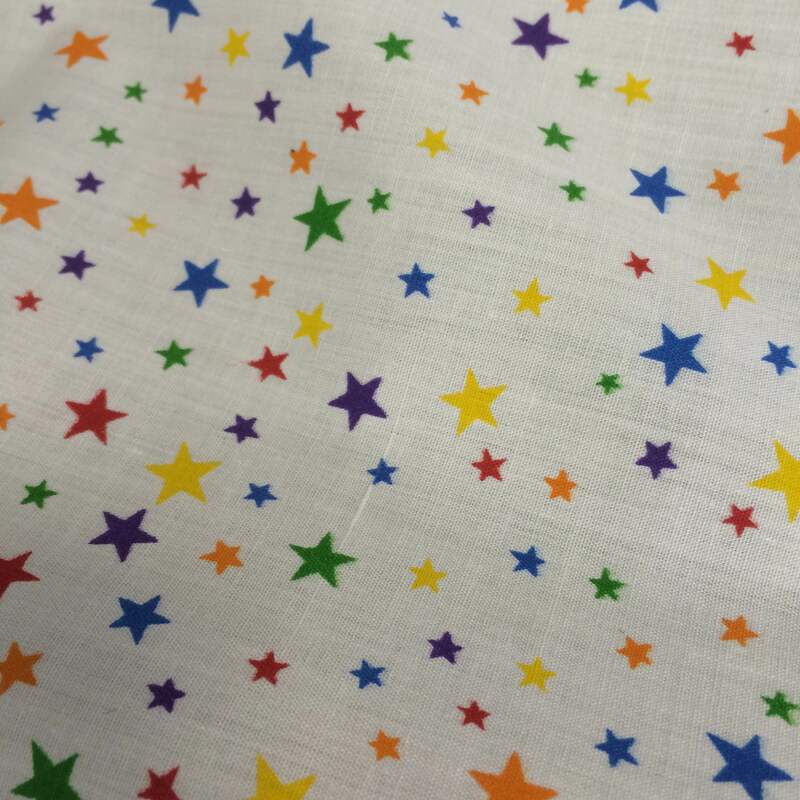 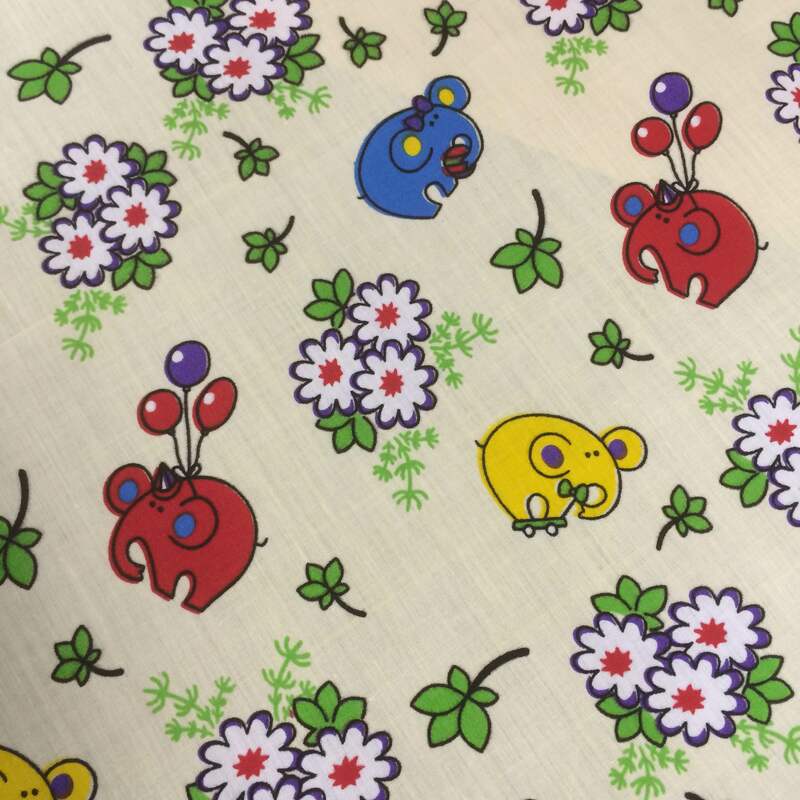 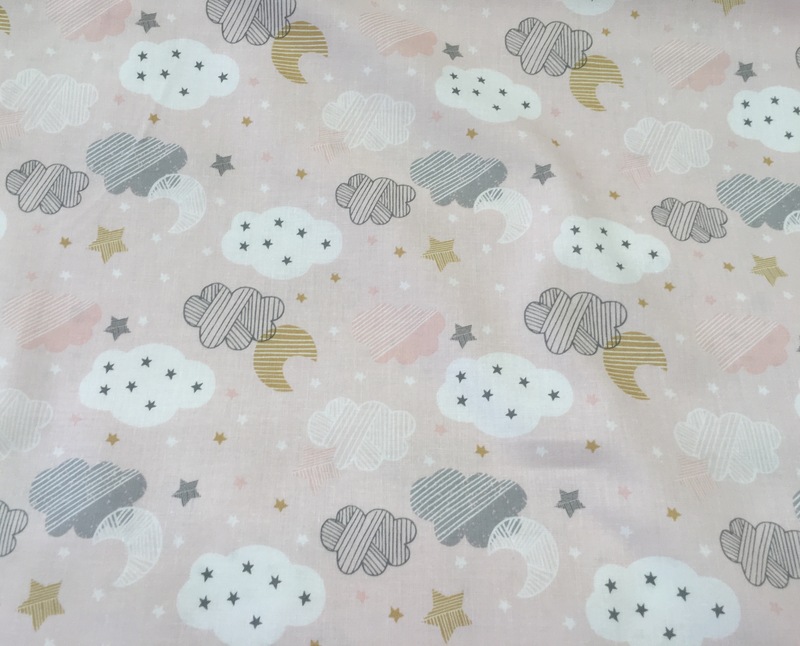 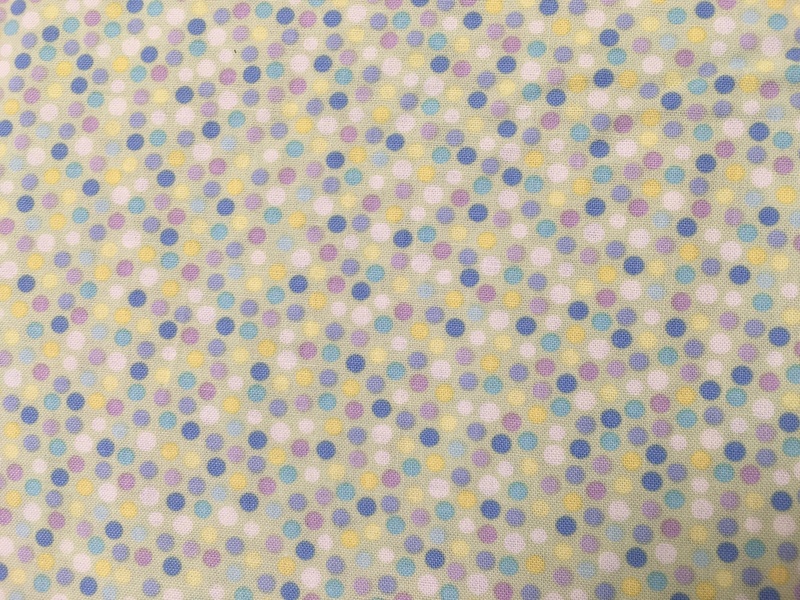 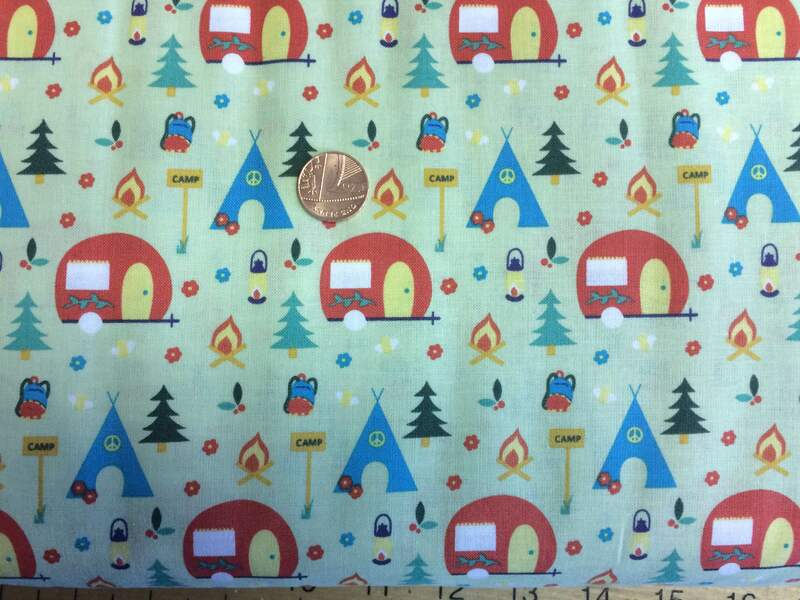 A delivery from Fabric Freedom arrived too this week with gorgeous cottons from their new camping range. 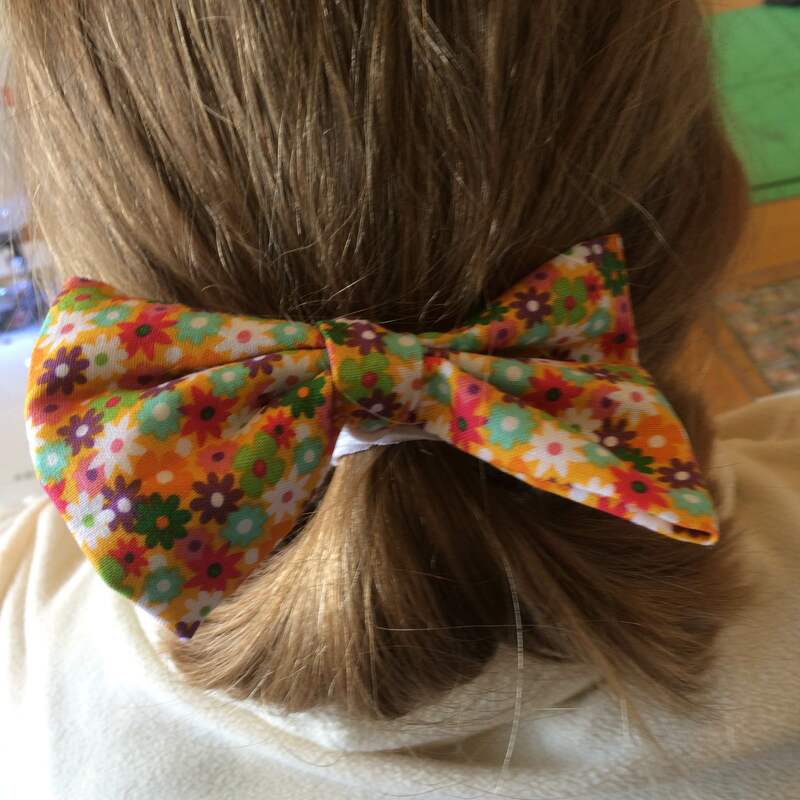 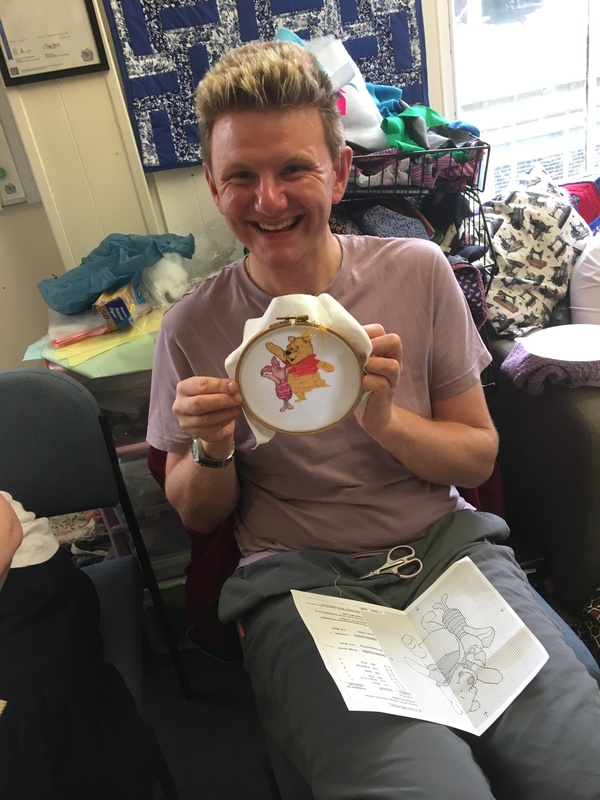 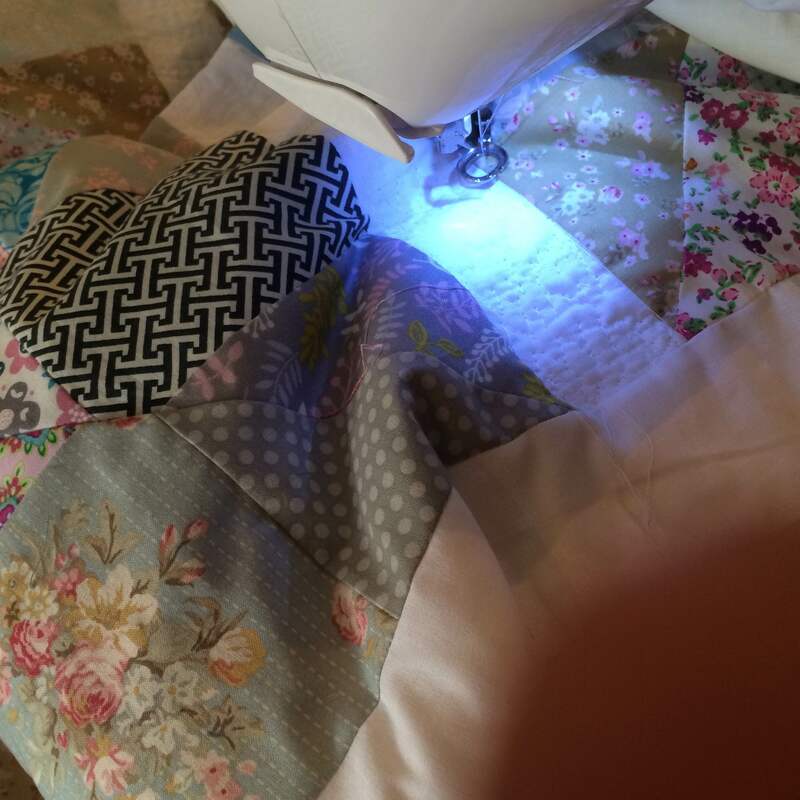 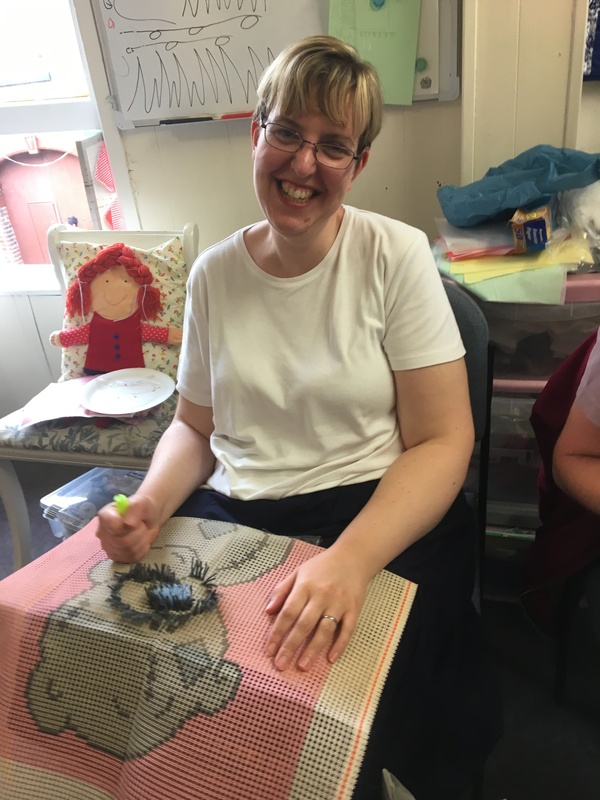 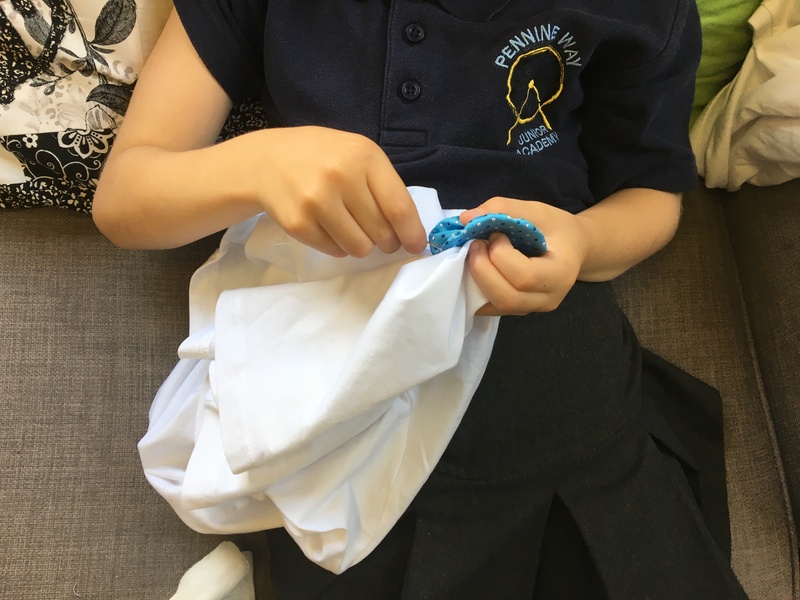 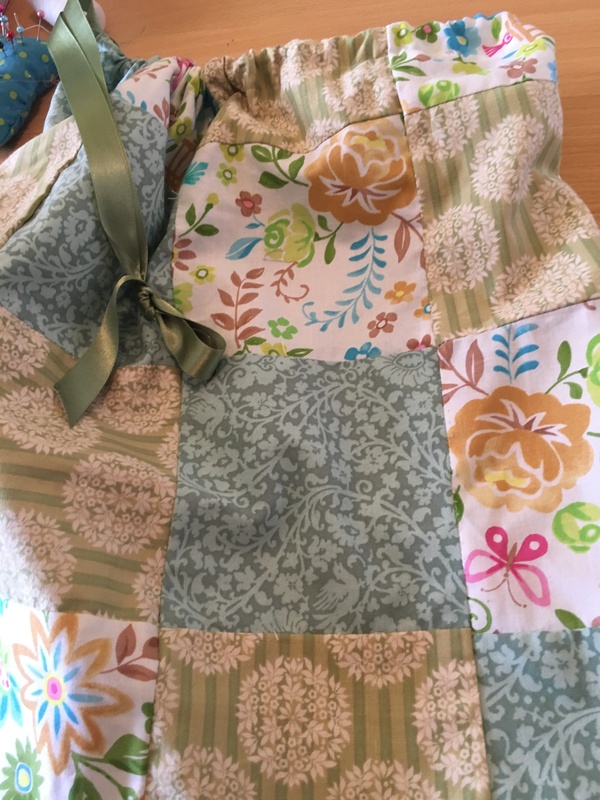 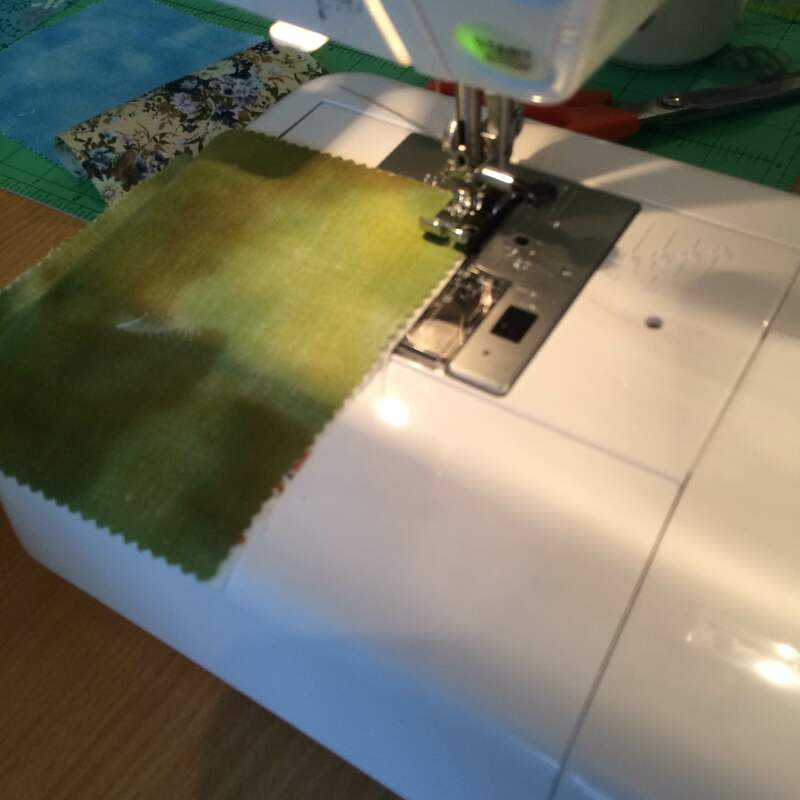 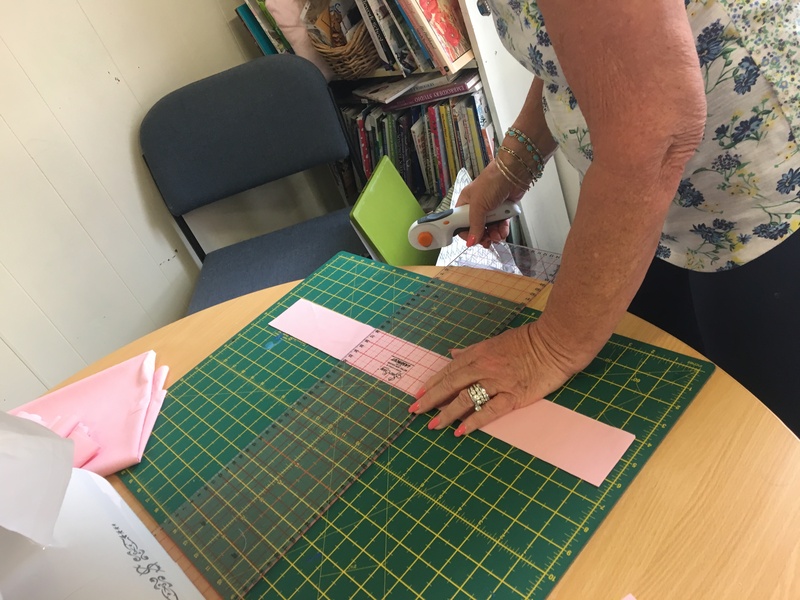 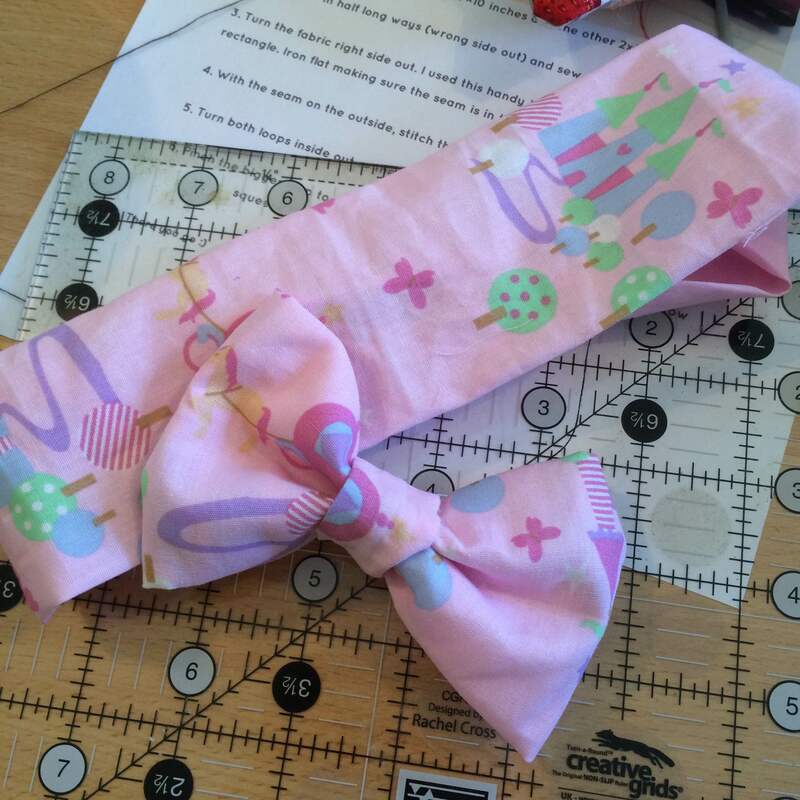 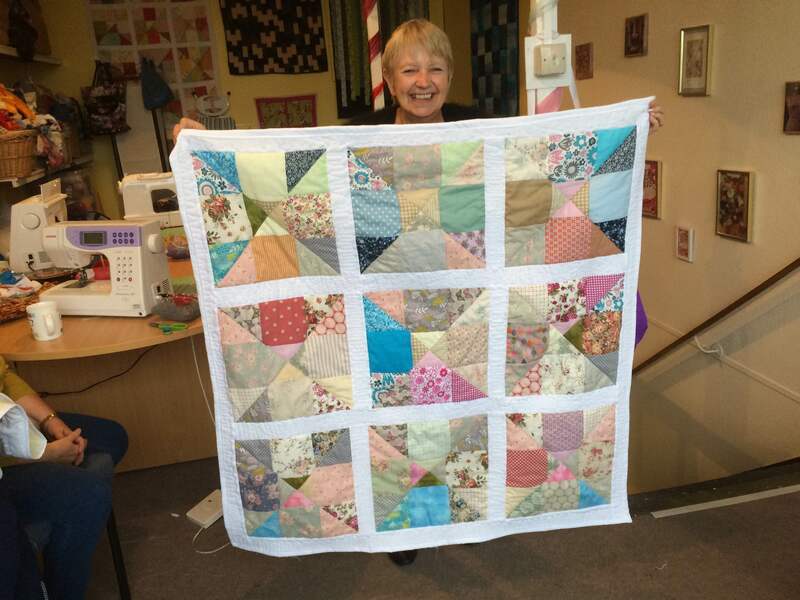 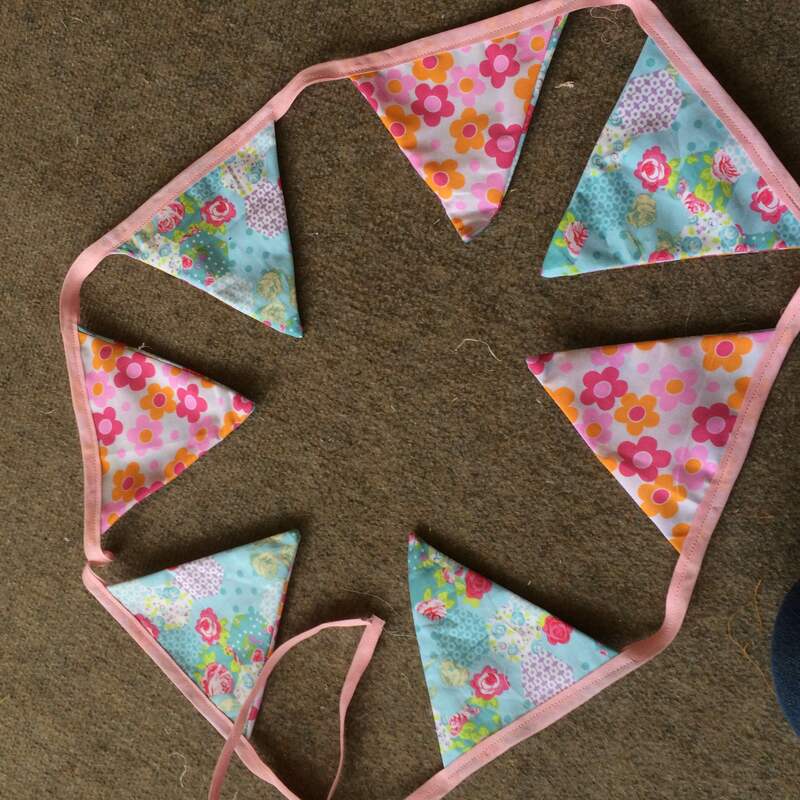 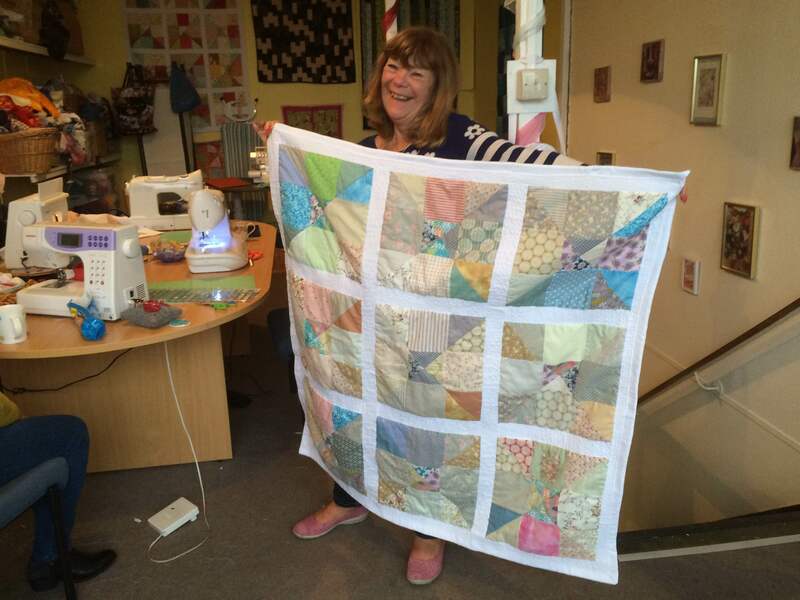 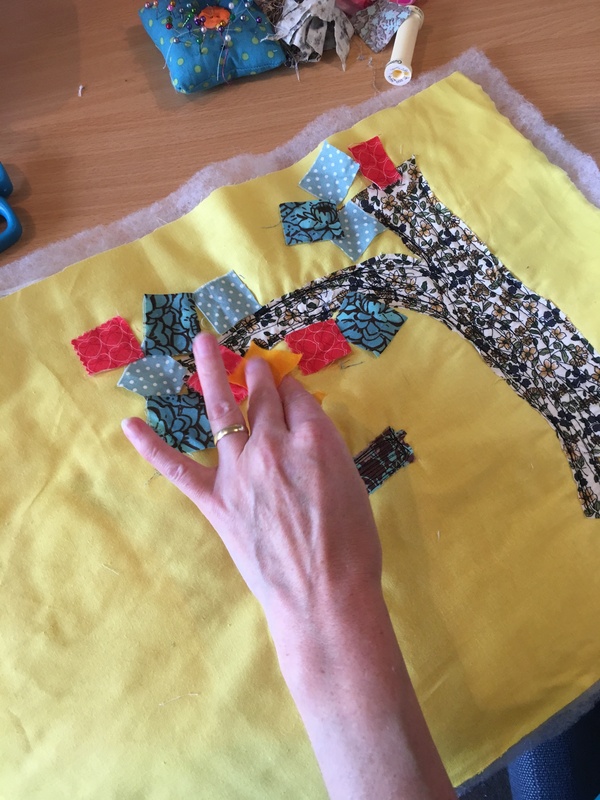 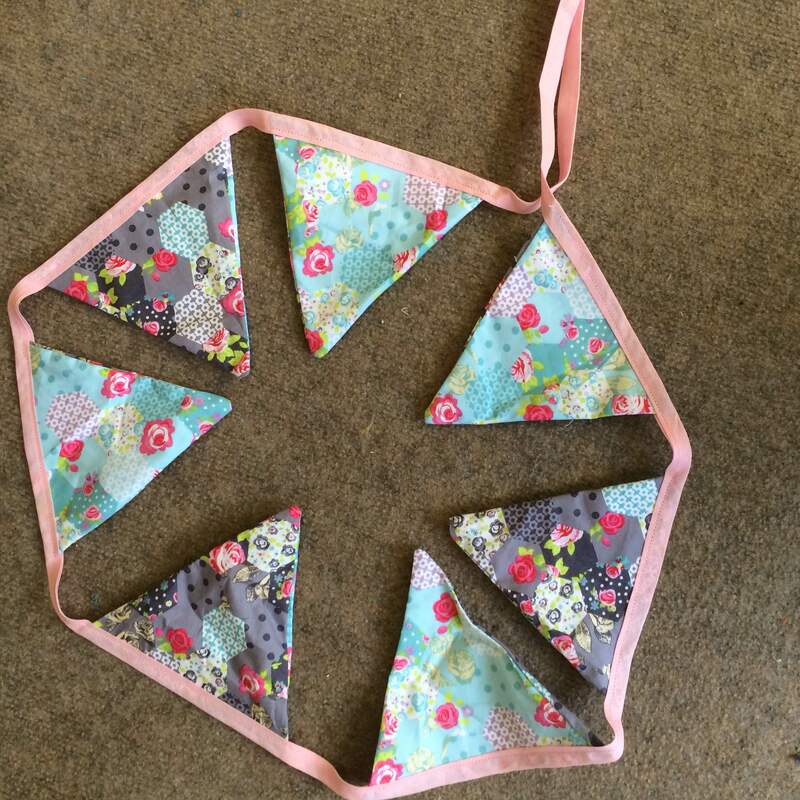 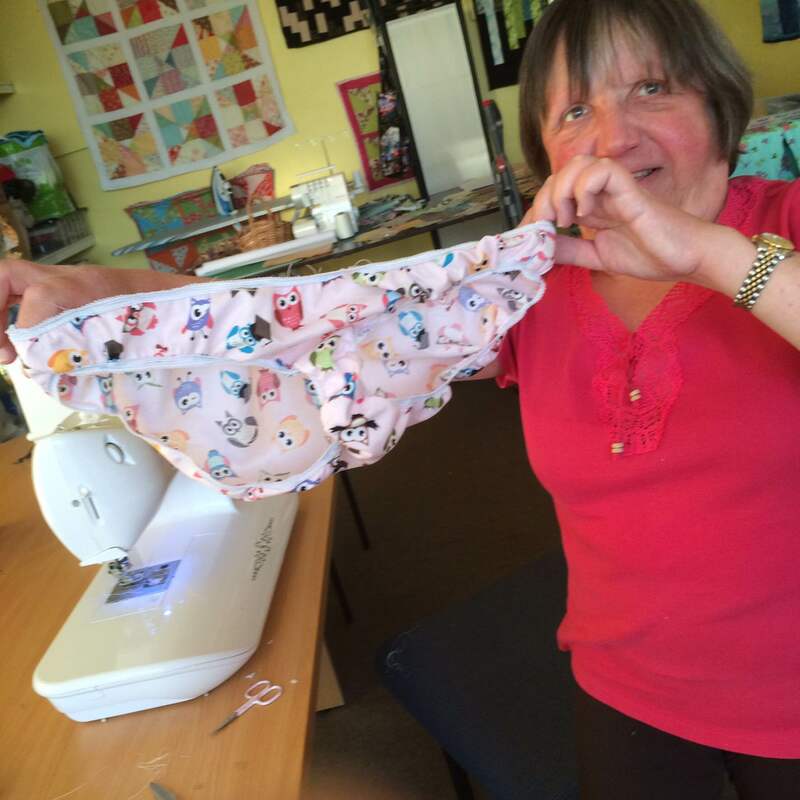 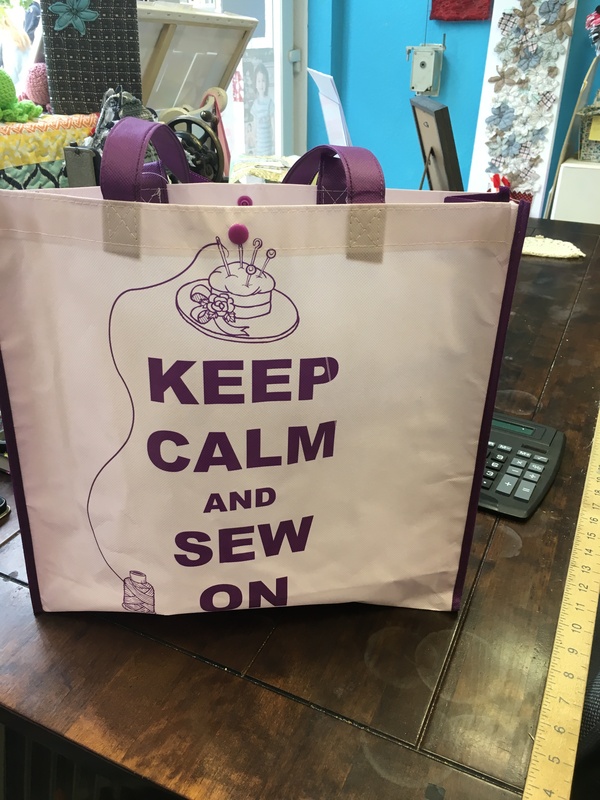 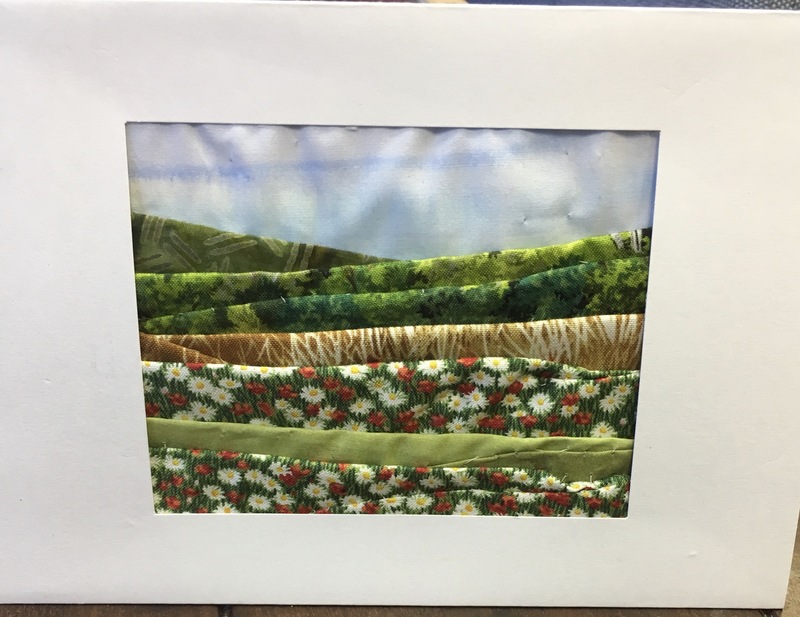 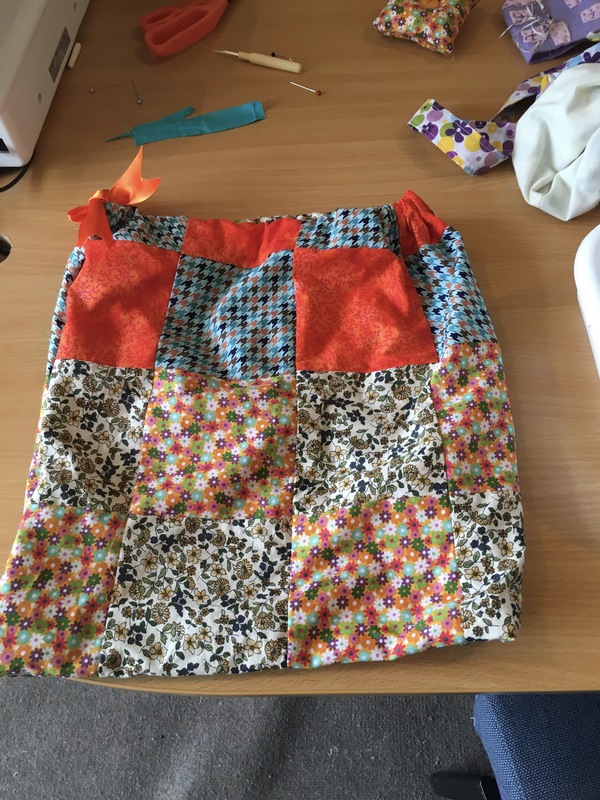 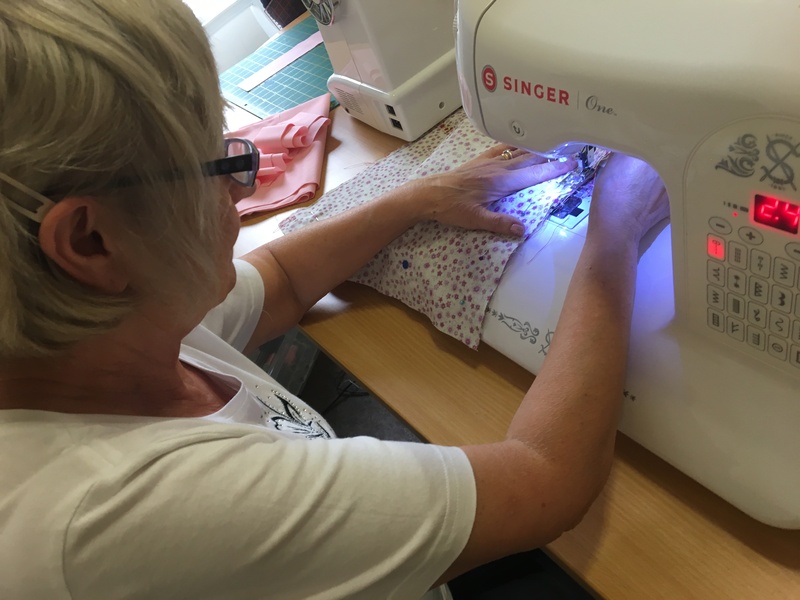 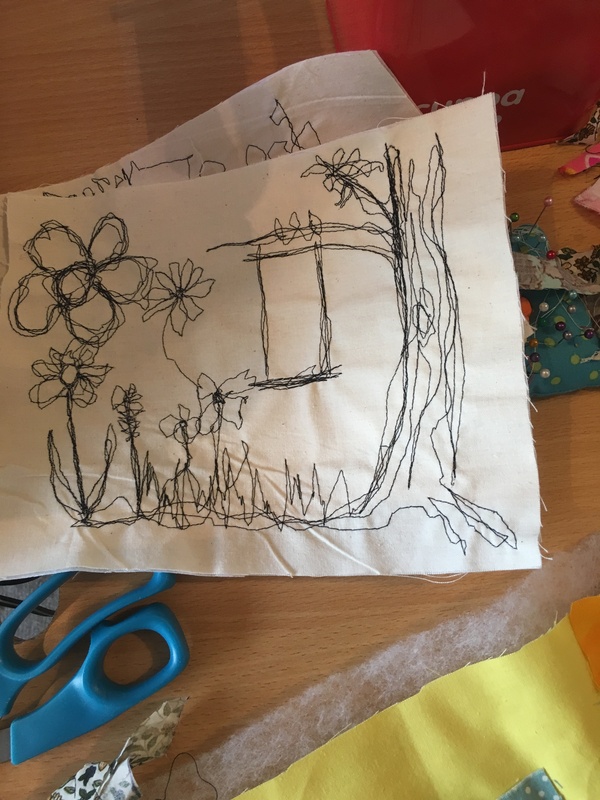 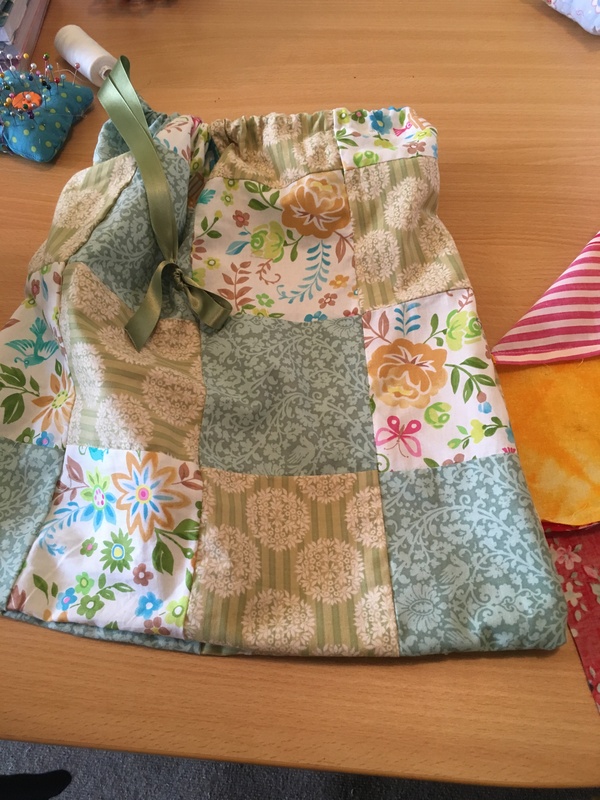 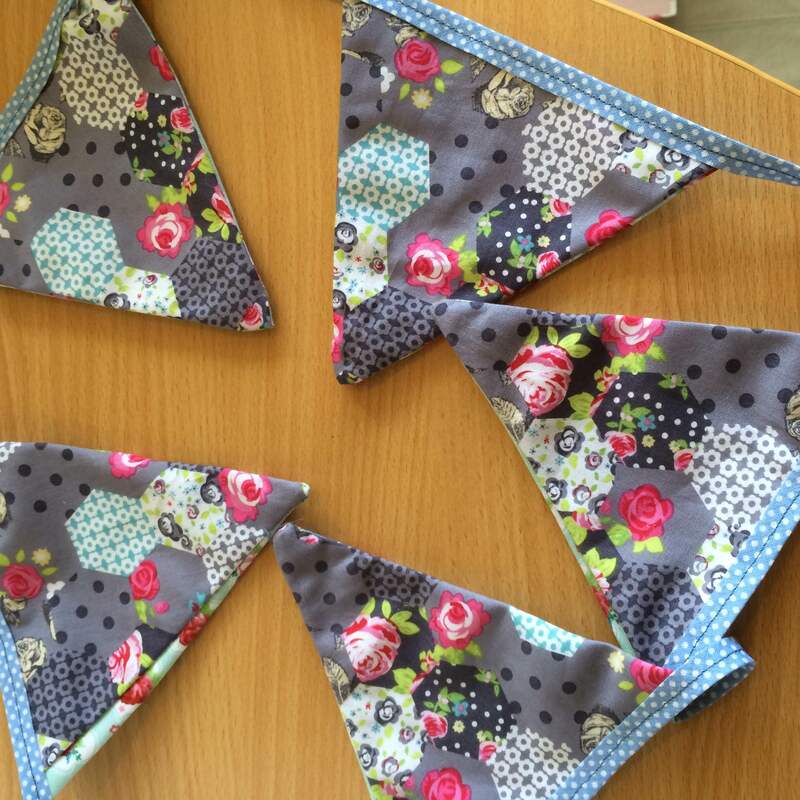 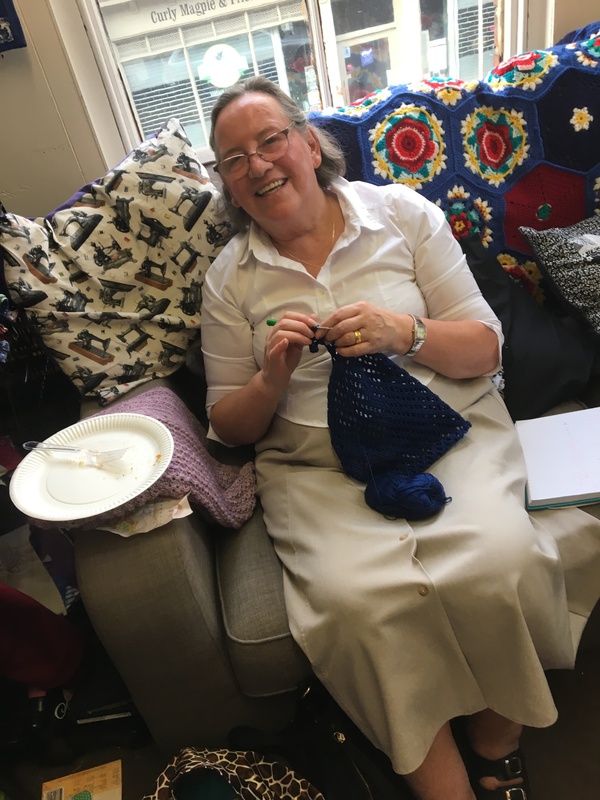 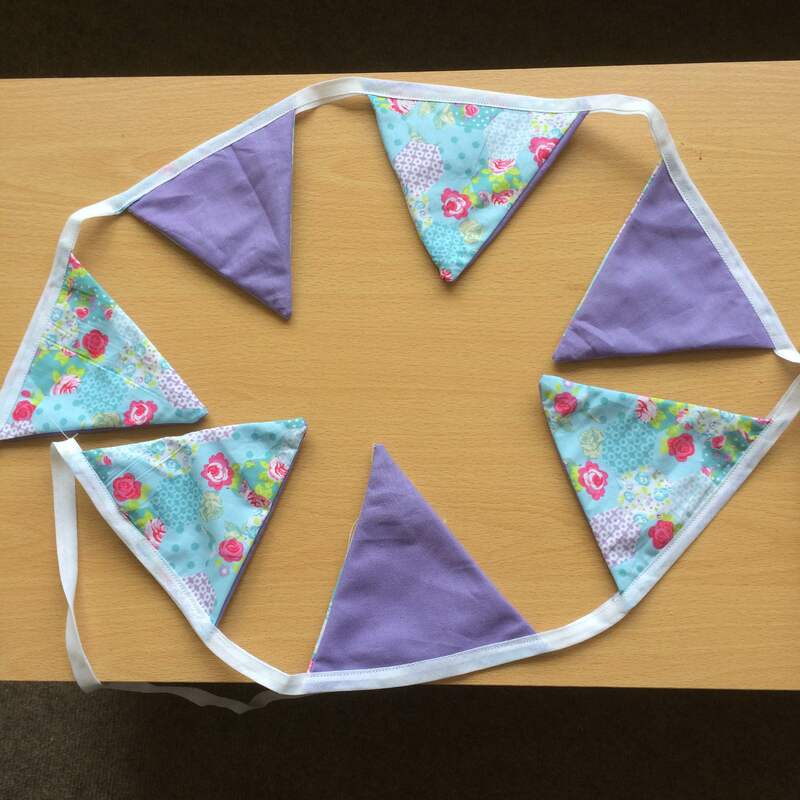 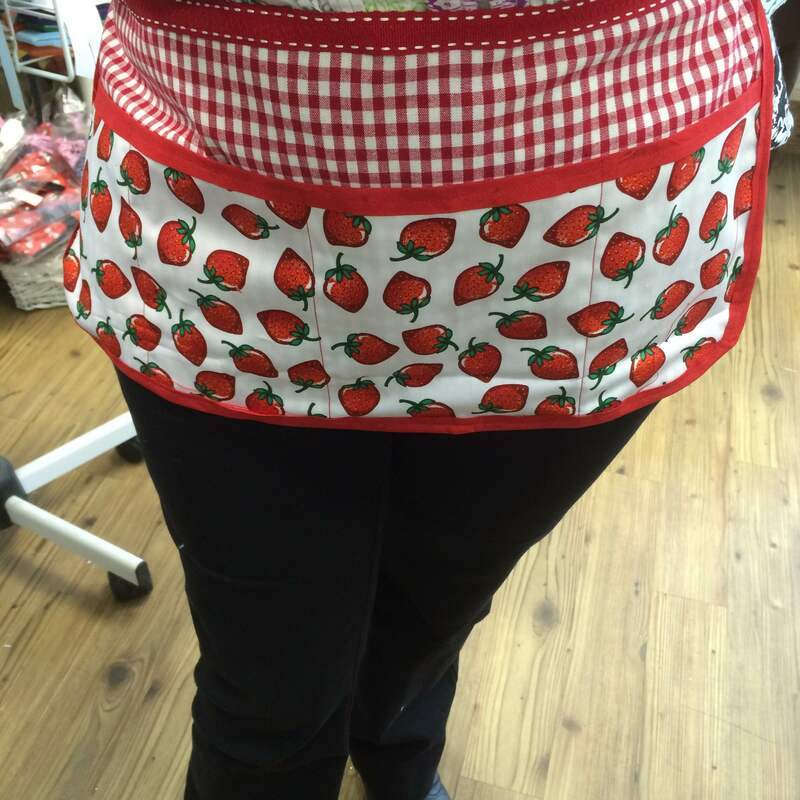 I managed to fit in a little bit f quilting time…..
And this week we carry on with our “I Made That” Campaign with Bows, Bows & Bows. 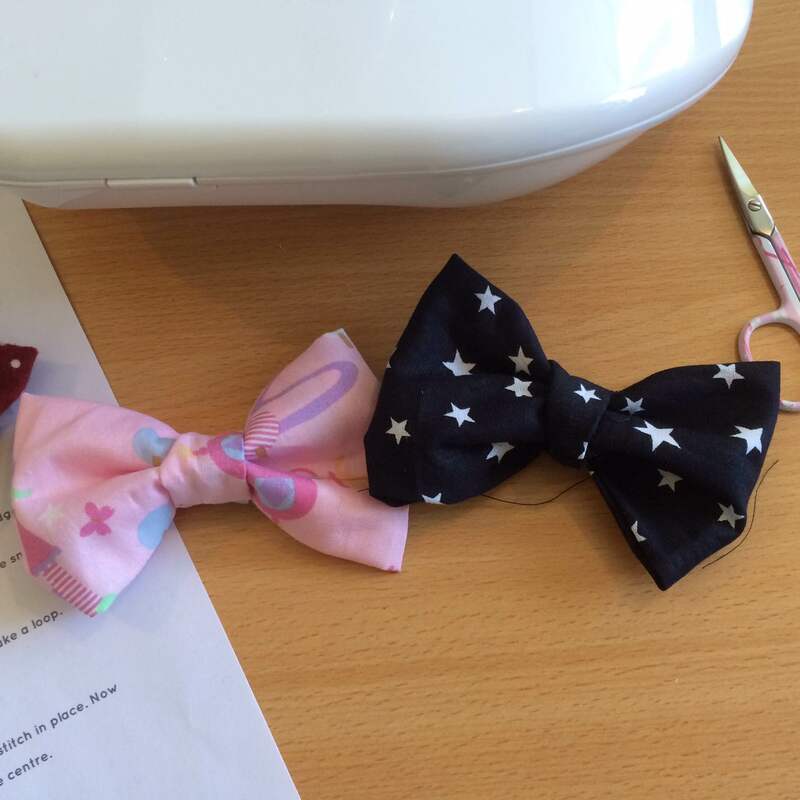 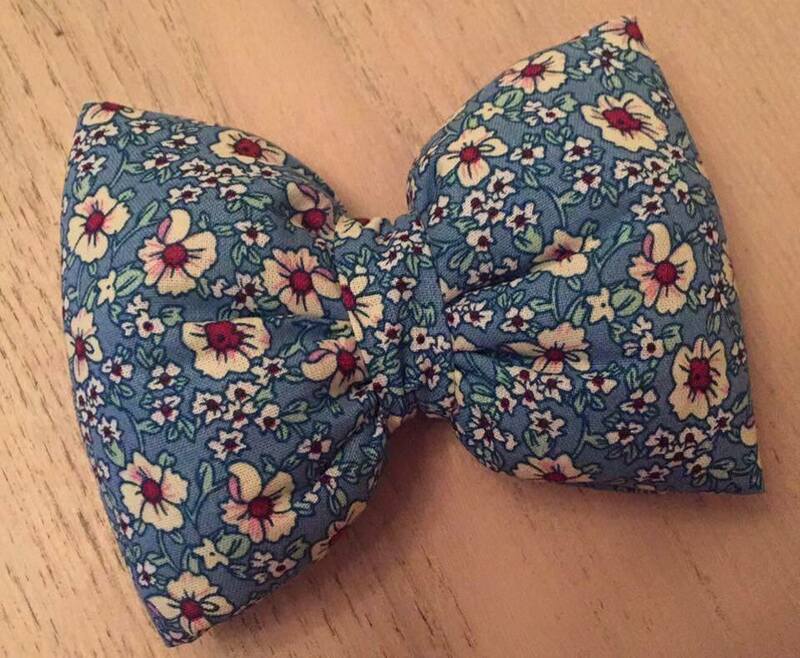 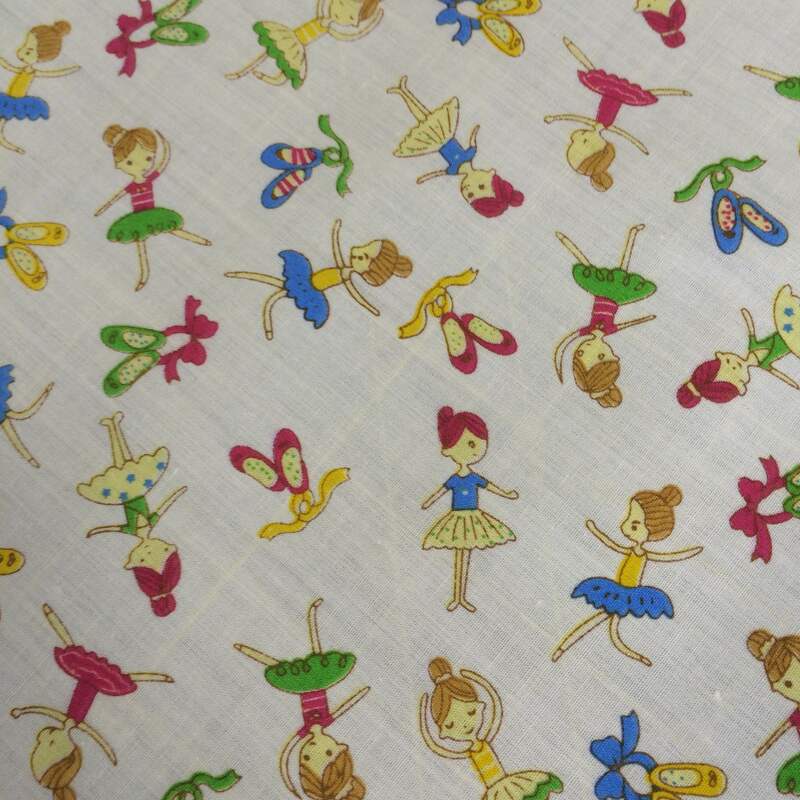 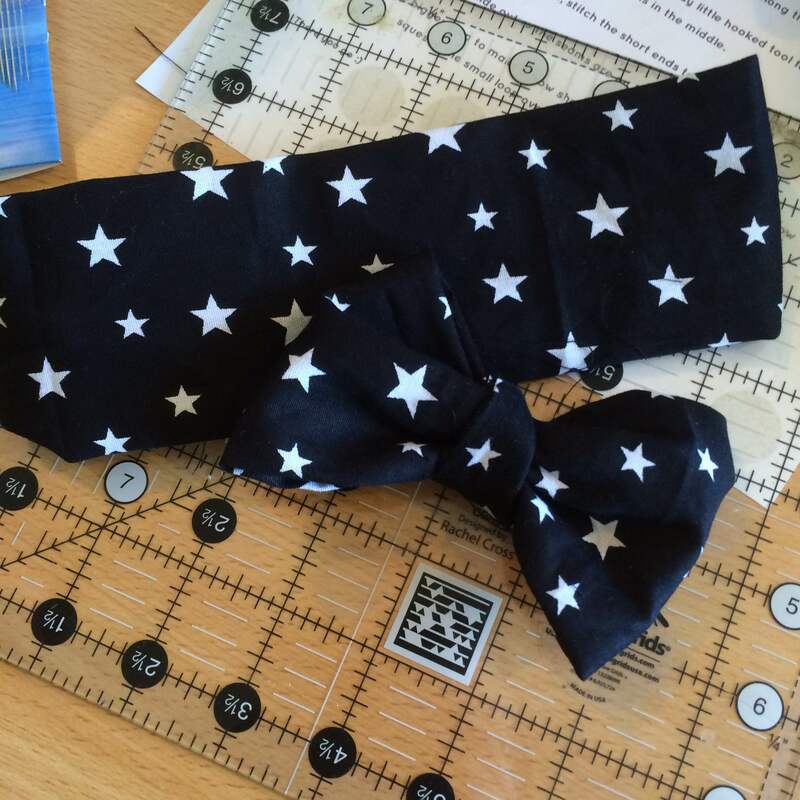 beautiful bows for adults and children. 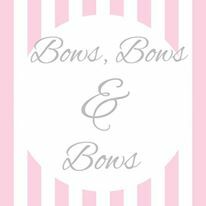 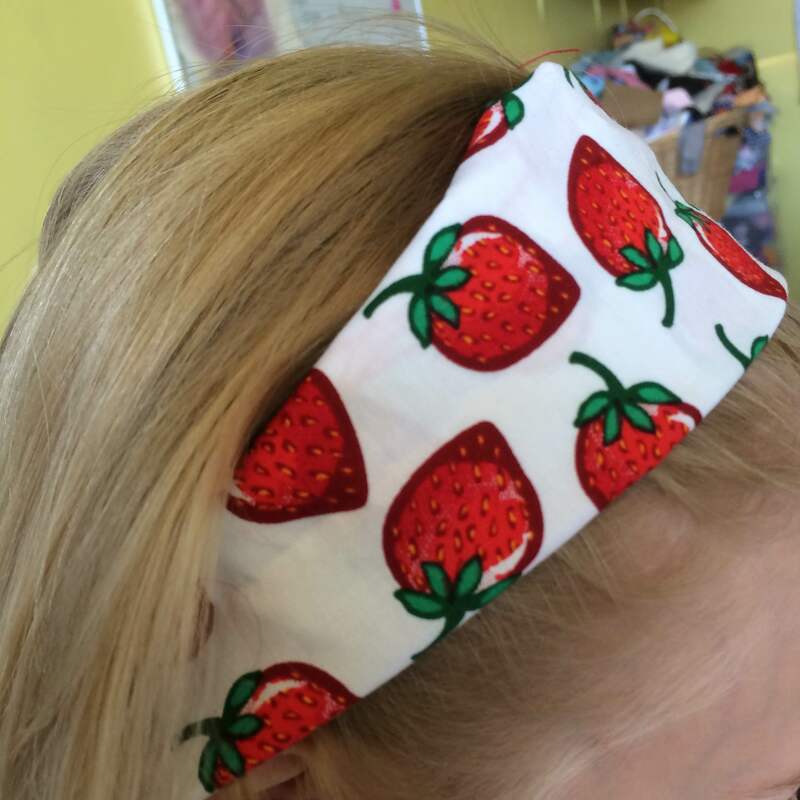 As quite a new business her Facebook page has loads of followers but as always we could do with even more likes so pop over to Bows, bows & Bows and take a look. 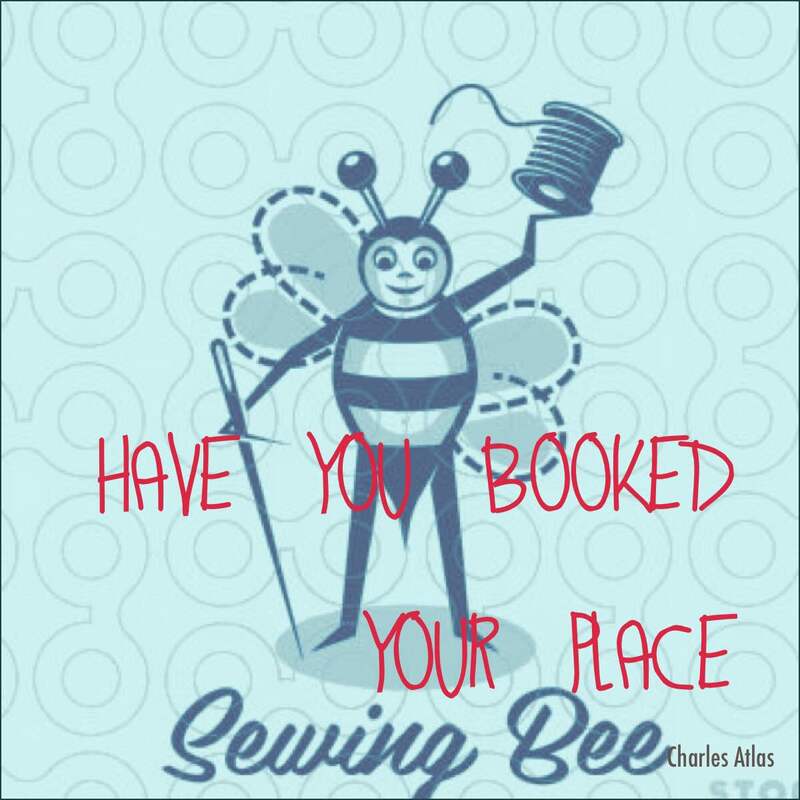 One last thing…….I’ve had two spaces become available on the Sewing Bee…..please contact me if your interested. 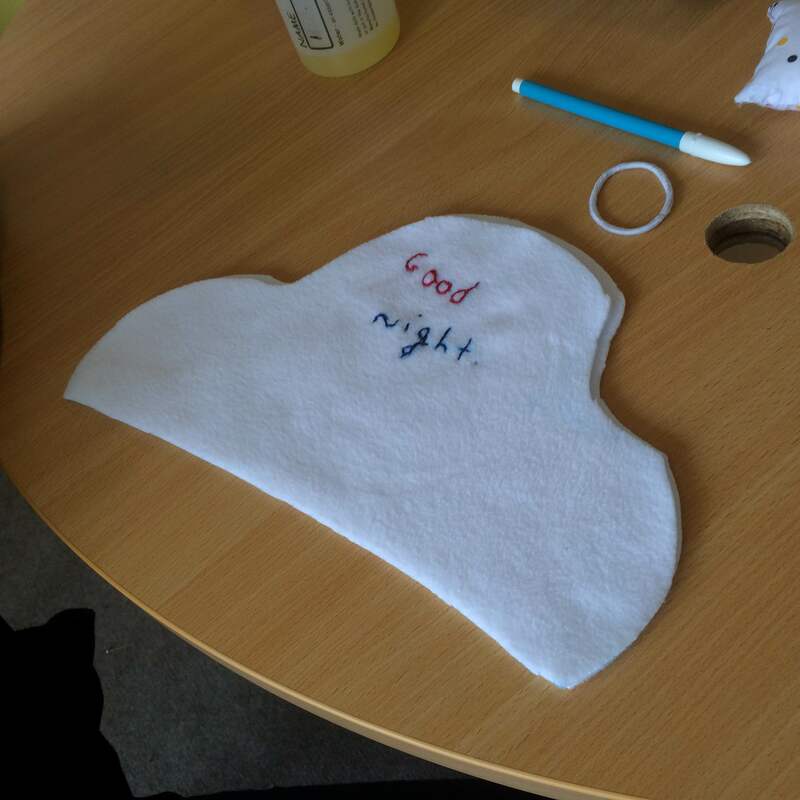 And we will see you next week…….hopefully better weather. 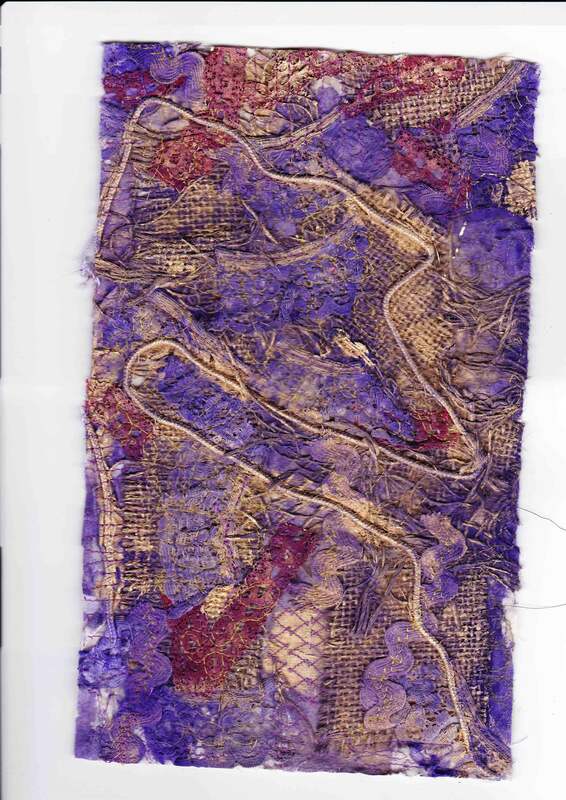 Thank you for all your support and lovely comments about the new website. 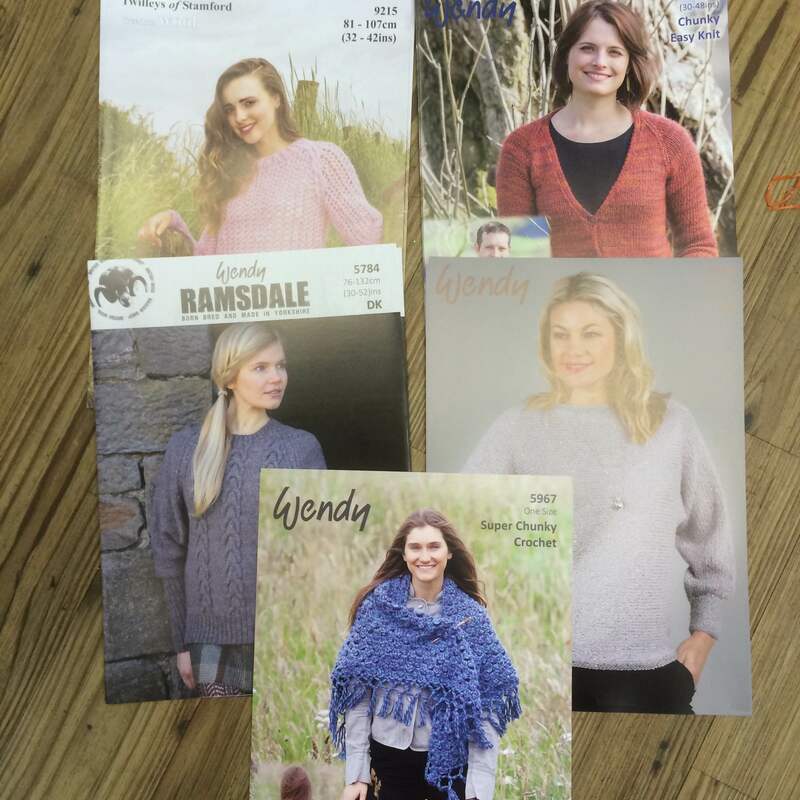 Ami, David, Sylvia & Glyn. 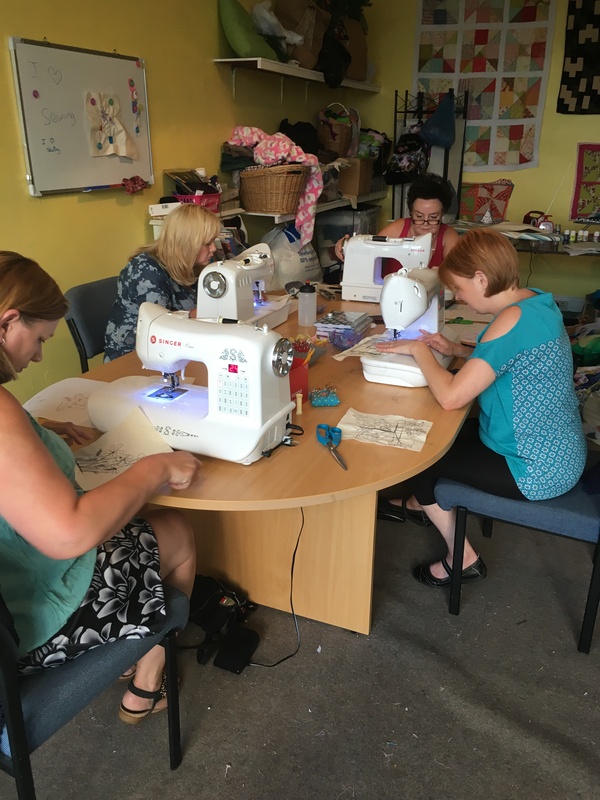 This is a weekly club which will run on a Saturday. 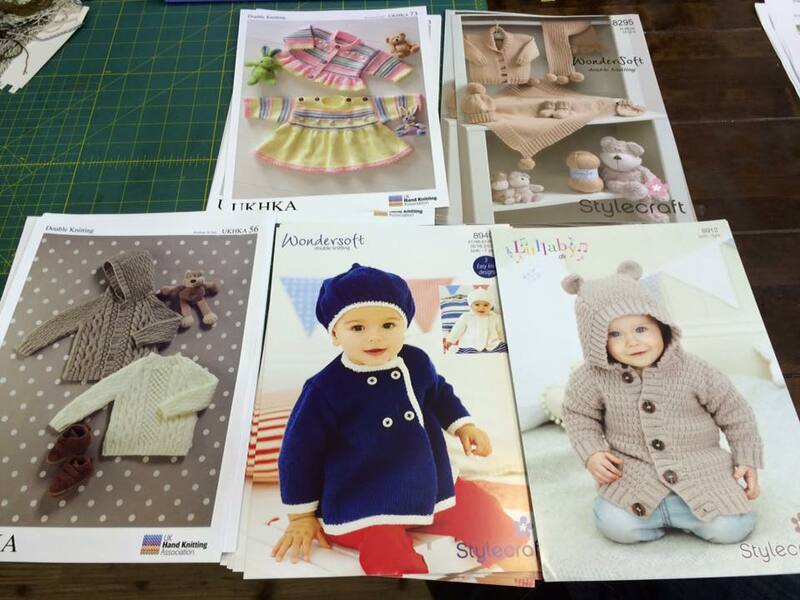 We have a few new workshops that have been announced…..
and last but by no means least ….. 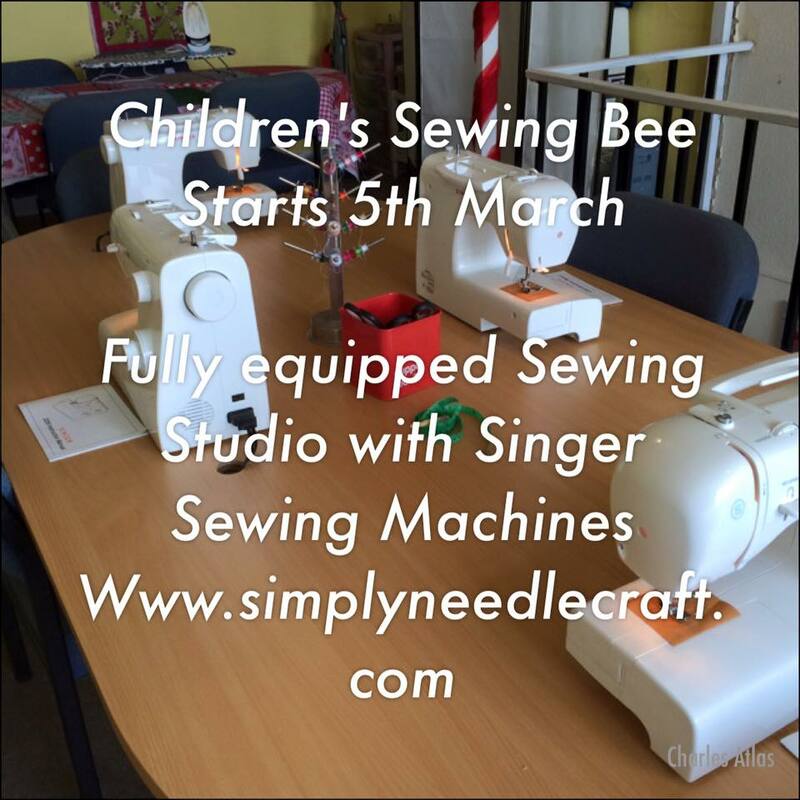 Anyway that it for another week, we have so much going on in the pipeline with work shops, classes and the children’s sewing bee. 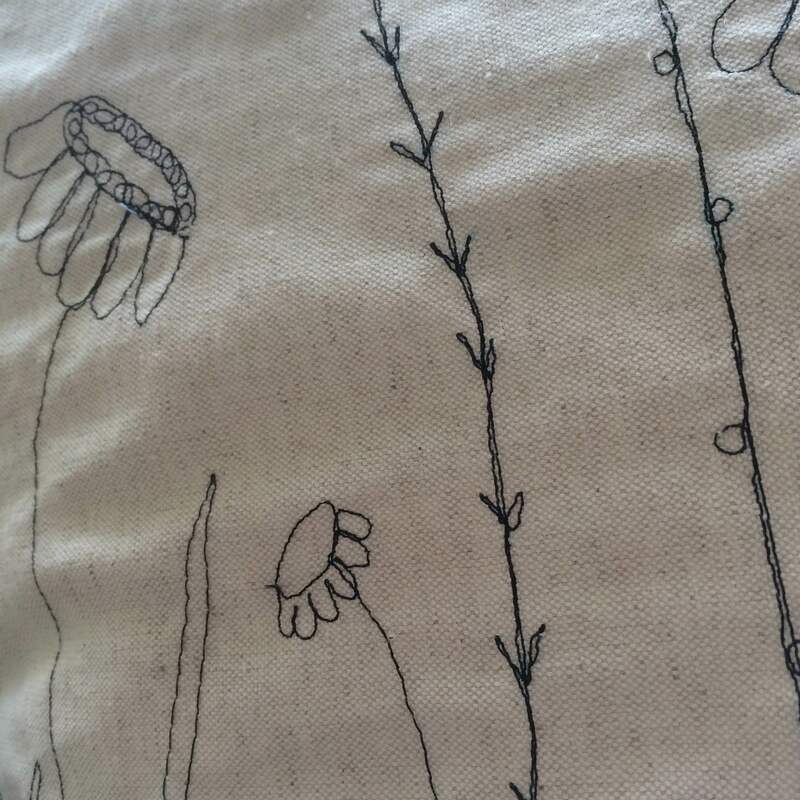 Hopefully I’ll be able to give you lots more to look forward to in the next couple of weeks. 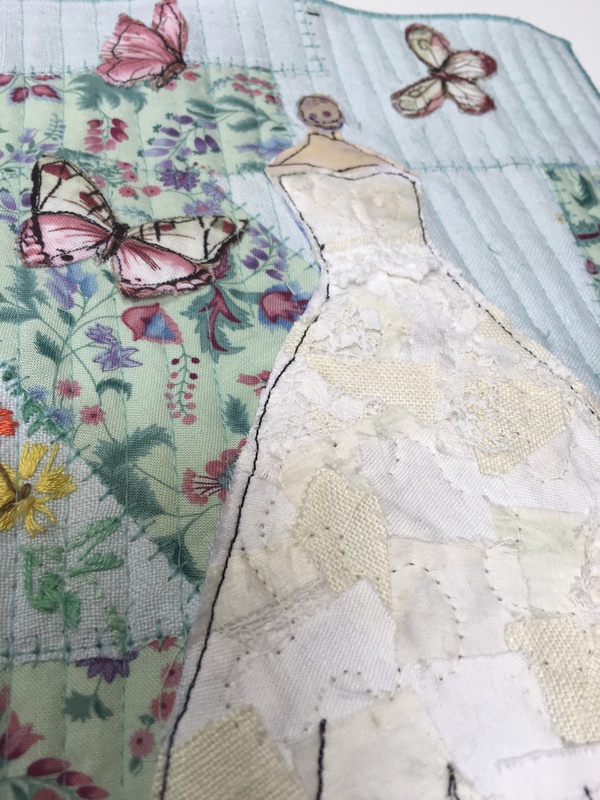 But for now……Thanks for reading, have a lovely weekend and thank you for all of your support. 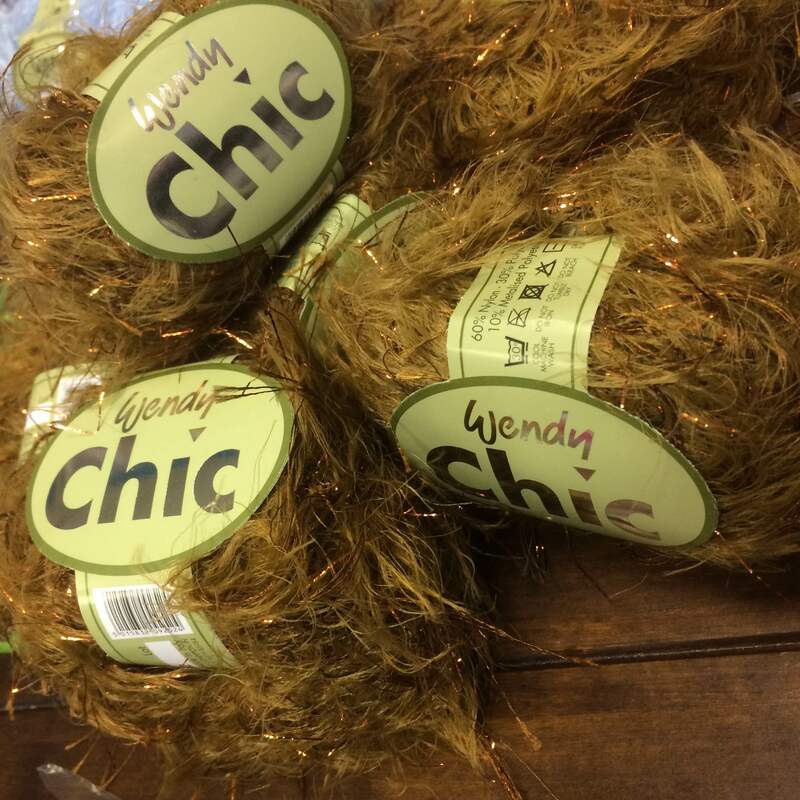 Now its this time of year that I love…..(people think I’m mad). 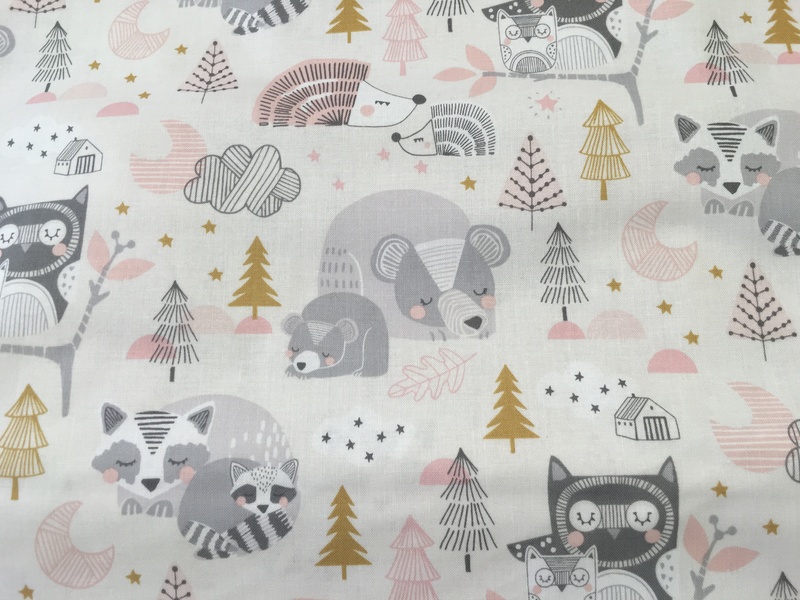 I love the cold frosty mornings, dark cosy nights, hot chocolate, bonfire night, snow, being cosy and of course Christmas. 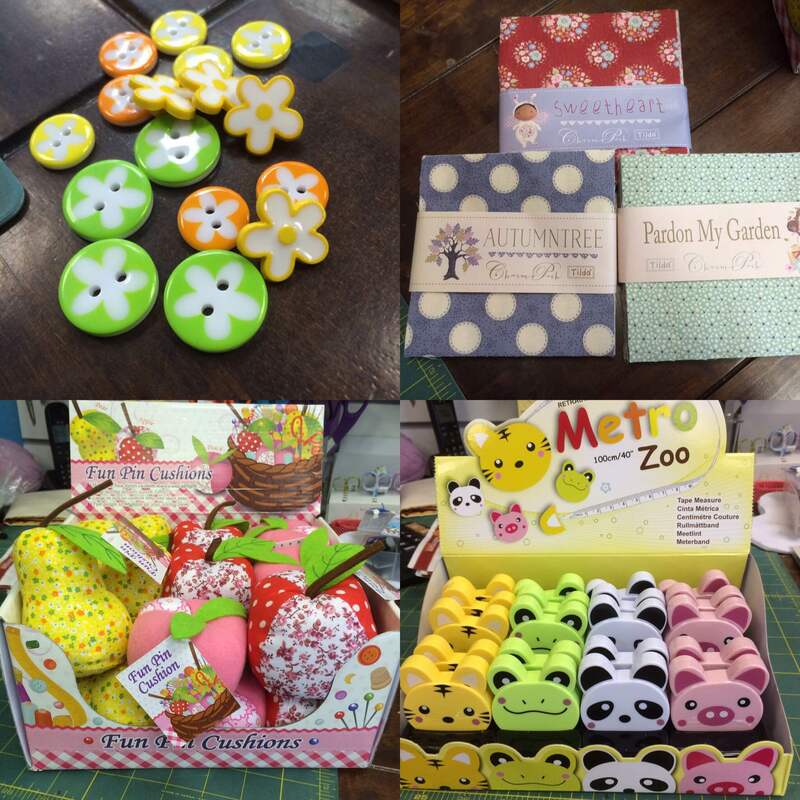 But this the perfect time of year for crafting and you lot have definitely proved it this week both in the Haberdashery and online. 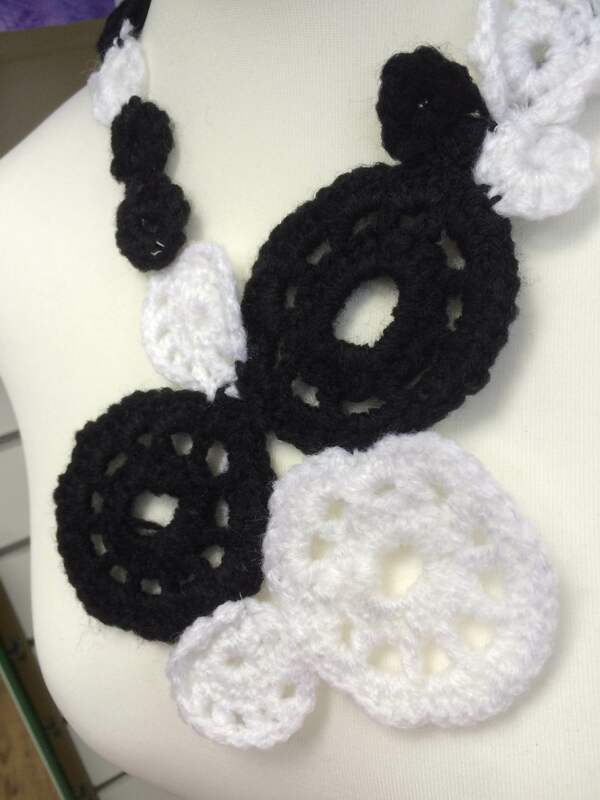 Lets start with this weeks discounts. 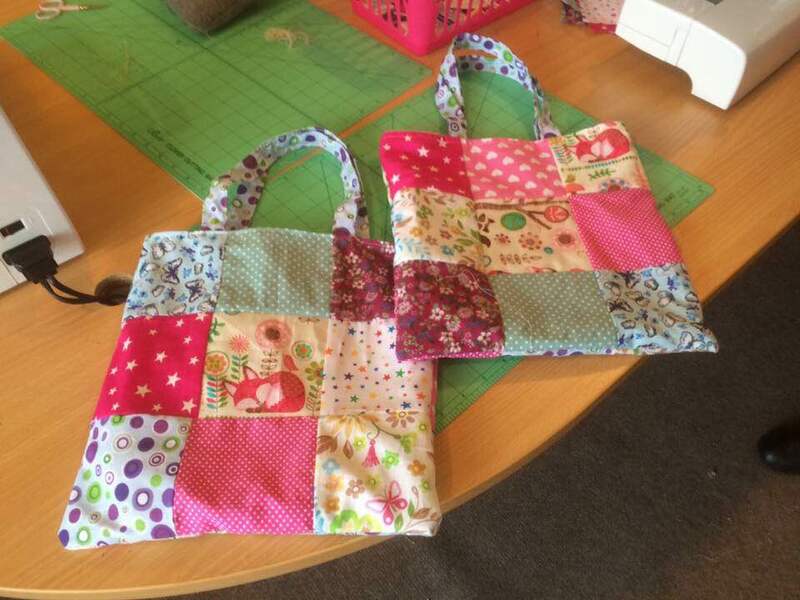 As you are aware we have reduced our price on our sewing classes right up until the end of the year. 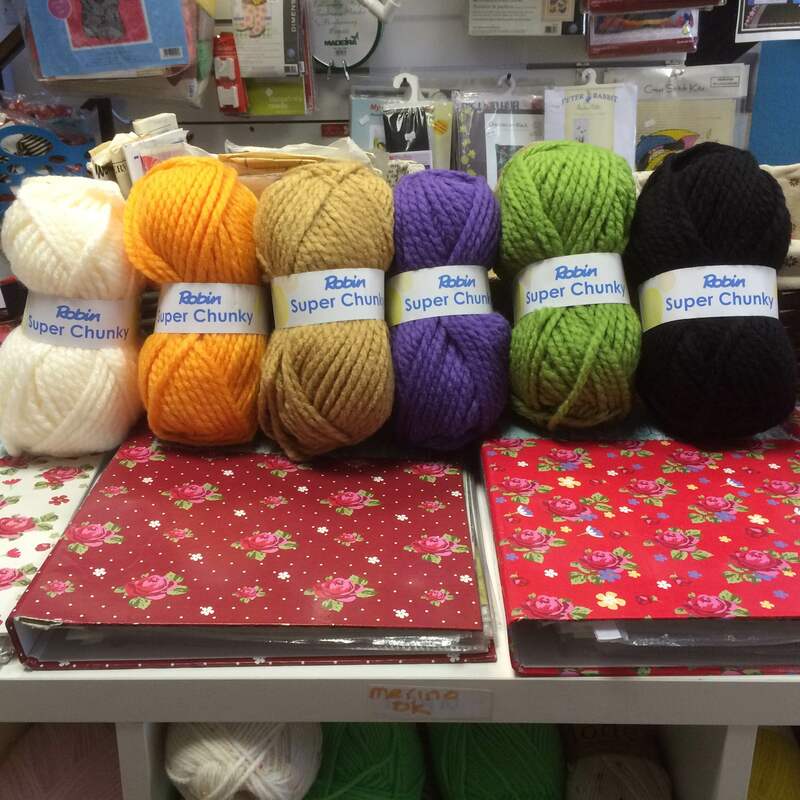 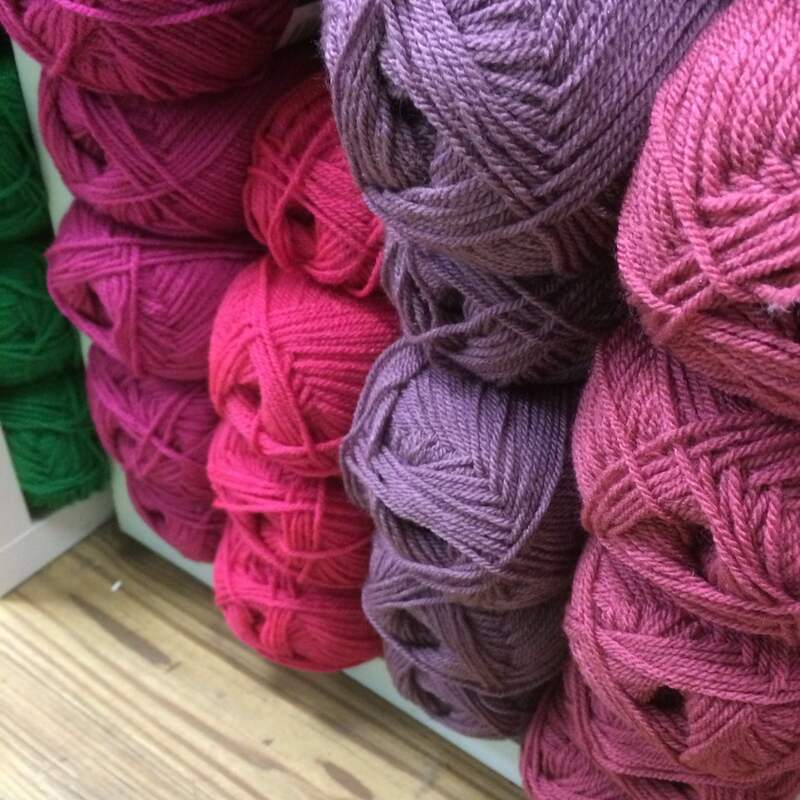 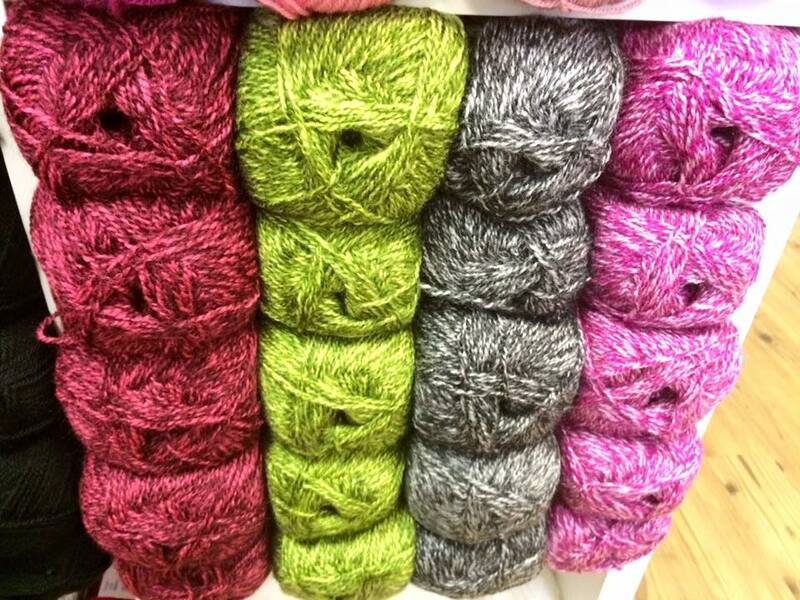 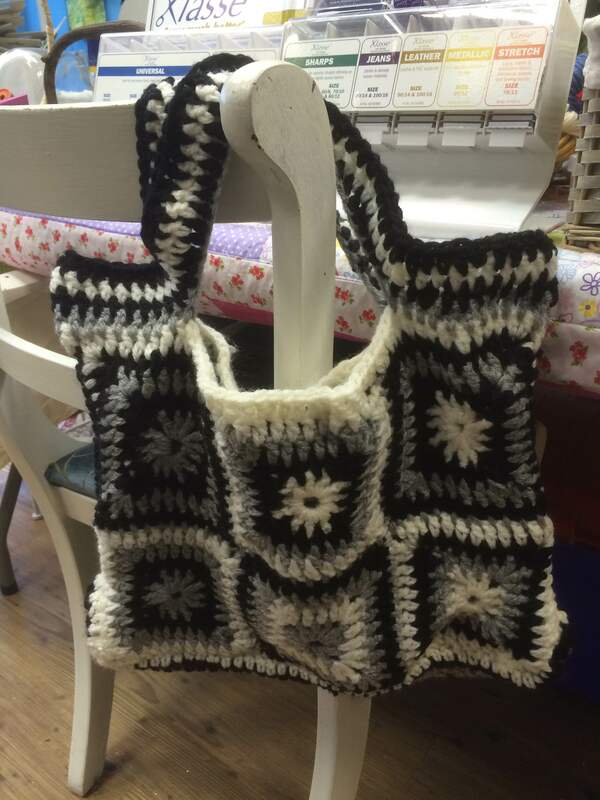 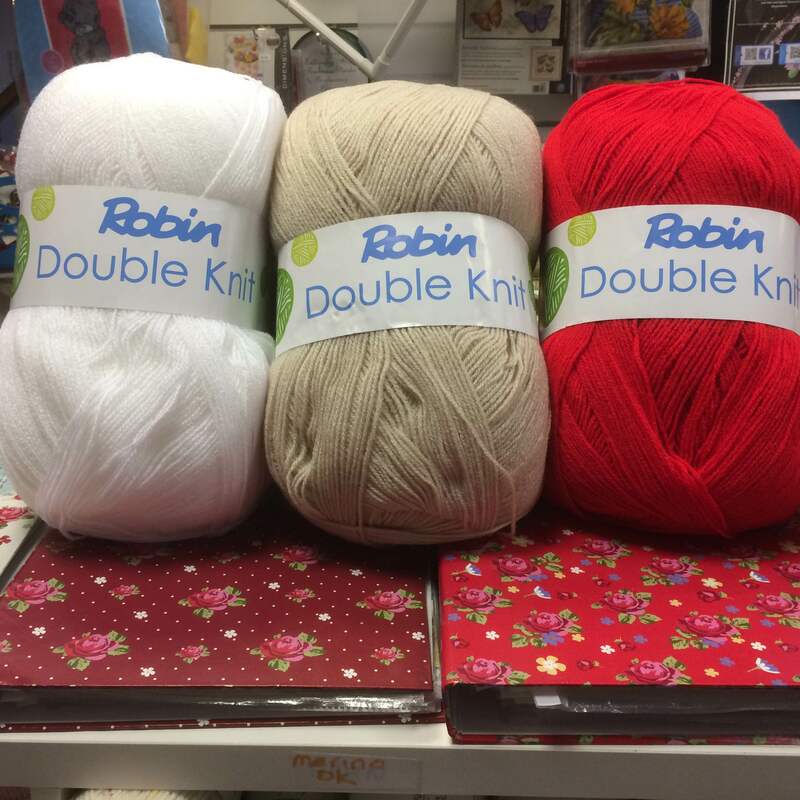 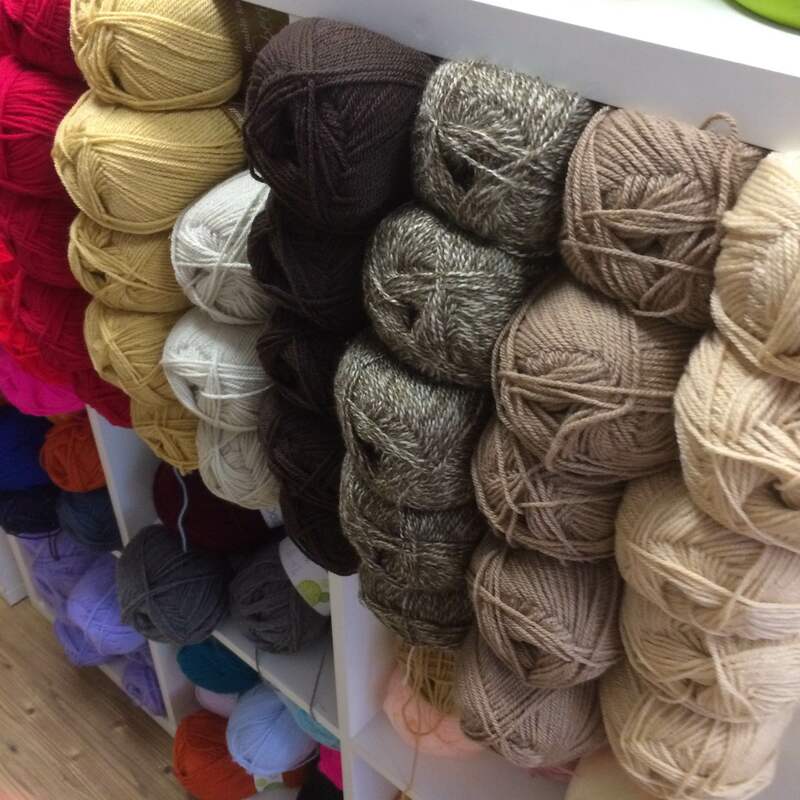 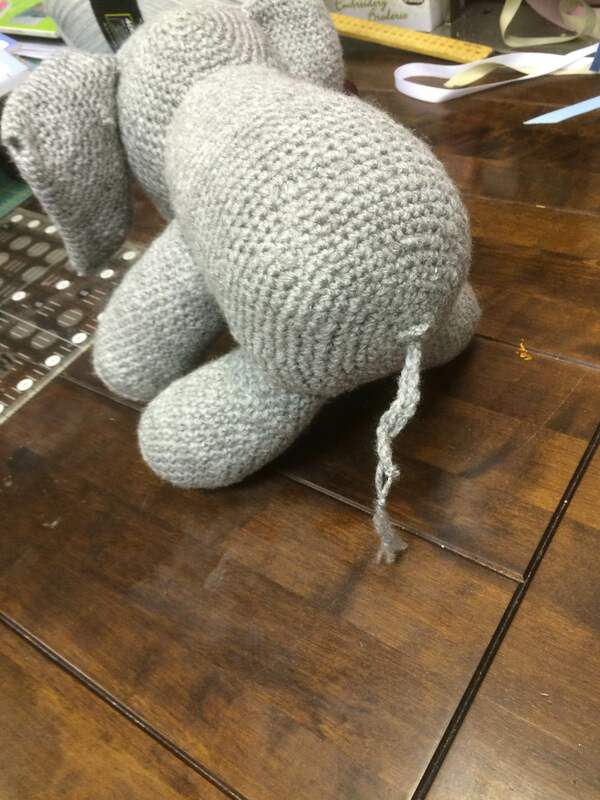 So now its time to reduce our Knitting & Crochet Workshops. 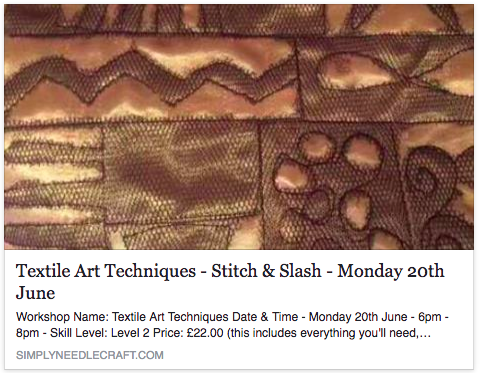 Please note – all of our workshops are on a first come first serve basis, the workshops are booking up quickly. 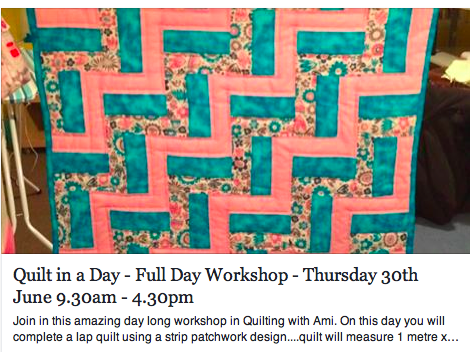 If the workshop you are interested is booked up we do have a waiting list. 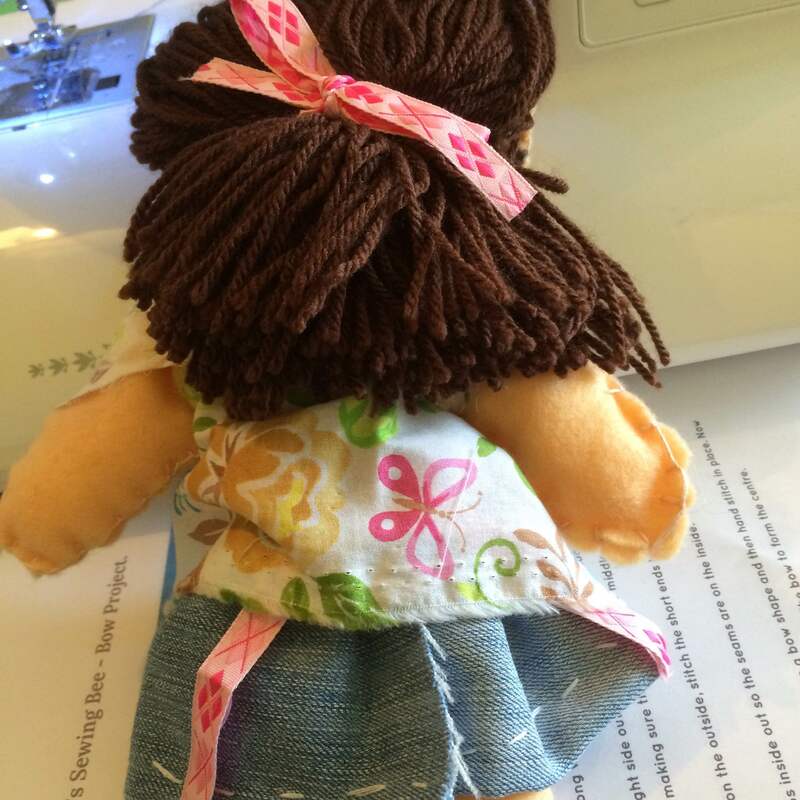 You just email to pop me a quick email with your details and I will add you to our list. 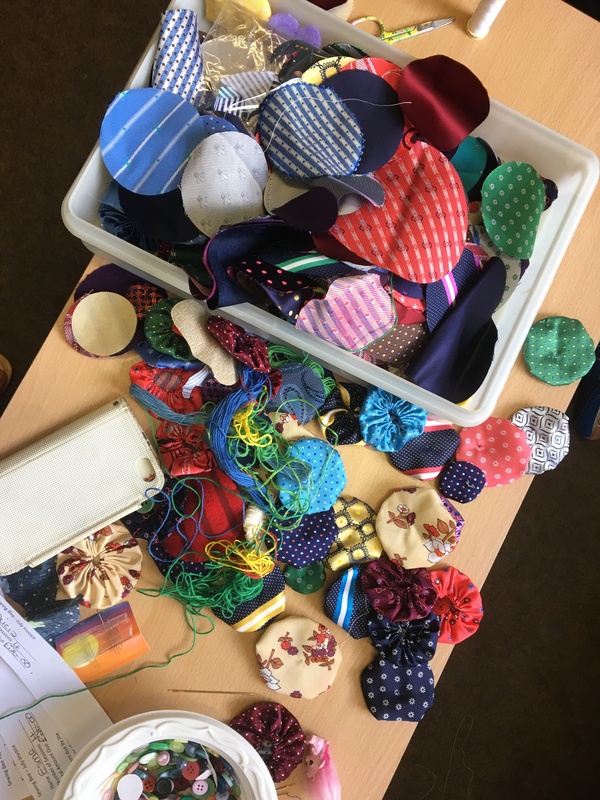 And lastly, thank to everyone that has donated Christmas Decorations so far, we still have a month to go, so please keep them coming…. 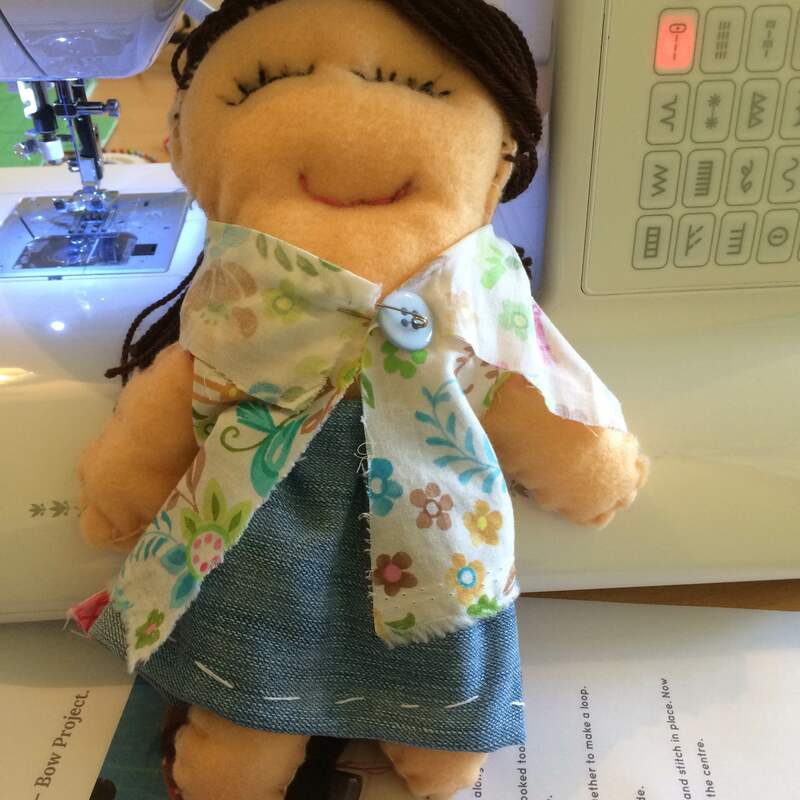 Thank you all for your support, it’s so over whelming to have your custom and to see your lovely makes, you are so talented. 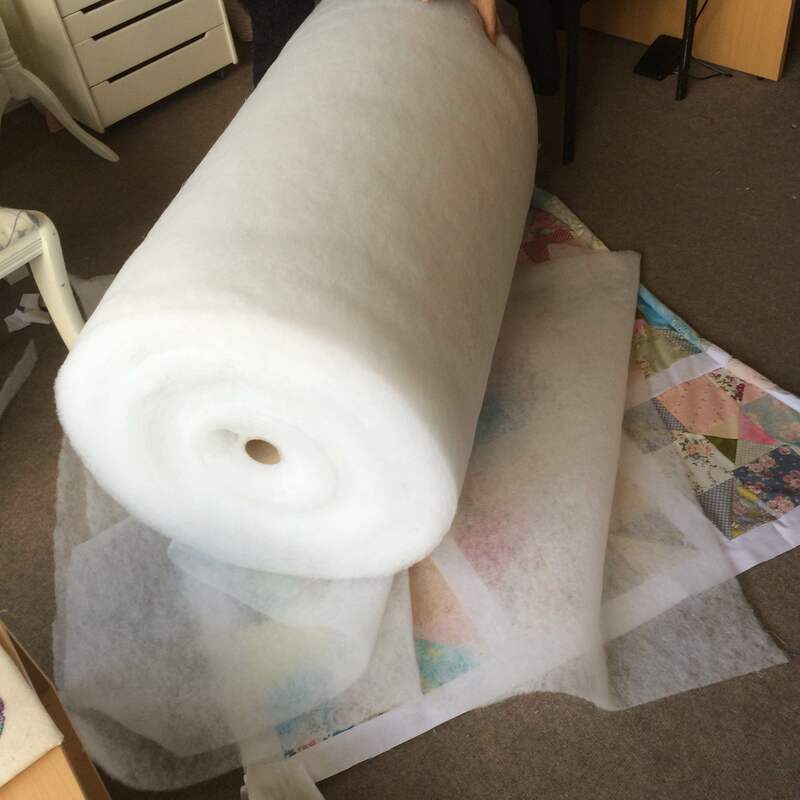 Next week – hopefully the final delivery will turn up, fingers crossed. 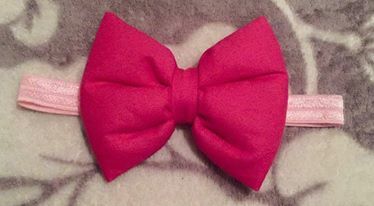 Thanks for reading and following. 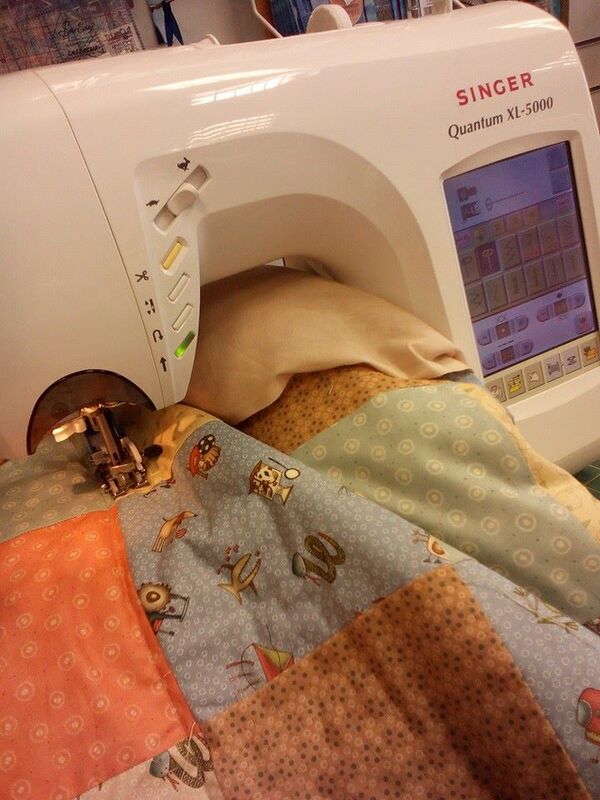 Don’t forget to change your clocks tonight. 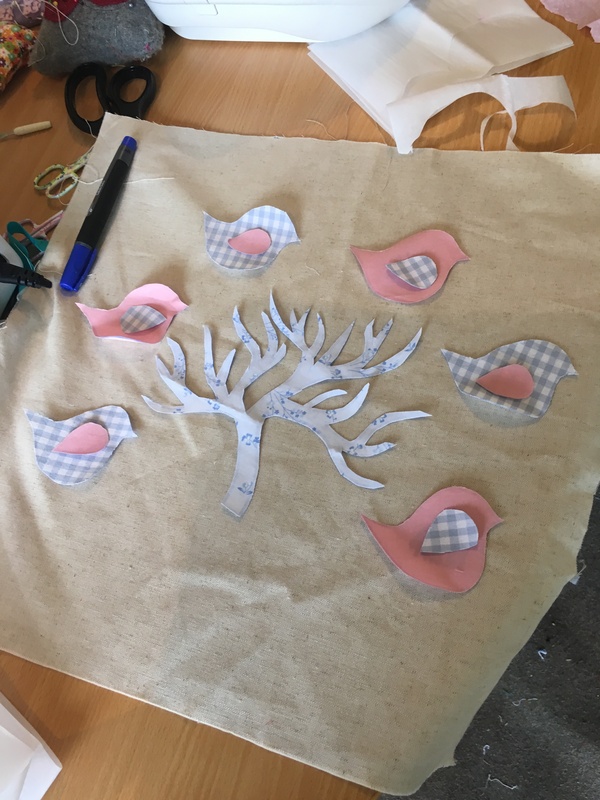 Mother has been busy preparing for her Chistmas decorations and bunting workshops (still a couple of places available, please book via the website). 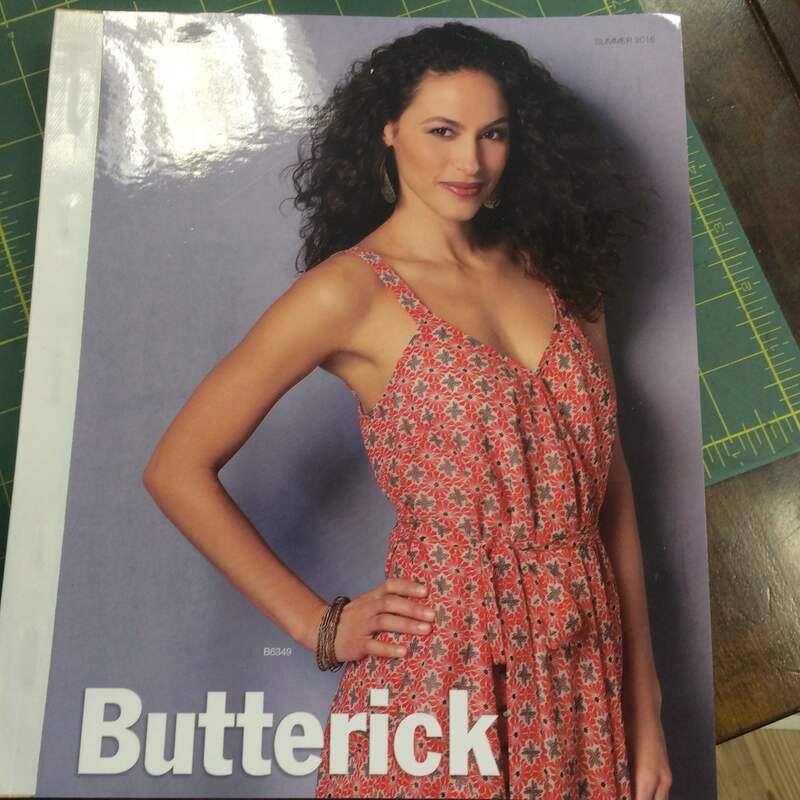 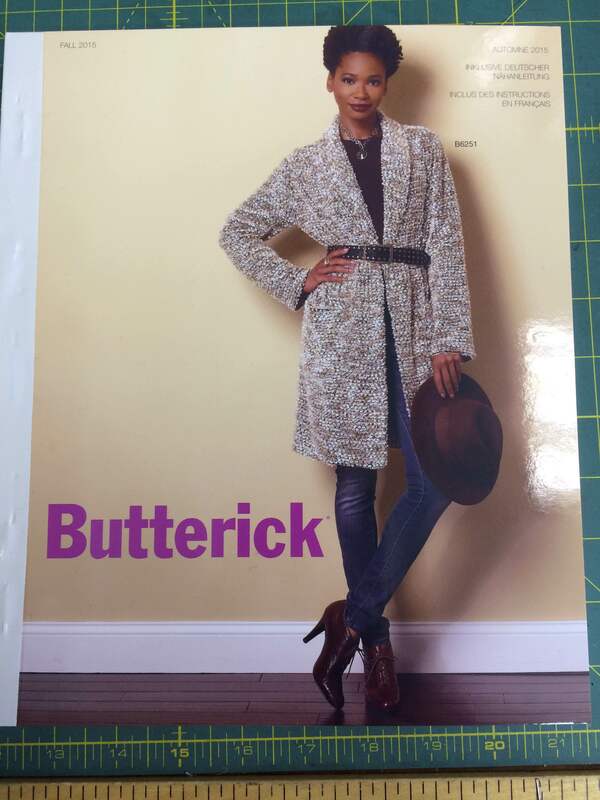 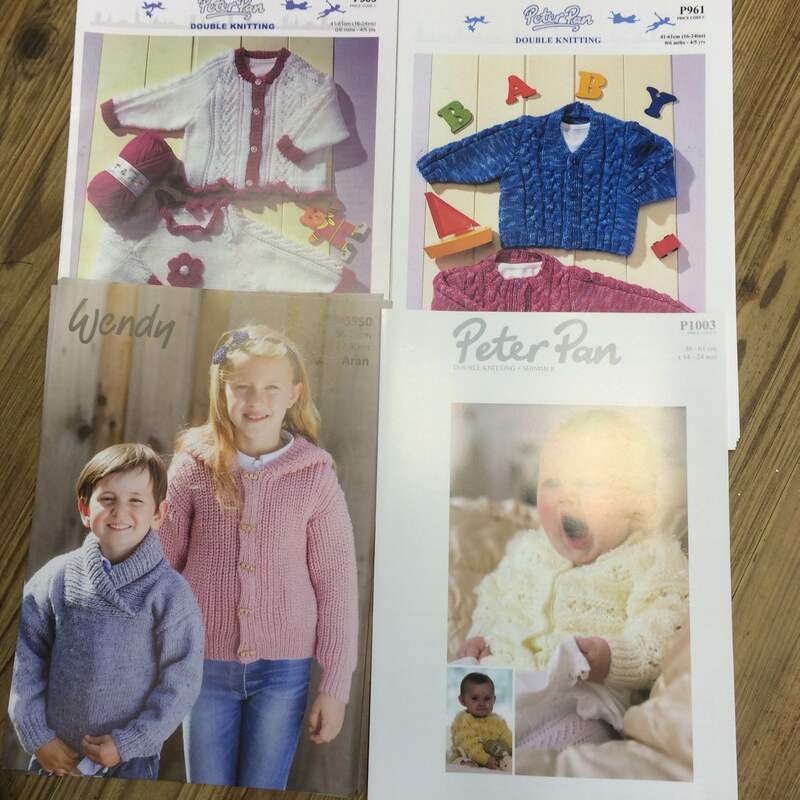 On Thursday this week the new Butterick catalogue came along with a brand new Autumn collection. 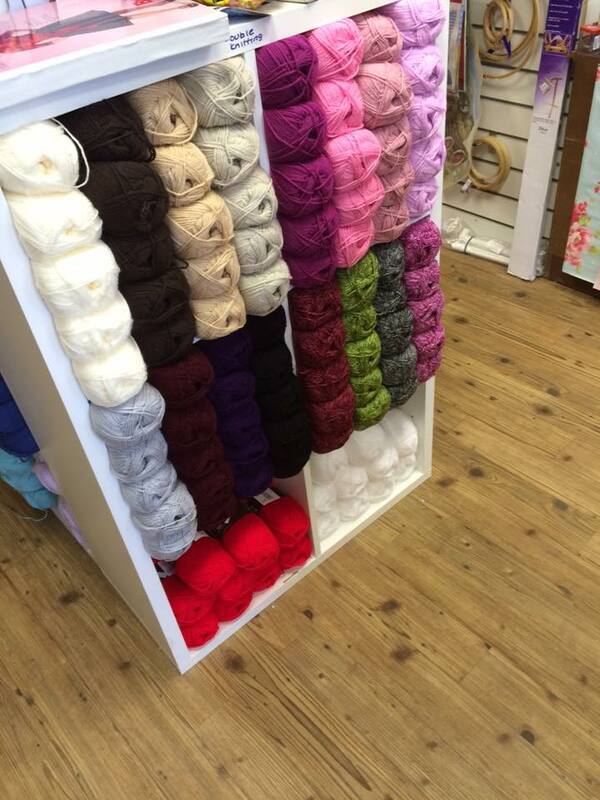 There’s lots of choice and sizes 8 – 24 in stock so come and have a browse next time your passing. 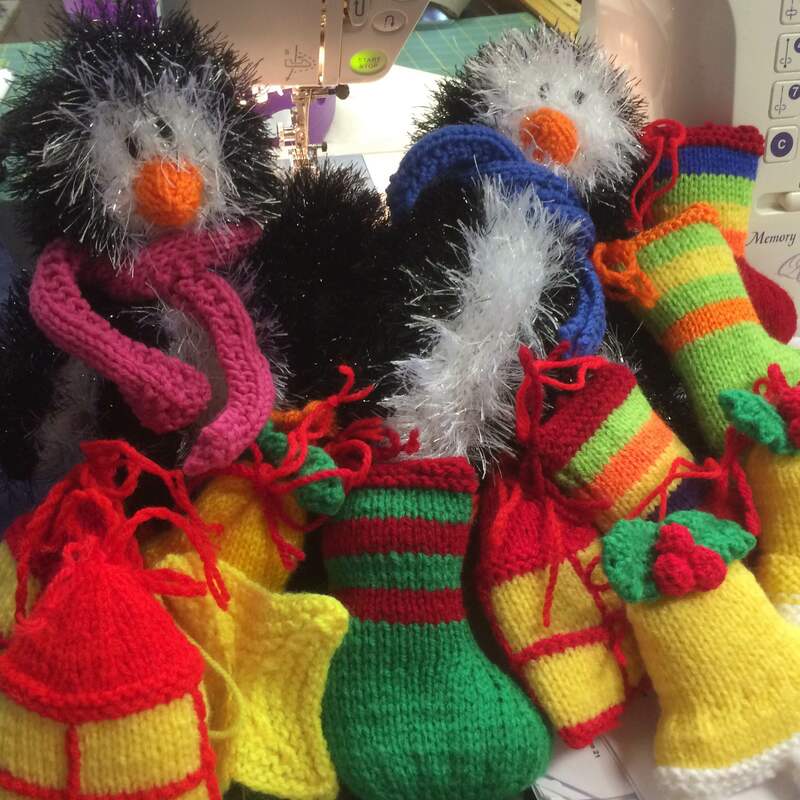 We’ve had some fab Christmas decoration donations this week for our Handmade Chrsitmas Rainbows Appeal……Please remember all donations have to be in by the 29th November so keep them coming, lets smash our target. 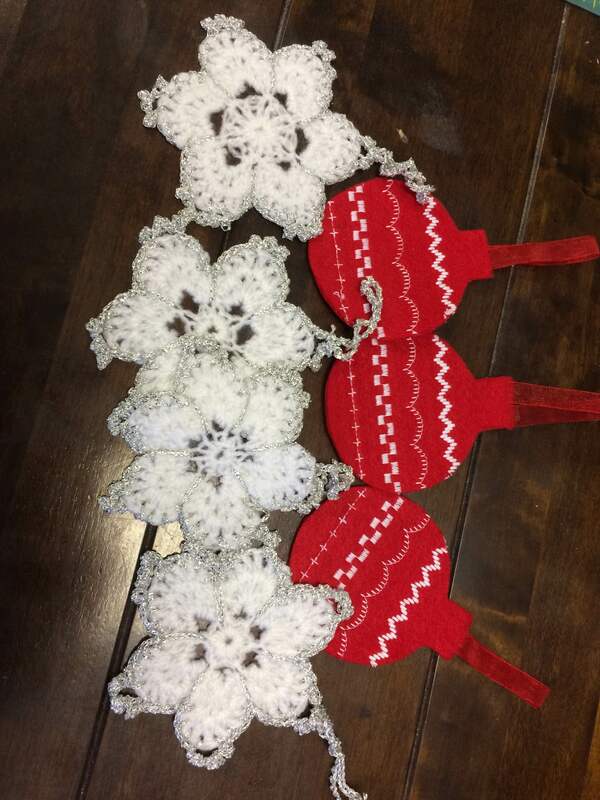 Thank you to Sue Pole for her gorgeous decorations. 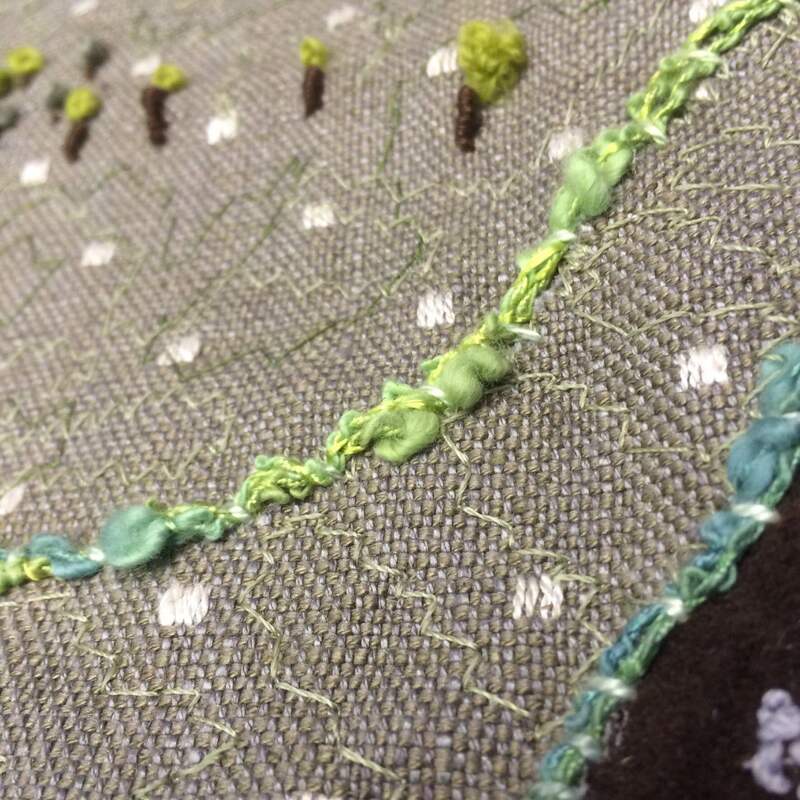 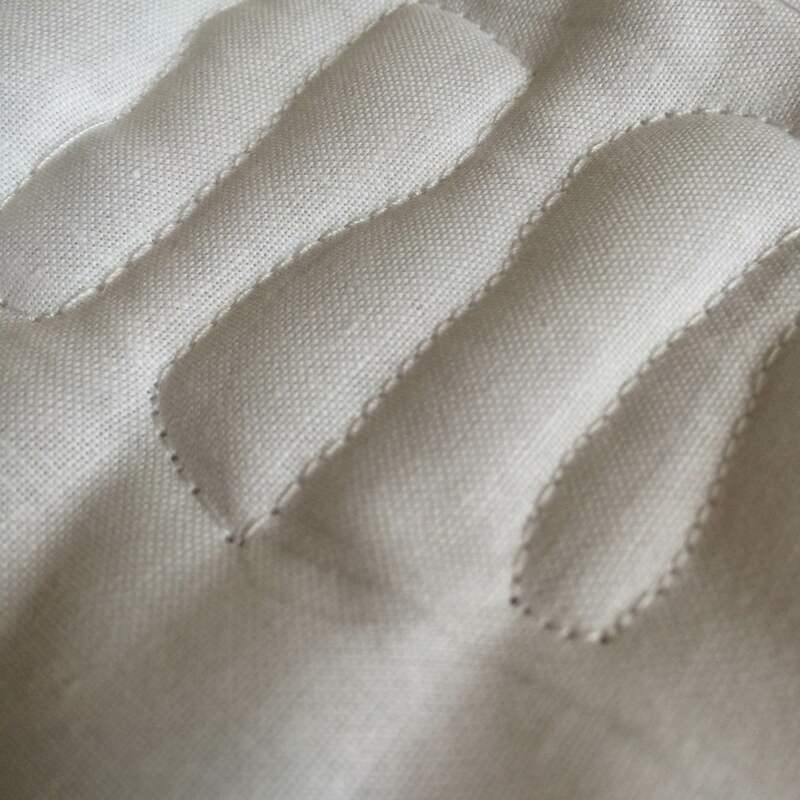 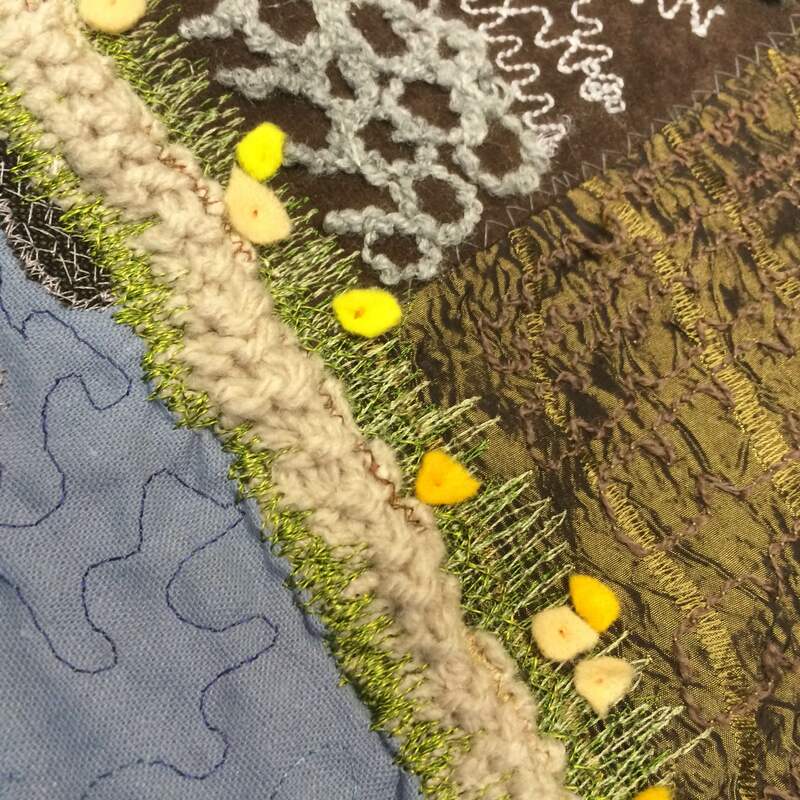 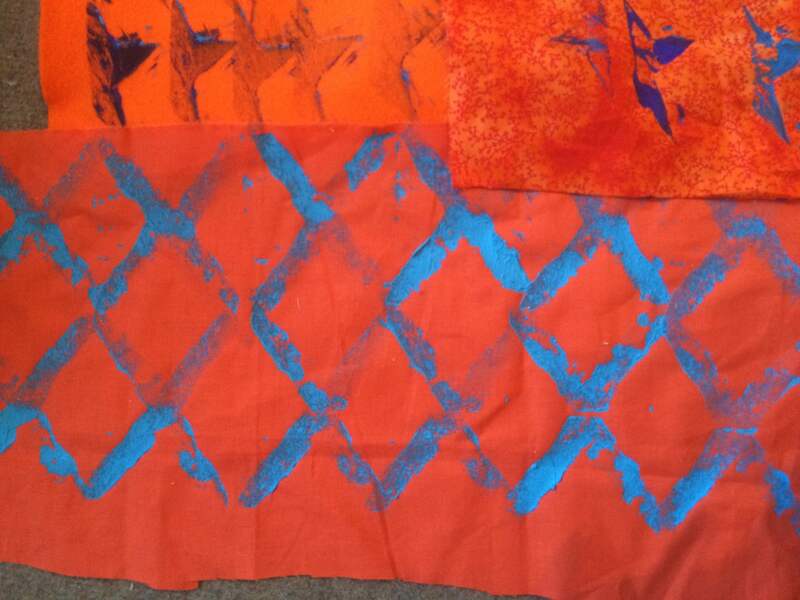 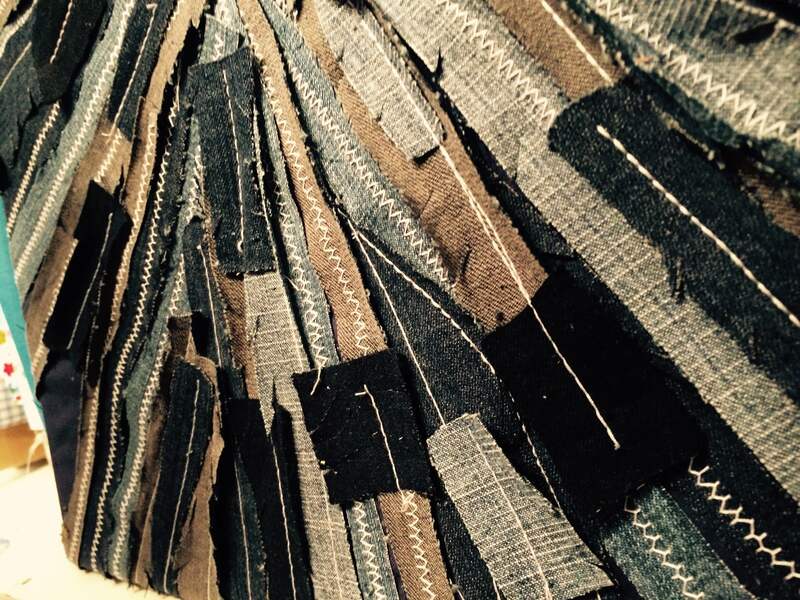 This week I’ve been researching and stitching textures as part of my city & Guilds. 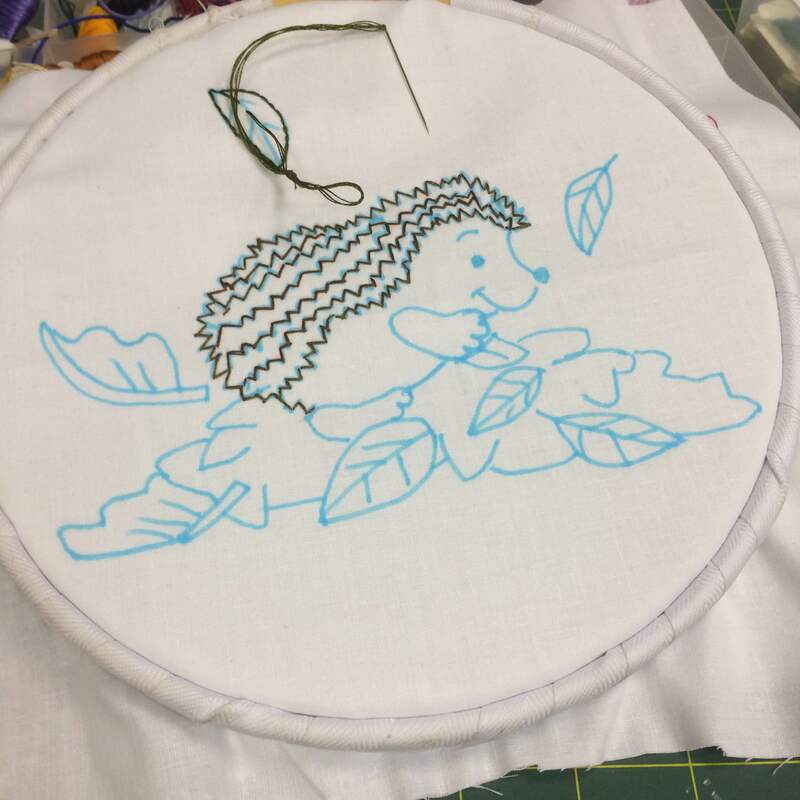 I’m well on my way to finishing my 2nd module (only one more to do) so I’m keeping my fingers crossed that I can finish it by the end of the year. 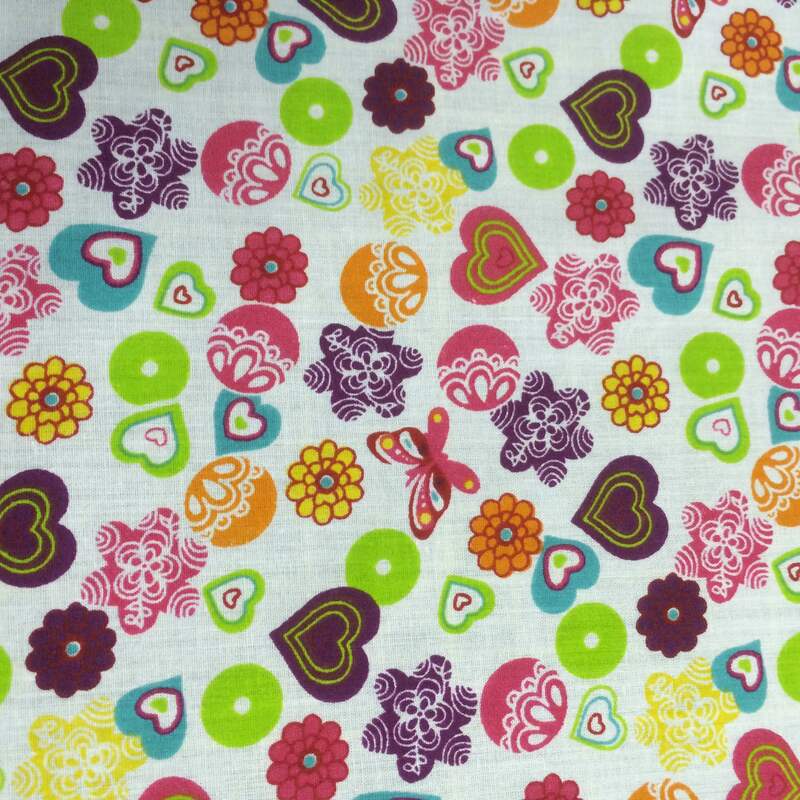 Anyway, have a fab weekend looks like the weather is going to be good for us here in the Midlands. 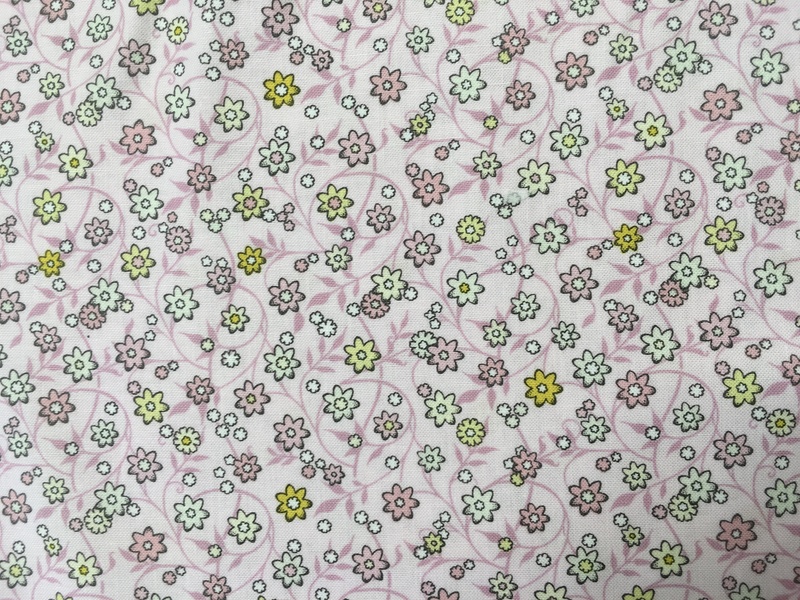 Thank you for all your continued support and recommendations. 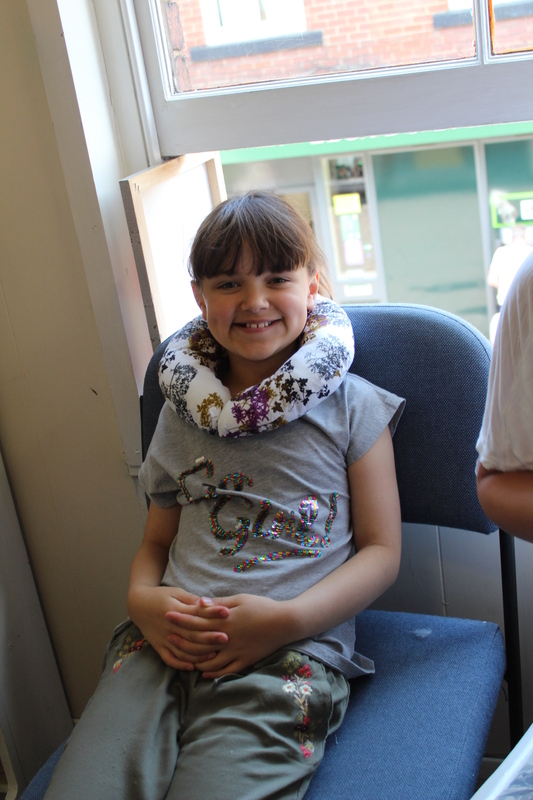 We will see you bright-eyed and bushy-tailed on Monday morning.